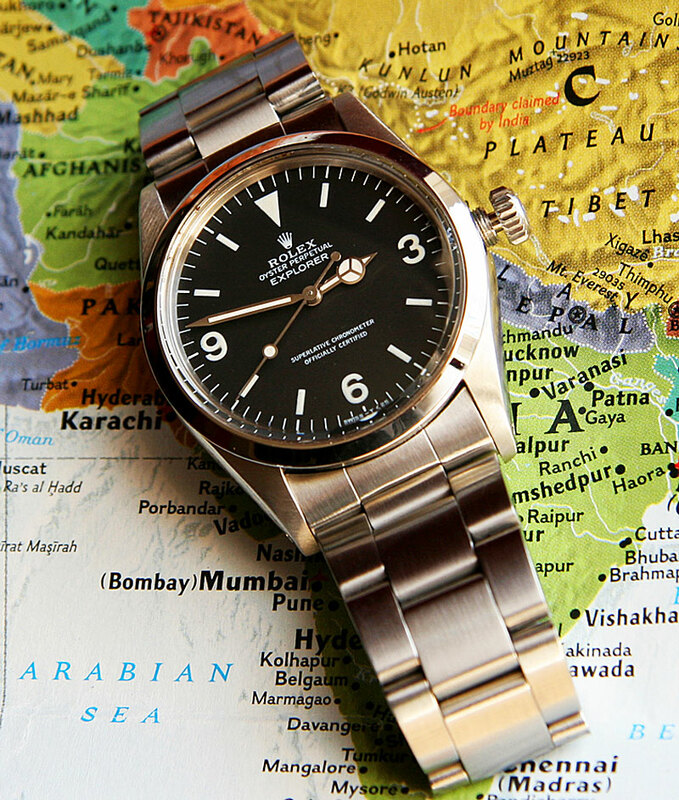 Have you ever wondered where Rolex came from, or what makes it tick? 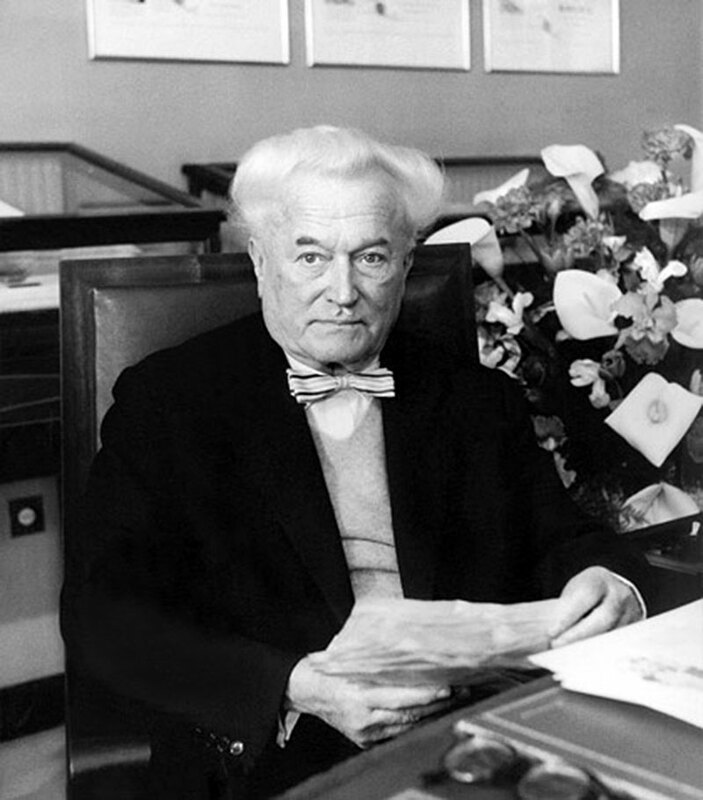 Hans Wilsdorf exited the world we share more than a half-century ago, or did he? Perhaps he is more alive today than ever? If you have ever read any of my super-detailed Rolex history stories, you know I don't just publish a bunch of pretty pictures with text. Instead, I take you back in time in the Rolex time machine and do my best to place you in the catbird seat so you may live through the events, and that is exactly what I have done with this incredible story. To the best of my ability, I am attempting to show you things from Hans Wilsdorf's perspective—in chronological order. This way you get to live through the whole experience and see what Hans Wilsdorf saw–first-hand. 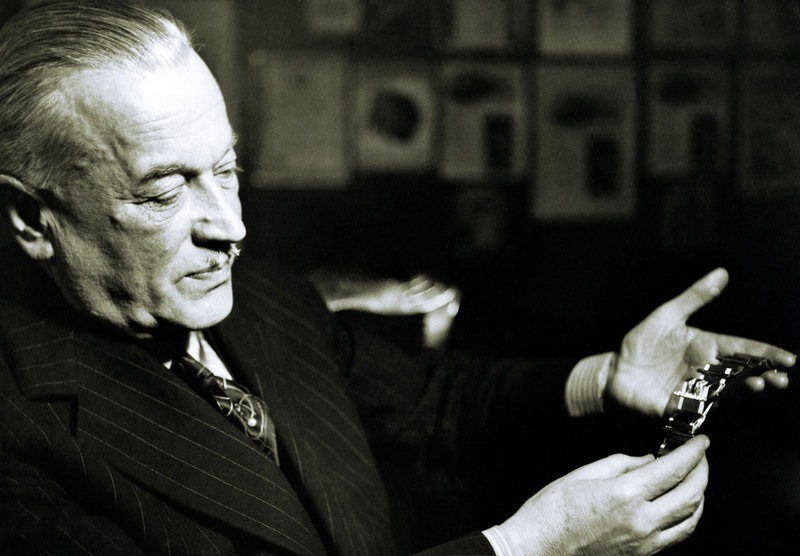 Despite the fact, Rolex is one of the most highly recognized brands on earth today, very little is known or has been published on the history of its highly driven, enigmatic and ultra-innovative founder, Hans Wilsdorf. 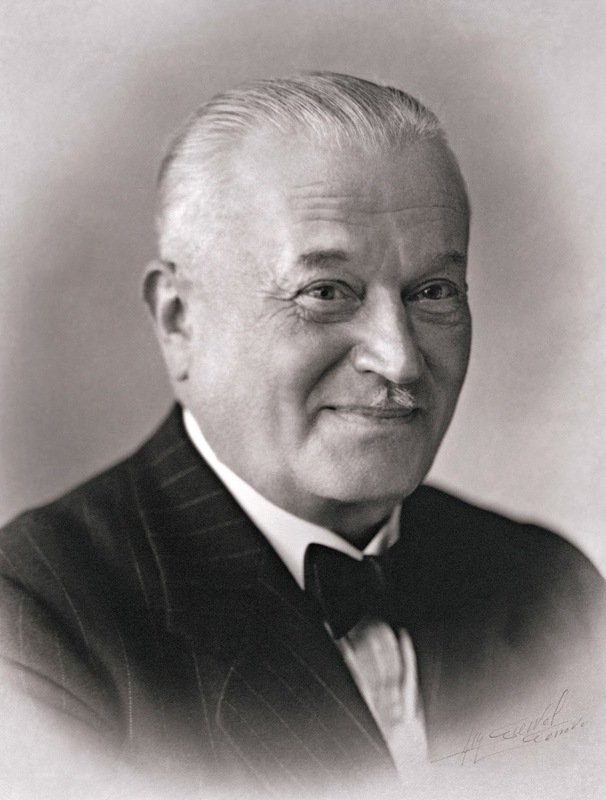 The man the world came to know as Hans Wilsdorf was born in 1881 with the birth-name of Hans Otto Wilhelm Wilsdorf. Hans Wilsdorf was a rugged individualist with an absolute commitment to excellence which remains today. Hans Wilsdorf had uncanny insight into strategic design and marketing and refused to compromise quality. Prior to writing this story, there were only three known photographs on the entire World Wide Web of Hans Wilsdorf, and one of them was exclusive to Jake's Rolex World. Not only were there very few photos, but, very little cohesive writing on Hans Wilsdorf's history? So much so, it really seemed as if Hans Wilsdorf never existed, or had become a ghost of sorts. This is particularly strange, since, while Hans Wilsdorf was alive, his name appeared on every piece of Rolex advertising and collateral material. So how and why did he disappear? Was it by design, or did time simply forget him? Somebody, once said, "History does not seem like history when you are living through it." It is possible time forgot Hans Wilsdorf, but on Jake's Rolex World I found that to be absolutely unacceptable for many, many reasons. The truth is, I am extremely curious to learn as much as I can about Hans Wilsdorf since his soul is in every Rolex ever made, including every new Rolex manufactured today. I believe this story will shed substantial light on the ghost of Hans Wilsdorf, and I hope to bring him back to life in all of his glory and magnificence. This story will walk you through the life and times of Hans Wilsdorf as accurately as can be done today, and give you, the reader, an uncanny perspective into what he saw and experienced as major milestones throughout the time of his life–from the genesis of Rolex, up through the development of the tool watch. This article contains the greatest number of photos ever published of Hans Wilsdorf, including, many, never before seen candid images of the man. The history of Rolex is the story of Man & Machine, and this story begins back at the very beginning, with the elusive historical figure and founder of Rolex, Hans Wilsdorf, who is pictured above as a handsome and distinguished young gentleman. If you think about it for a moment, watches were really the first computers. In other words, they computed the time, and before the iPhone; before the laptop; before the desktop; before video games; before the TV, radio, and car, mankind had the watch to fidget with and obsess over. 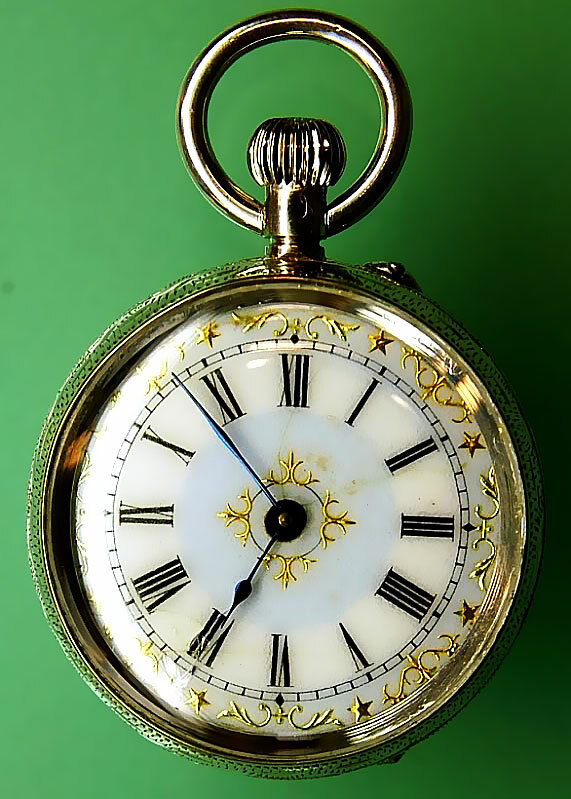 When I see people today passing the time by constantly pulling their iPhones and Android smartphones out of their pockets or purses to fidget with, I think about how men a hundred years ago, did the same thing with constantly pulling their pocket watches out of their vest watch pocket to constantly check, wind, stare at and fidget with. Watches kept people company before smartphones did. Before we begin exploring Hans Wilsdorf's lifetime achievements, I must share something very interesting with you. I have been researching this story for years, slowly putting together the elusive, ambiguous, and often cryptic pieces of the Role history puzzle that makeup Hans Wilsdorf's life. Often times I would stumble into or over puzzle pieces and not even understand what I was looking at until years later, it would suddenly dawn on me what I had seen and what it meant. Like with any jigsaw puzzle, I began by identifying and separating out all the puzzle pieces with straight edges, and assembling them all into a frame so I could then work inwards. The challenge was many of the border pieces were missing from this complex puzzle, and this has been a constant source of frustration which somehow inspired me to push ahead that much more. Back in 2010, just after I completed the first detailed draft of this story, I discovered an enormous piece of the Hans Wilsdorf puzzle, and it came in the form of a small book Hans Wilsdorf wrote himself, which was part of a 4 volume set of books published in 1946 named Rolex Jubilee Vade Mecum. I discovered the Rolex Jubilee Vade Mecum when I read an amazing article on the History of Rolex written in 2006 by David Boettcher. I reached out to Dave and he sent me a scanned copy of Vade Mecum, which was invaluable to this story. From what I understand, there were only 1000 copies of this book ever published, and Volume 1 was written by Hans Wilsdorf. Vade Mecum is Latin and translated into English it literally means Go with me. 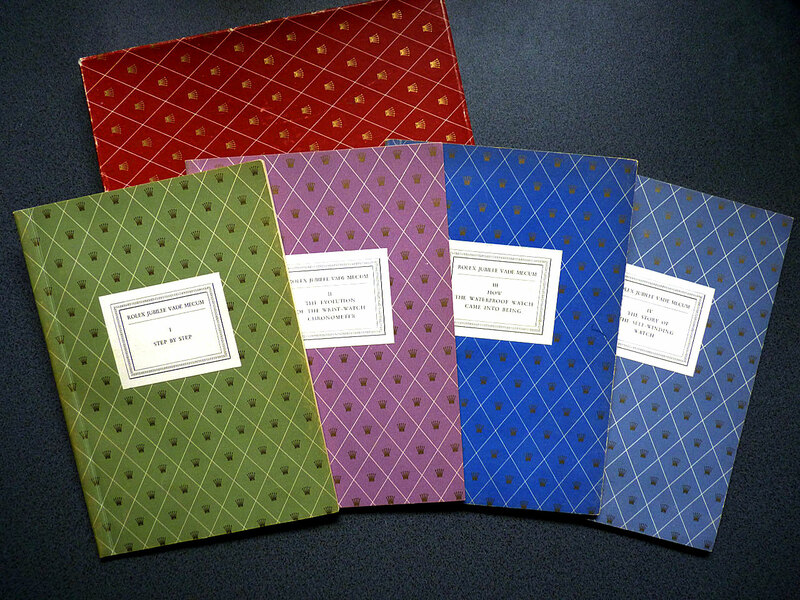 I believe this 4 volume set was originally intended as a manual for Rolex authorized dealers as a way to educate themselves about Rolex product. I was SHOCKED when I first came across this book, and I almost fell out of my chair when I first read Hans Wilsdorf's story in his own words!!! Discovering this writing of Hans Wilsdorf presented me with a challenge. Of course, I wanted to immediately publish it, and at the same time, I realized since I was already almost done researching and writing my biography of Hans Wilsdorf, that telling the same story would be redundant on some levels. After much careful consideration, I decided to do something out of the ordinary, and add the entire contents of Hans Wilsdorf's writing in with my own. I did this because I realize having Hans Wilsdorf's autobiographical account mixed in with my biographical account should give you, the reader, the best of both worlds. I also decided to put ALL of Hans Wilsdorf's writing in bold green, italicized letters, within quotation marks. This way you can easily distinguish his words from mine. So let's hop in the Rolex Time Machine and get going on this marvelous journey through Rolex history!!! 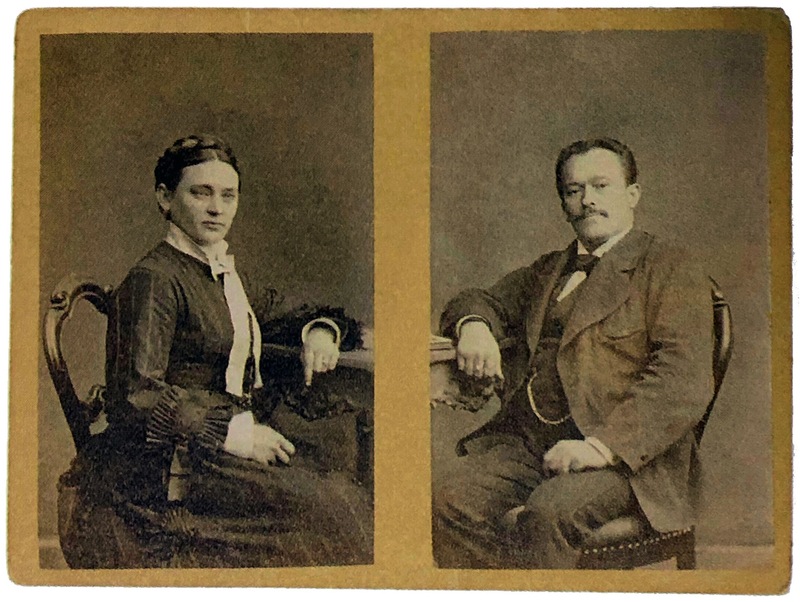 Let's begin by taking a look at the 1881 photo of Hans Wilsdorf's parents, Anna and Johann Daniel Ferdinand Wilsdorf. This next photo was taken in 1887 when Hans was 6 years old. 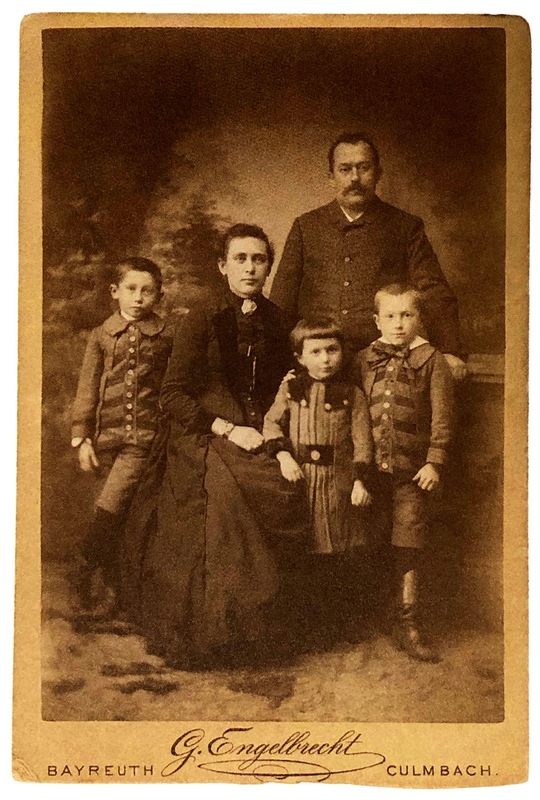 Hans Wilsdorf is pictured on the far right along with parents Anna and Ferdinand Wilsdorf. Brother Karl (left) and sister Anna (center right). The two images above appear courtesy of German author Gisbert L. Brunner and appear in his book titled "The Watch Book ROLEX." 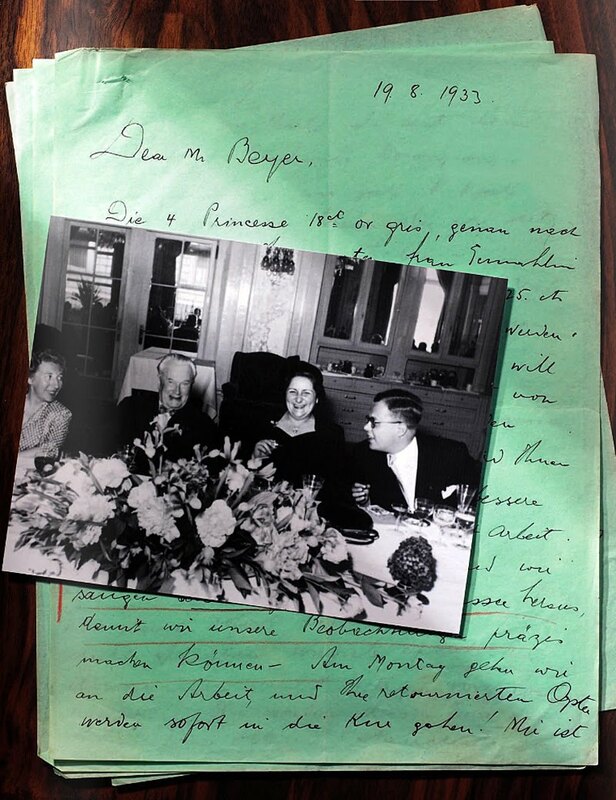 Gisbert "Carl" Brunner knew and interviewed Hans Wilsdorf's second wife, Betty Wilsdorf-Mettler several times back in the 1980s, whereby he gained insight into Wilsdorf. Gilbert is the author of around 30 books on watches and has specialized as a watch journalist since 1981. "I was born on March 22nd, 1881, of Protestant parents, the second son of a family of three. My mother's early death was soon followed by that of my father and, at the age of twelve, I was an orphan. My mother's brothers thereupon decided that it would be wiser to liquidate the prosperous business which had belonged first to my grandfather, and later to my father, believing that in this way we children could be better prepared for life without having to call upon anyone for help. Our uncles were not indifferent to our fate; nevertheless, the way in which they made me become self-reliant very early in life made me acquire the habit of looking after my possessions and, looking back, I believe that it is to this that much of my success is due." "We were placed in a boarding school of excellent repute where we received that sound education so necessary to the man who has to make his own way in the world. I showed a particular liking for mathematics and languages and this inclination drove me to travel and work in foreign countries. I began my career as an apprentice in a very important firm of Pearl exporters whose sales organization covered the world. The experience gained there has proved invaluable throughout my career. In the year 1900, I went to La Chaux-de-Fonds, to work as an English correspondence and clerk with Messrs. Cuno Korten, 49, rue Leoppold Robert, at a monthly salary of frs. 80.– (about ₣ 3 15s. in the currency of the time). This firm has now closed down (the Head having left Switzerland) but at that time it was a big concern exporting about one million francs worth of watches annually; all grades of watches were dealt with, although only a small proportion was manufactured by the firm itself. My work there provided an excellent opportunity to study the watchmaking industry closely and to examine every type of watch produced both in Switzerland and abroad. 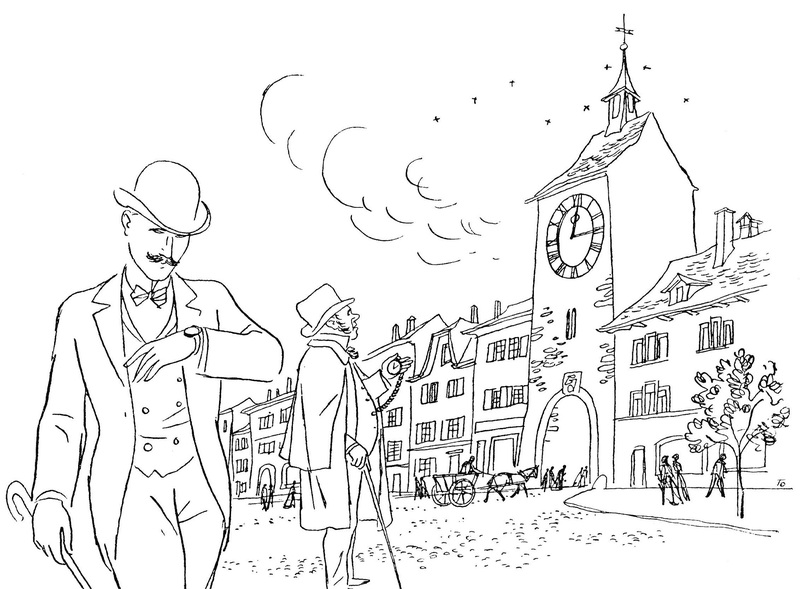 In 1903, I settled in London, again working for a good watchmaking firm which has also long since closed down. Two things struck me most forcibly about my new employers: on the one hand their commercial competence and, on the other, their lack of specialization. 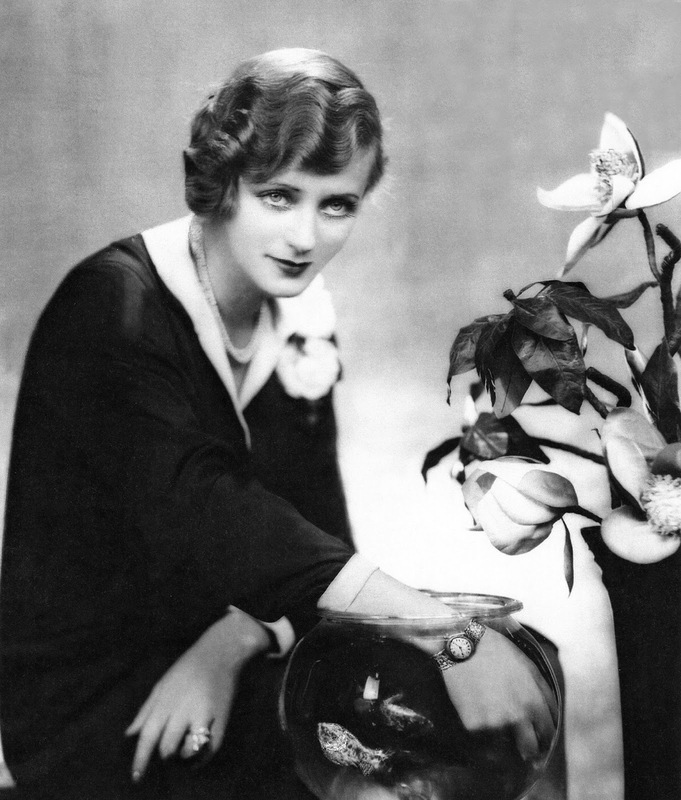 I soon gained confidence in myself and, in 1905, at the age of 24, decided to set up in business alone, feeling that my training and education had prepared me to stand on my own. "The first result of this decision was the founding, in 1905, of the firm styled Wilsdorf & Davis, 83 Hatton Gardens, London E.C., with a modest capital at its disposal. " 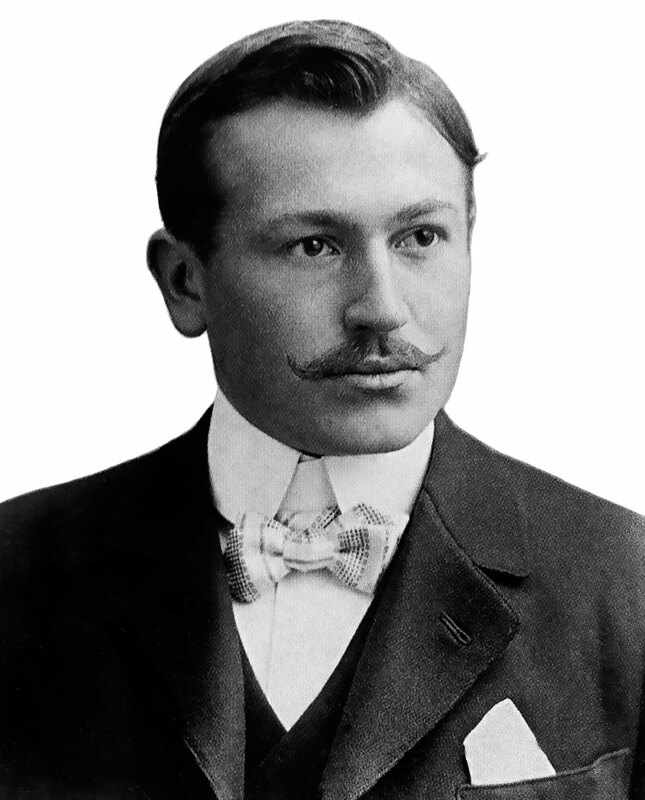 Hans Hilsdorf, Founder of Rolex pictured above in 1905 in La Chaux-de-Fonds, Switzerland. As we just learned, in 1905, Hans started his first business with a much older business partner named Alfred James Davis, who was Hans Wilsdorf's brother-in-law. Their company was named Wilsdorf & Davis and they specialized in selling watches and watch parts. The photo below is the placard sign that was placed on the outside of the front door of Wilsdorf & Davis headquarters in London, England. 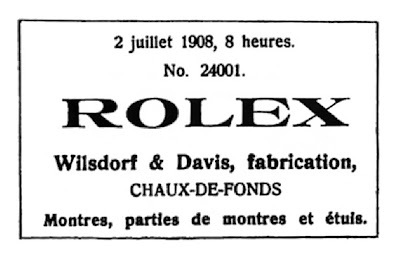 In 1908, Hans Wilsdorf registered the name of Rolex as a trademark for Wilsdorf & Davis Ltd., and the image below, which appears courtesy of David Boettcher is the official registration from July 2nd of 1908. "I tried combining the letters of the alphabet in every possible way. This gave some hundred names, but none of them felt quite right. It was one morning when I was sitting on the upper level of a double-decker powered at that time by horses, driving along Cheapside in London, that a good genie whispered in my ear: "Rolex." A few days after this fruitful journey, the Rolex brand was filed, and then officially registered in Switzerland by Wilsdorf & Davis." Al, who goes by "Alcan" on RolexForums.com, sent in the next two photos of his 1908 Wilsdorf & Davis pendant watch, that he recently had restored. 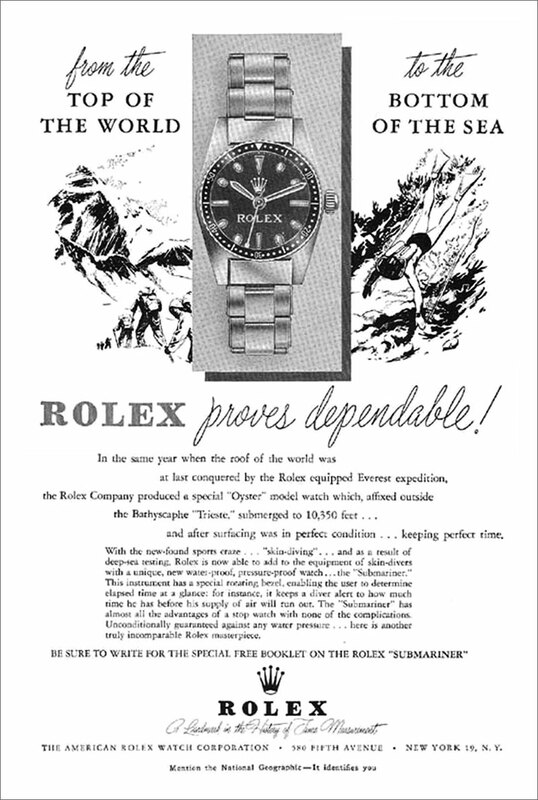 It was made the same year that Hans Wilsdorf registered the Rolex trademark. 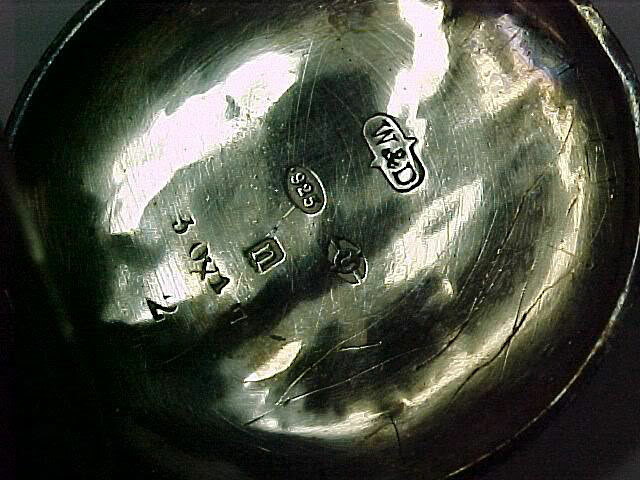 In the photo below we see the "W&D" engraving etched into the back of Alcan's 1908 Wilsdorf & Davis pendant watch. This is a really fascinating story, and you can learn much more about the details of how he restored this beautiful watch. 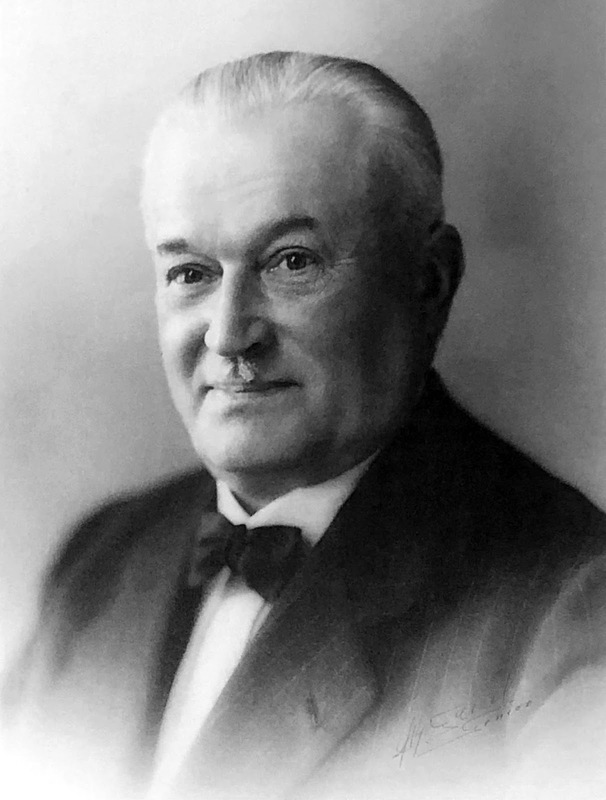 As we learned, Hans Wilsdorf was born, Hans Wilhelm Wilsdorf on March 22, 1881, in Kulmach, Bavaria (which is now part of Germany) to Ferdinand and Anna Wilsdorf. Unfortunately, Hans Wilsdorf's parents passed away unexpectedly when he was only 12 years old. Hans and his two siblings went from living a sheltered life with his parents to live with his maternal uncles. 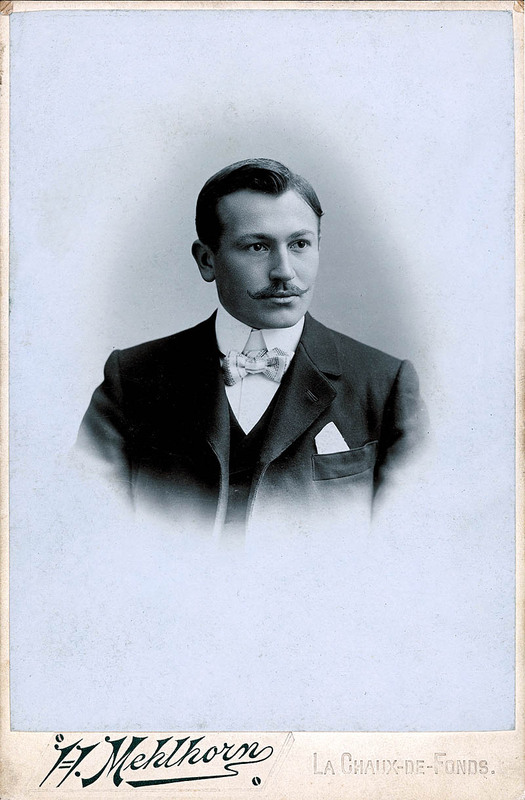 Hans attended a boarding school in Coburg and went on to attend business school in Bayreuth before he left Bavaria at the end of the 20th century. Hans Wilsdorf's mother was a descendant of the popular Maisel brewing family–but he was not interested in going into the brewing business. Hans was to inherit a significant amount of money from his parent's estate, but it was stolen when he was a child, so he had to fend for himself. Hans moved to Geneva, Switzerland to work for a pearl dealer. He then went to work for Cuna Korten in La Chaux-de-Fonds in 1900. Cuna Korten was a fancy Swiss company that specialized in exporting Swiss pocket watches. Since Hans spoke English, German and French he was responsible for handling the business correspondence which helped him later in understanding international strategic marketing. Hans was also responsible for winding several hundred watches daily and monitoring their accuracy. Cuna Korten was a large and profitable organization and being exposed to all those watches obviously resulted in Hans developing severe WISitus as well as a very deep appreciation for precision and beauty. Cuna Korten obtained the majority of their merchandise from vendors in France, Germany, and Switzerland. While at Cuna Korten, Hans became obsessed with creating perfect watches. Hans then had to go back to Germany to serve in the Army in 1902. 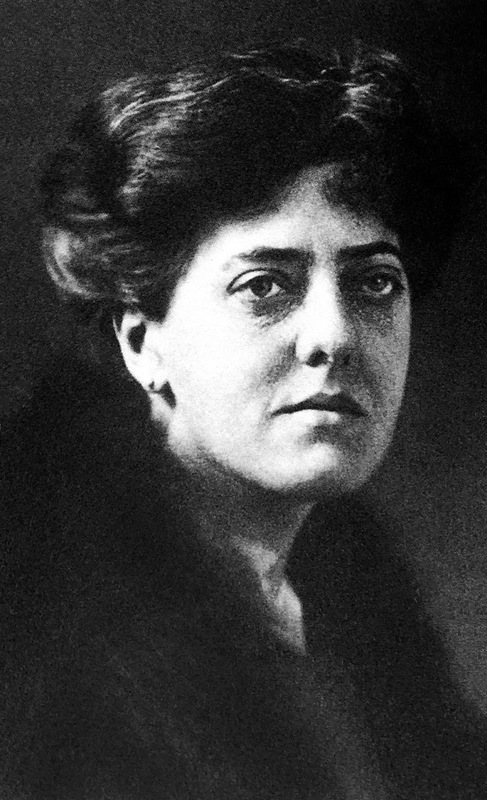 When he got out of the German Army he moved to London, England where he met and fell in love with his wife, Florence Frances May Wilsdorf—Crotty, and went on to become a British Citizen. The photo below is of Hans Wilsdorf's first wife, who passed away in 1944. 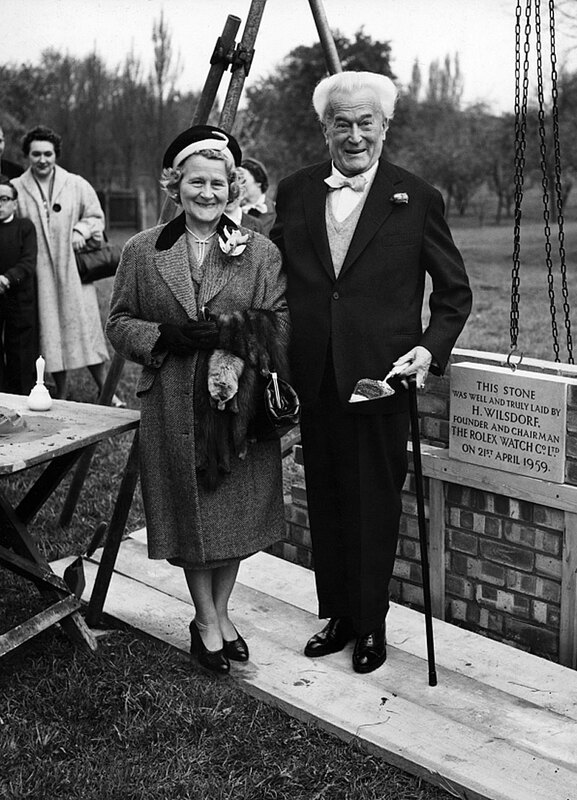 Hans Wilsdorf was completely devastated by the loss of his beloved wife and turned his focus toward Rolex. After May Wilsdorf passed away, Hans Wilsdorf transferred 100% of his shares in Rolex to the Wilsdorf Foundation, which owns and runs Rolex today. The image below appears courtesy of Gisbert L. Brunner. Rolex to this day has a British sensibility as well as a Teutonic and logical German disposition, coupled with the conservative Swiss disposition–this all comes from its founder, Hans Wilsdorf. From a design perspective, Hans' design ethos and aesthetic were far more German than French, Italian or Swiss and I argue this is still true to this day. In other words, Rolex design to this day is more Germanic than anything else. As a matter of fact, Hans was chauffeured in a Mercedes for many years of his life and the CEO of Rolls Royce kept trying to get him to switch but he refused. 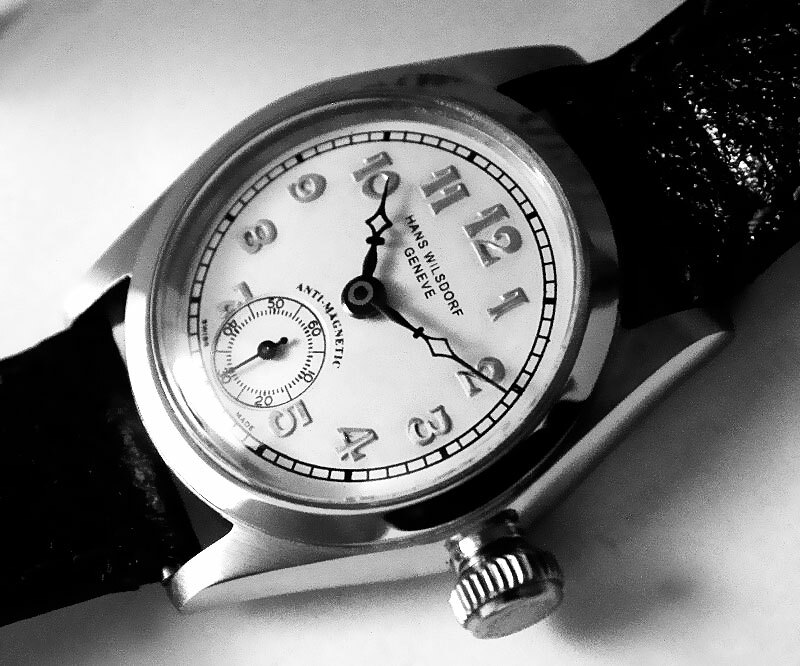 Hans was German to the core as were his masterpiece Teutonic Rolex watches. It is interesting to note Hans Wildorf was brought up in the Protestant faith. 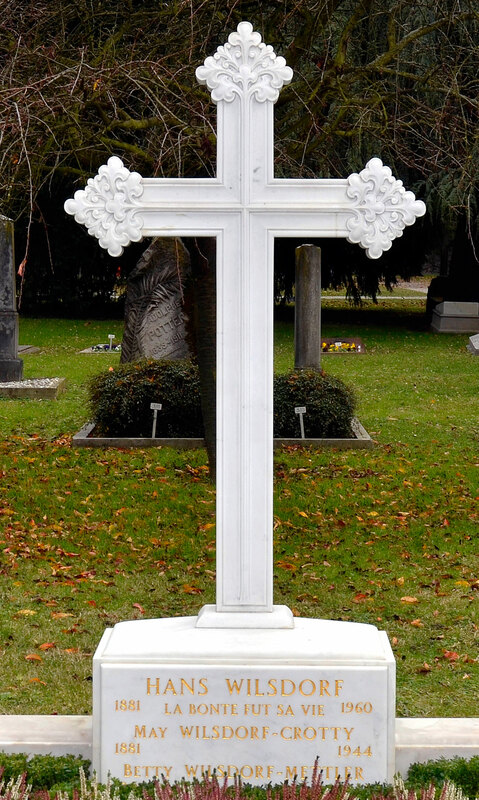 In Bavaria, he lived in an area that was primarily Catholic, and he was constantly teased by boys who were part of the primarily Catholic faith so he was treated as an outsider. At age 33, in 1914, a decade after Hans moved to England and began to build Wilsdorf & Davis, World War I broke out and the British citizenry developed a severe hatred of the German's. 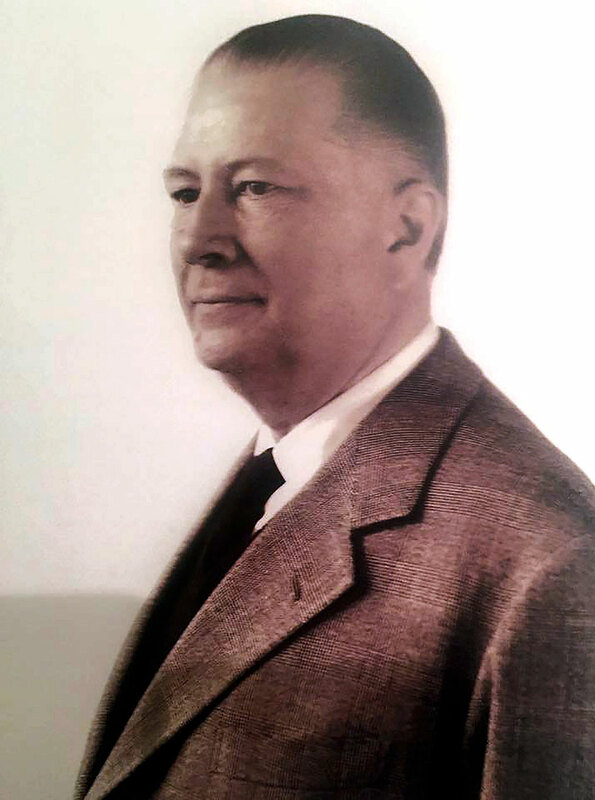 Since Hans was of German descent, with a German name and accent, he was looked down upon, which is likely one of the reasons he moved Rolex's headquarters to Geneva, Switzerland and moved to Geneva himself. Despite the fact Hans Wilsdorf had registered the Rolex trademark in 1908, he continued using the Wilsdorf & Davis Ltd. name in England, and it is very likely he formally changed the name to The Rolex Watch Company Ltd. in 1915 in response to the English conflict with the Germans. In other words, the name "Wilsdorf" was clearly German, and since England was at war with Germany, German names were frowned upon. When we think of the Rolex brand today, we think of it as one of the most established Swiss brands, which is steeped in Swiss tradition, but for at least the first half of Rolex's existence, it was looked down upon by the Swiss watchmaking establishment. Rolex was considered an alien company or an outsider, which made Hans work that much harder to achieve success and ultimately greatness. Mankind began trying to keep time for many thousands of years. Ancient civilizations used all kinds of crude methods for trying to keep time, including the measurement of motion of stars in the night sky. Five thousand years ago, the ancient Sumerians created a calendar that divided the year into 12 months with 30 days each. Other cultures used sun clocks and sundials that told the time by measuring shadows, and later mankind began measuring time by measuring the elapsed time using an hourglass which measured how quickly sand could fall through a skinny tube–from one chamber to another. 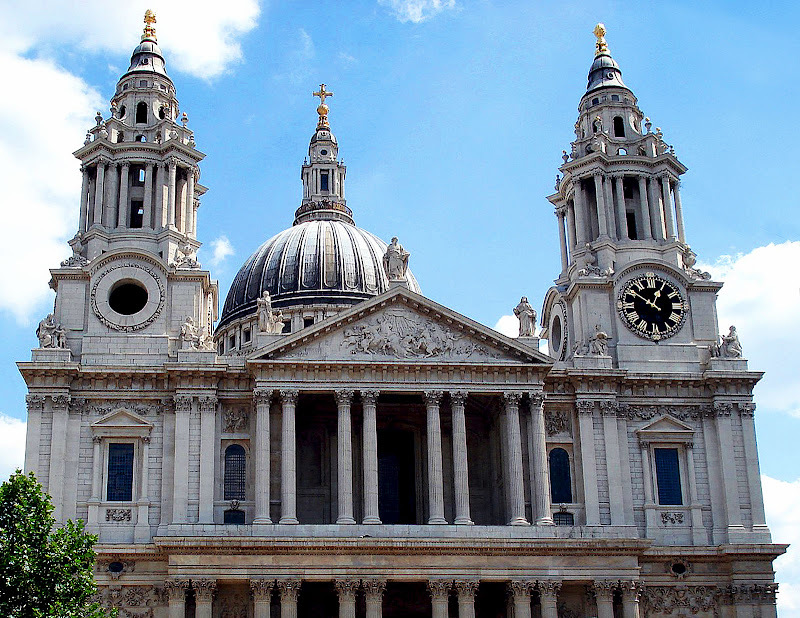 In Europe, the great cathedral's were the first to have clocks that would allow passers-by to tell the time. Then the development of the pocket-watch in 16th century Tudor, England changed everything. The challenge with the first pocket watches is they were very large and did not keep very accurate time. In the 17th century, pocket watches evolved and became more precise, and were slowly adopted by wealthy men who could afford them. For the first time, two men could accurately synchronize their actions with a device they carried in their vest. The pocket-watch changed everything. Despite the fact Hans Wilsdorf was responsible for the popularization of the wristwatch, he was also a huge collector of pocket watches. As a matter of fact, the pocket watch below is from Hans Wilsdorf's personal collection that contains pocket watches going back 400 years. The pocket watch below was made in 1665 in Germany by Jeremias Flug of Passau. The watch is fully enameled and the form has silver-set turquoise, and the back enamel depicts the Departure of Ulysses. The most fascinating detail on the pocket watch below is the original pocket watches only had one hand which was an hour hand. Second hands did not come along for many years and were really the first complication on a pocket-watch. I think there is a simple elegance to a one-handed watch. To learn more about the Hans Wilsdorf Pocketwatch Collection please click here. 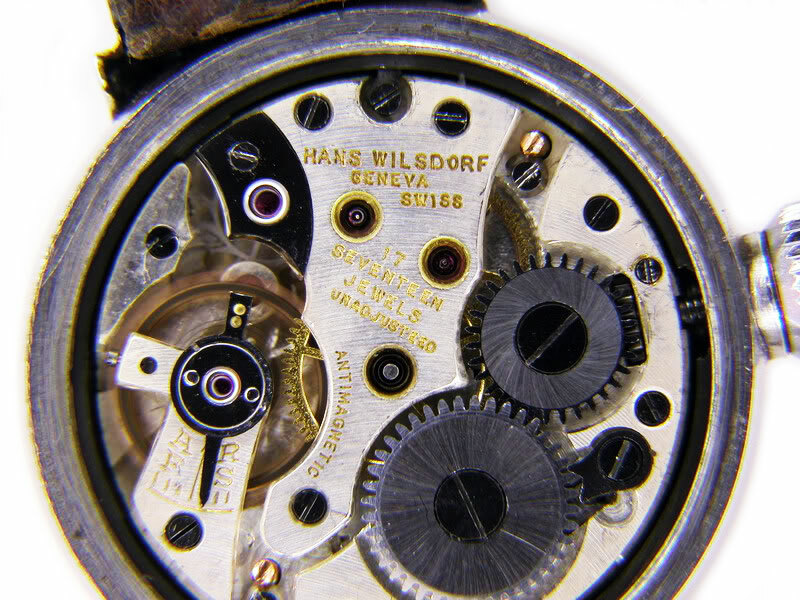 When Hans Wilsdorf started his first watch company in London in 1905 with his brother-in-law it was named Wilsdorf and Davis. 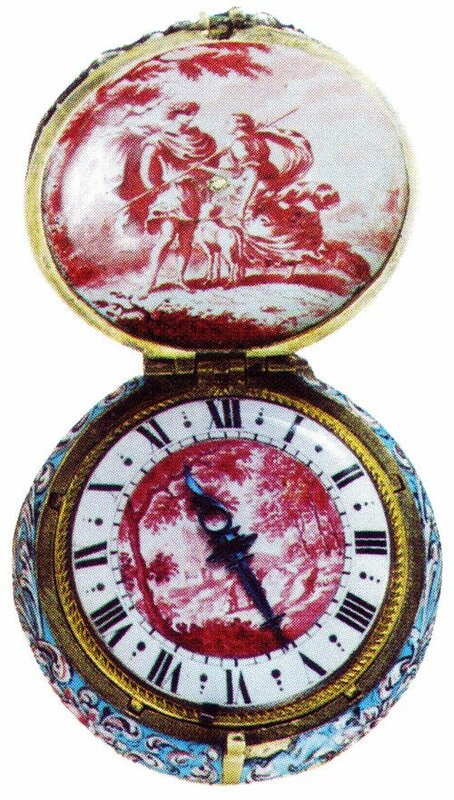 At the time, pocket-watches were everywhere and wrist-watches and pendant-watches were only worn by ladies. 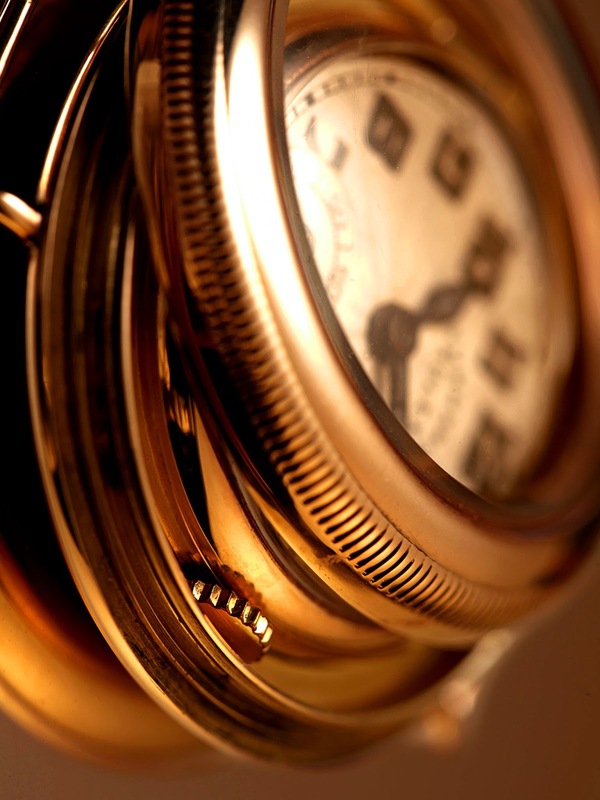 The first wristwatches were simply pocket watches with wire lugs soldered onto the pocket-watch case. All pocket watches had the same basic snap-back case construction for hundreds of years and this created a challenge in humid, tropical environments. The challenge was the dust and moisture and perspiration would penetrate the watch case and corrode the watch from the inside. "For fourteen years I undertook the financial side and management of our concern. From the very outset, our success was assured by our fundamental policy to trade only in specialty horological products and especially in new lines. The first specialty we adopted was the traveling watch, called a portfolio watch, cased in the finest quality leathers; this line I immediately placed in large quantities on the market, the range covering every possible style and design. However, even at that time, my chief concern was the wristlet watch to which I devoted all my youthful energy and optimism which has never been belied. At that period, the wristlet watch not at all popular; in fact, it was an object of derision, the idea of wearing a watch on one's wrist being contrary to the conception of masculinity. Then, too, watchmakers all over the world remained skeptical as to its possibilities and believed that this newfangled object was bound to prove a failure. Firstly, the mechanism required by this type of watch must of necessity be small and delicate and could therefore never withstand the violent gestures of hand and arm. Secondly, dust and damp would rapidly spoil the mechanism, even if it were well constructed. Thirdly, accuracy and regularity of working could never be attained with so small a movement. In spite of all this, I kept my faith in the wristlet watch and was determined to see what could be done in England, that country of sportsmen par excellence. It seemed to me that here my chances of success were the greatest. The task I undertook meant the overcoming of enormous difficulties. And yet today, after 40 years of striving, it seems to me that I have surmounted them and I believe that, in doing so, I have contributed to the development of the watchmaking industry in general." "The Swiss watchmaking industry has benefited greatly by the introduction of this new product more so than that of other countries, because it was in a better position to follow the rapid rise and development of this modern fashion. Generally speaking, the wristlet watch was bound to bring about a certain revolution in the industry: a naturally caused an increase in sales, not only on account of its novelty, but also because by its very nature it called for more frequent renewal. More exposed to damage than the pocket watch, it was not of the type to become a ”family heirloom” handed down from father to son for several generations. Apart from this, being worn on the wrist, it was destined to become, more than any of its predecessors, a modish accessory, and object submitted to the vagaries of fashion, that is to say, calling for change and variety. Again, the wristlet watch is the type of article of which each individual likes to have not only one, but several; men and, still more, women wish to have a selection of watches suitable for different occasions, for work or the social round, or to harmonize with their attire. I had very early realized the manifold possibilities of the wristlet watch and, feeling sure that they would materialize in time, I resolutely went on my way. Rolex was thus able to get several years ahead of other watch manufacturers who persisted in clinging to the pocket watch as their chief product. In 1902, during my stay at La Chaux-de-Fonds, I heard that Hermann Aegler of Bienne had started the regular and mechanized manufacture of ebauches (or rough movements) for a small lever escapement movement. My interest even then had been roused by this innovation and, as the mechanism had proved very successful from a technical point of view as well as being accessible in price, I had got into touch with the head of the firm in view of launching this article in England and elsewhere. 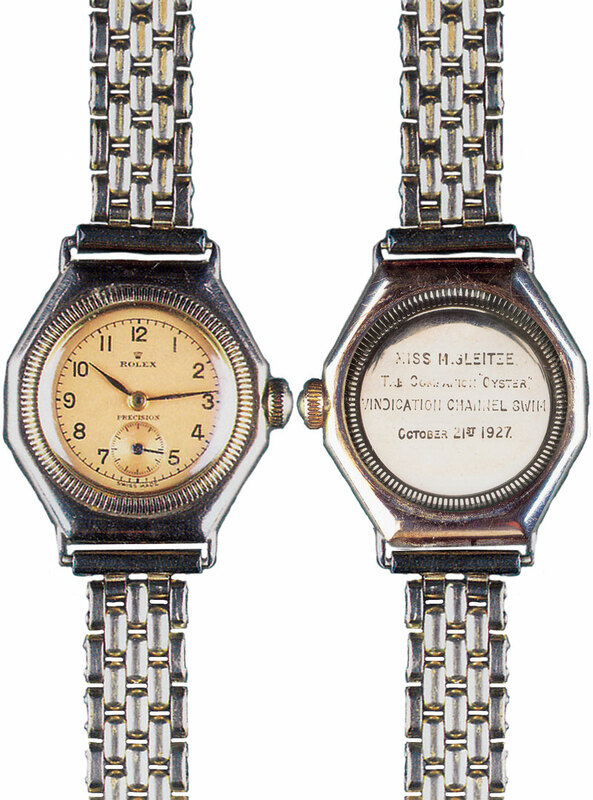 After founding my firm in 1905, I went to Bienne and placed with Hermann Aegler the largest order ever booked for wristlet watches at the time. The order amounted to several hundred thousand Swiss francs. This was the first step forward in our climb to success with which, indeed, the factory in Bienne is closely connected. Over a very long period, I traveled to Bienne from London several times a year, bringing my collaborators new and personal ideas, demanding that they be realized. In this way, hundreds of models were conceived and launched on Empire markets and in the Far East. The new fashion watches became extremely popular, in Australia and New Zealand especially. There was so much to be done, however. In fact, I may say that I had to start from scratch. The first line I placed on the market was a series of silver watches with leather straps for men's and ladies' wear. Their success was immediate and the range had to be widened as soon as the first models came out, so I presented a selection of designs in gold. Next came the idea of expanding bracelets, which an important jewelry firm invented and launched in about 1906. This too won the approval of our British clientele. From that time on, our little gold watch became increasingly popular throughout the Empire. And this is how both a new fashion and a great commercial success sprang from an apparently foolhardy idea. Soon we were placing orders for tens of thousands of pieces and, to the uninformed, must have appeared extremely audacious young people." "By 1908, Wilsdorf & Davis had become one of the leading firms in the British watch trade. It was time to think of giving our watches a name of their own, a trade name which could be inscribed on the dials. As a matter of fact, such innovation ran counter to a very old tradition of the English watch trade. Ever since the XVIIIth century, the leading watch importers of the country had always insisted on featuring their own name and no other on the dials or movements and, when I came forward with my new idea, the opposition I encountered seemed insuperable. However, I was well aware that, unless I succeeded in making our watch known under its own name, our prospects would be limited. The name chosen provided in itself an excellent point in our favor.” Rolex”–a short yet significant word, not cumbersome on the dial (thus leaving room enough for the inscription of the English trader's name) and, above all, a word easy to memorize. It (Rolex) has a pleasant sound and its pronunciation remains unvaried in whatever European language is spoken. Despite the qualities of this trade name, it took 20 years of hard work to make the idea acceptable in England. At first, I ventured to inscribe it on one watch in every six; then it appeared on two, and later three, in every six. This half victory was still unsatisfactory and we knew that it would take many more years to obtain the desired results. 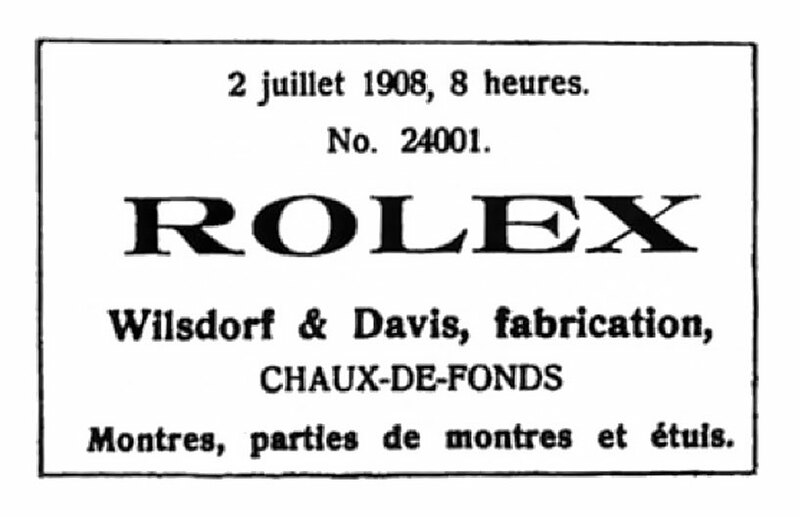 Tired of waiting, in 1925, I decided to launch the "Rolex” trademark by means of an intensive advertising campaign. 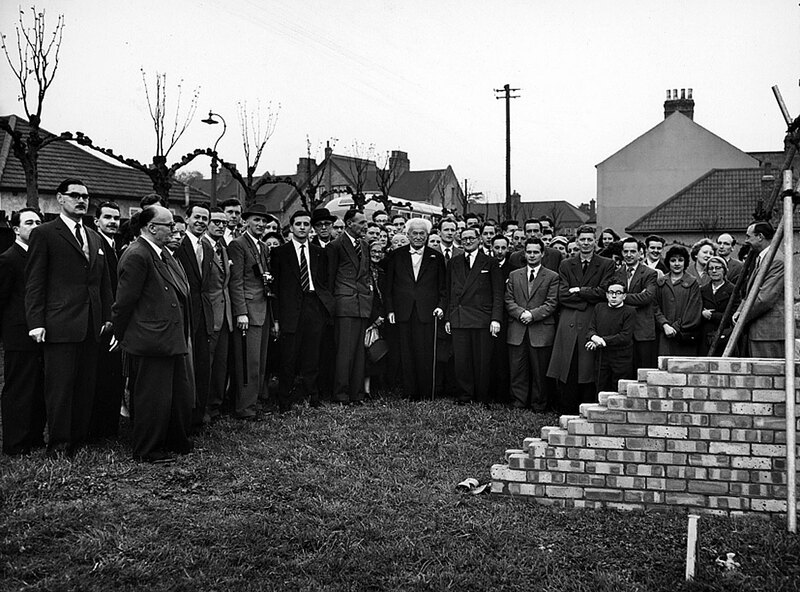 The policy entailed an annual expenditure of more than 12,000 British pounds–not for one year alone, but for several in succession. One of the results thus obtained was that dealers agreed first that four, and later five, out of every six watches should bear the name of "Rolex." 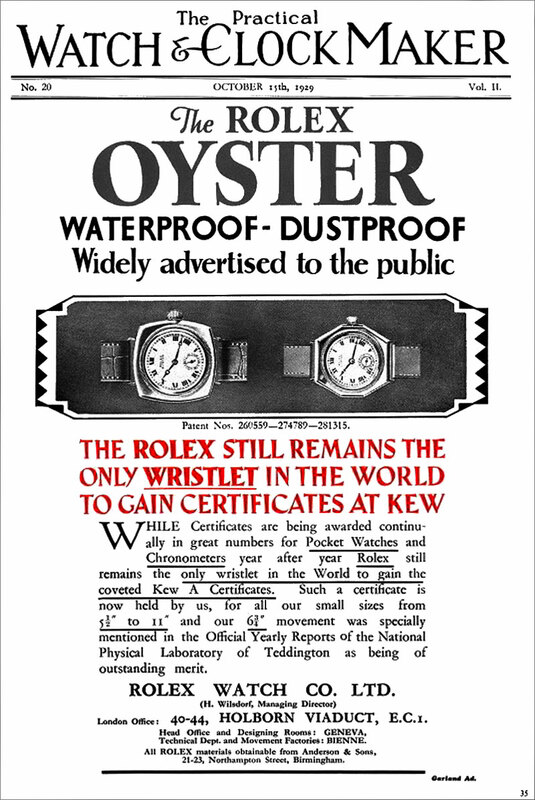 At last, in 1927, the waterproof “Rolex–Oyster" was launched and we were then in a position to announce definitively that in the future not one of our watches would ever again leave our work without our name on the dial, inside the case and on the movement. In the same year, certain watch dealers were selected in each town (one or more according to the size of the locality), to whom the sales monopoly our watches was granted. In order to help these dealers, we devised special window displays which soon became known throughout the whole of England and gave the buying public great pleasure. Their chief feature was an aquarium forming a centerpiece in which, among the water plants and goldfish, was plunged the "Oyster"–the watch as watertight as an oyster. Another red–letter day the development of our firm was when a small Rolex wristlet watch, 25 MM in diameter, won a class “A” certificate at the famous Kew Observatory. This was on July 15, 1914, a day I shall never forget." 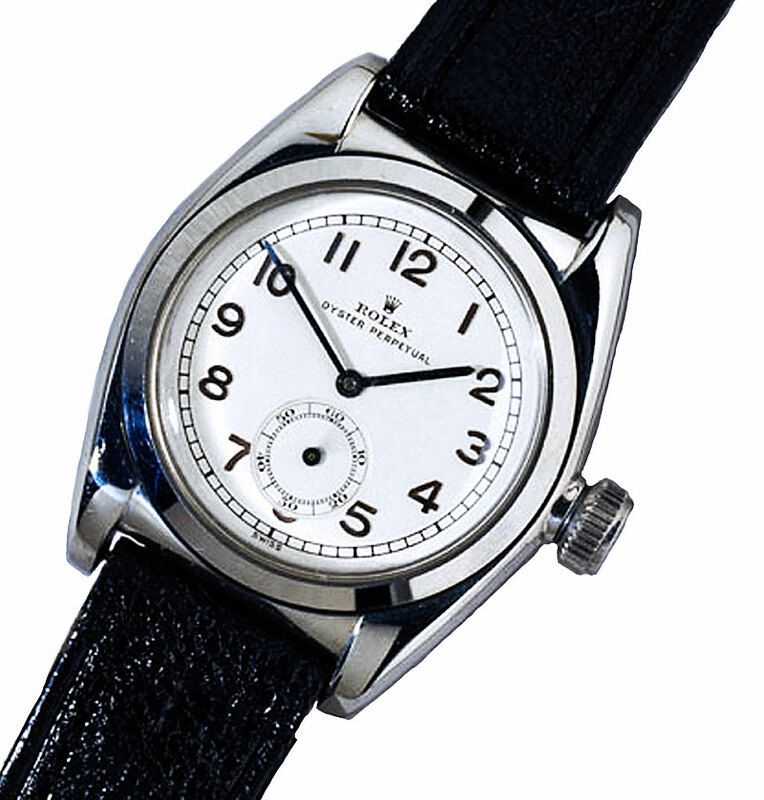 When the first World War broke out in 1914, the wristlet watch had already won the favor of the Anglo-Saxon public. 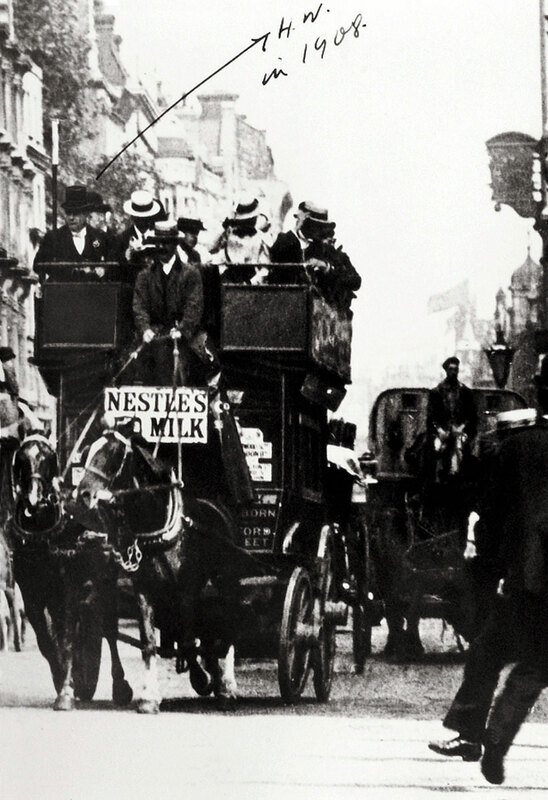 Up to 1915, London was our export center for every market in the world. Indeed, by 1914, our firm had grown to such an extent that we were occupying a large suite of offices and had a payroll of more than 60 employees. 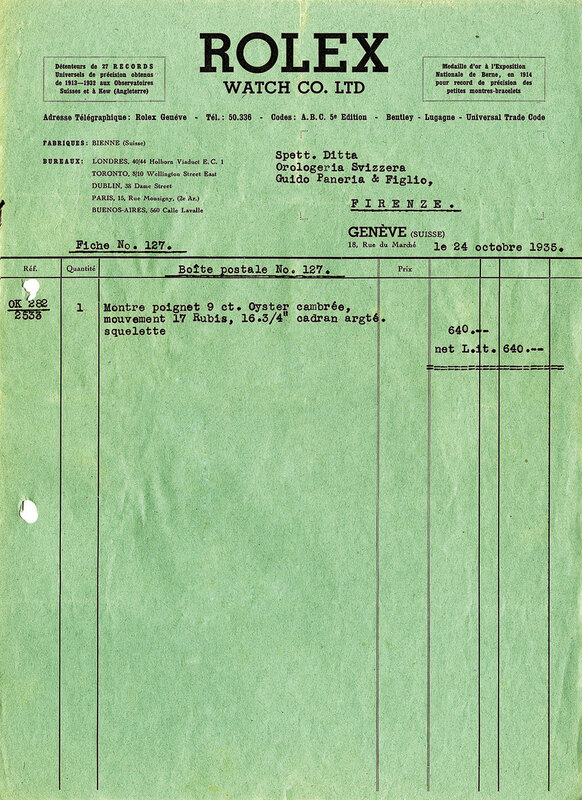 However, when in the next year a 33.3% customs duty was suddenly decreed by the British government, we found ourselves faced with the necessity of transferring our export organization to our own offices in Bienne which we had opened three years previously in order to facilitate our very close business relationship with Mr. Aegler. From that time on, our headquarters at Bienne became the central checking and reception offices for all watches destined for export to London and elsewhere." "It was in 1919 that I finally founded at Geneva, in the offices we still occupy today, our present company, the Rolex Watch Co. Ltd., of which I am sole proprietor. This decision was taken in order to enable our Bienne factory to devote itself entirely to the manufacture of watch movements, while we in Geneva could design and launch our watches according to the traditional style of the “City of Watchmaking”. In other words, the Rolex movement is made in Bienne, but the Rolex watch is a Genevan creation. In Geneva, too, every detail of the movement is submitted to yet another careful and most minute checking. The years immediately following the first Great War, indeed until 1926, proved extremely difficult for the watchmaking industry as a whole, and yet Rolex continued to prosper and to consolidate its position on world markets. This privilege must be attributed to the firm's preponderance in the manufacture of quality precision wristlet watches." The following five images are from James Dowling & Jeff Hess' book The Best Of Time and they help illustrate the evolution of the watch to make it waterproof. 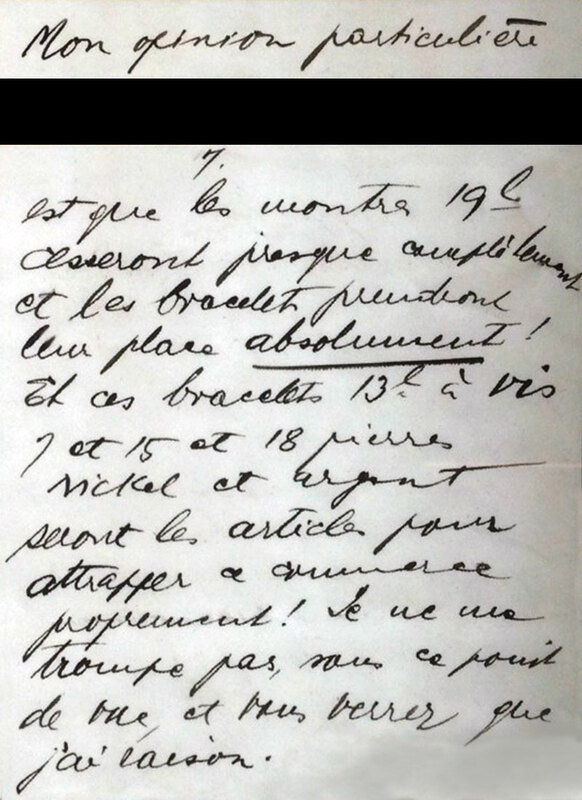 The following letter handwriting was taken from a letter than Hans Wilsdorf wrote in his own handwriting in 1914, and it is translated into the gold text above. 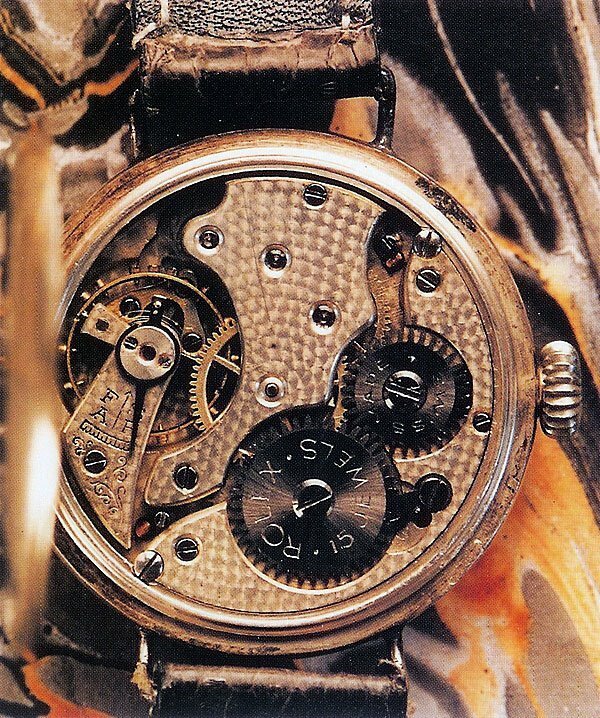 This first image below is a snap-back Rebberg Rolex watch from 1914. Essentially it is a pocket watch on a leather strap. If you look closely at the image above, you notice the watch has a hinge on the left side of the case. If you flip the watch around onto its face (as seen below) you notice if you open the rear door it exposes the movement. (Note: the snap-back door on the photo below is not in sharp focus, but it is on the left edge of the photo sitting upright, perpendicular to the case). The challenge is, there is no seal or gasket to stop dust, perspiration, water or humidity from entering the case. 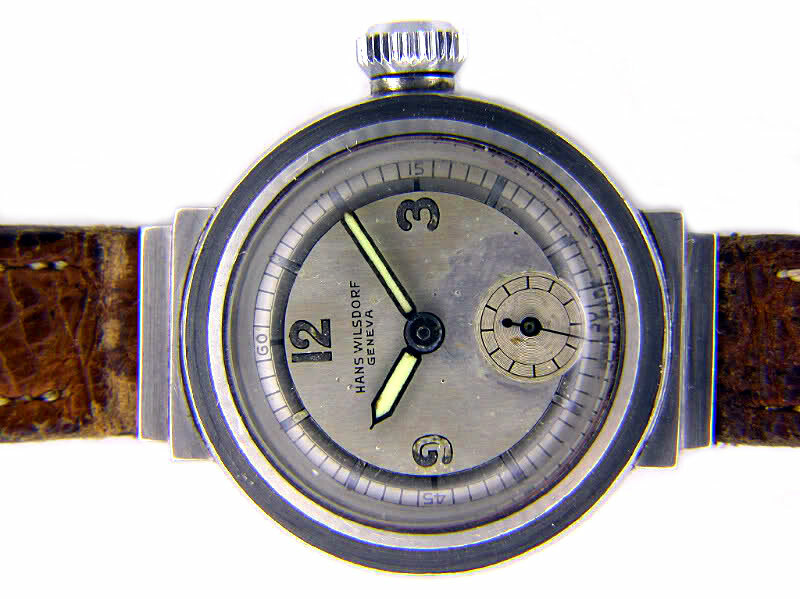 Pictured below is another Rolex wristwatch from 1915, this time with a snap front Hunting Case and if you look closely you notice it is simply a pocket-watch with lugs soldered onto the case, along with a leather piece sewn onto the wired lugs–very primitive and fragile by today's standards. The reason it had the snap front case-cover was to help protect the glass crystal from getting cracked when a gentleman went hunting. It is important to note, prior to World War I, wrist watches for men did not exist. Ladies wore watches on straps around their wrist and on pendants attached to their dresses, but men wore their pocket watches on a chain, and they kept their pocket watches in the vest pocket of their suit. During the early twentieth century, when a man was asked what he thought about wearing a watch on his wrist (known at the time as a wristlet) one man remarked he wouldn't be caught doing such an unrefined thing. He said you would be as likely to catch him in a dress as you would wearing a "wristlet." When you examine these first generation wristwatches, with the skinny strap, you can kind of understand why men would have thought they were feminine at the time. When men went to fight in World War I, having a precise timing tool on their person, to synchronize events, became invaluable. In other words, if one army had precise timekeeping instruments, they could more easily coordinate when to fire, or move. The pocket watch and later the wristwatch would become an indispensable weapon in modern warfare. So let's say a platoon of soldiers was scheduled to all begin firing at 3PM, each soldier would regularly ping his pocket watch to see what time it was. The challenge was if you were a soldier living and fighting in a trench, and you had to keep your pocket watch in your vest, and it was freezing cold in the trench, in order to time events, you would have to carefully put down your rifle, take-off your gloves, unbutton your trench-coat, unbutton your coat and reach in your pocket, while holding your rifle in the other hand—often times while shivering from exposure and the cold temperature. So once the solider got to his pocket watch, he would see the time and very quickly have to rebutton his jacket, overcoat, and put back on his gloves, then pick up his rifle to be prepared to shoot. Often times this process was so traumatizing by the time the soldier got redressed and aimed his rifle, he would have already forgotten what time it was. This process was, to say the least, clumsy, laborious and time-consuming. Conversely, with a wristwatch, the same soldier, while aiming with his rifle, could simply rotate his wrist 180 degrees and glance at his wrist, even if he had gloves on. Ironically, in a twist of fate, the modern wristwatch we take for granted today was born of war and began its life as a professional timing tool and war machine. The Photos below show a hermetic Rolex 'Submarine' watch made in 1922. Note it's NOT named 'Submariner', but 'Submarine' as it was based upon the same principle as a Submarine hatch that would spin open and closed like a jar lid. It was called a Hermetic watch as this new style of watch completely protected the entire movement, and notice, when it is sealed the watch winding crown, is hidden inside the watch. Think of a Hermetically sealed watch as being very similar to a jar lid (with a round glass aperture window) screwed on a jar. Once the lid is screwed into place, it forms an impervious barrier. No liquid can get in or out of the jar when the lid is securely screwed into place. (This, of course, is if you do not submerge the watch in deep water. At some point, without a gasket the case would fail and let water in). This hermetic watch design was revolutionary at the time as it only consisted of two pieces. Basically, you would spin the threaded cap off the front of the watch like a jar lid. The challenge was, in order to change the time or wind the watch–every day–you had to spin-off the top, every time, and then, spin it back on afterward. Even though it worked, this design was short-lived as it was a bit like having the on-off switch for the windshield wipers in the glove compartment of your car. Notice the face of the cap has a machined or fluted edge to make it easy to grip. Another challenge, was, that over time, the fluted bezel would wear down, so if you used it for a long time, eventually, you would no longer be able to grip the face to twist it off. This machined edge or fluted bezel is the genesis for the fluted bezels on modern Rolex watches, including the Day-Date, Datejust and even on the sports Rolex professional models like the Submariner and GMT Master. Note the wire lugs are soldered to the case, so the only way to replace the leather strap was to cut off the old strap and sew on the new strap. I think people got lazy with sewing the strap in place, and as you can see in the image below, they simply sewed across the strap horizontally, as you can see at the bottom of the strap. Hermetically sealed watches had a really interesting look since the winding crown was hidden in the case. Also, notice in the photo of the hermetically sealed Rolex above the fluting is not worn down. That's because this watch is steel, which is much harder than gold (like the two watches pictured above this one). 1.) To create watch designs suitable for both men and women. 2.) To standardize a range of movements of different sizes. 3.) To obtain so high a degree of quality, that our watches, whatever the caliber, should be recognized as “Chronometers” by the Observatories. 4.) To give current models the benefit of the results and improvements obtained with specially constructed high precision specimens. 5.) To maintain this high degree of precision by protecting the movements against the penetration of dust and impurities, the danger to which the wristwatch is particularly exposed. This last point presented a problem which could only be resolved by protecting the movement against all outside influences. To my technical assistants, my constant refrain was, from the earliest days: “We must succeed in making a watch case so tight that our movements will be permanently guaranteed against damage caused by dust, perspiration, water, heat, and cold. Only then will the perfect accuracy of the Rolex watch be secured." This seemingly insoluble problem has been solved. After years of untiring research, and at the cost of innumerable difficulties, the waterproof case was finally created in 1926. This invention was applied exclusively to the Rolex watch, was also the first realization of the permanently waterproof watch—and still is. The fact that, like an oyster, it can remain an unlimited time underwater without detriment to its parts, gave me the idea of christening it the “Rolex-Oyster", the name under which it has become famous throughout the world. 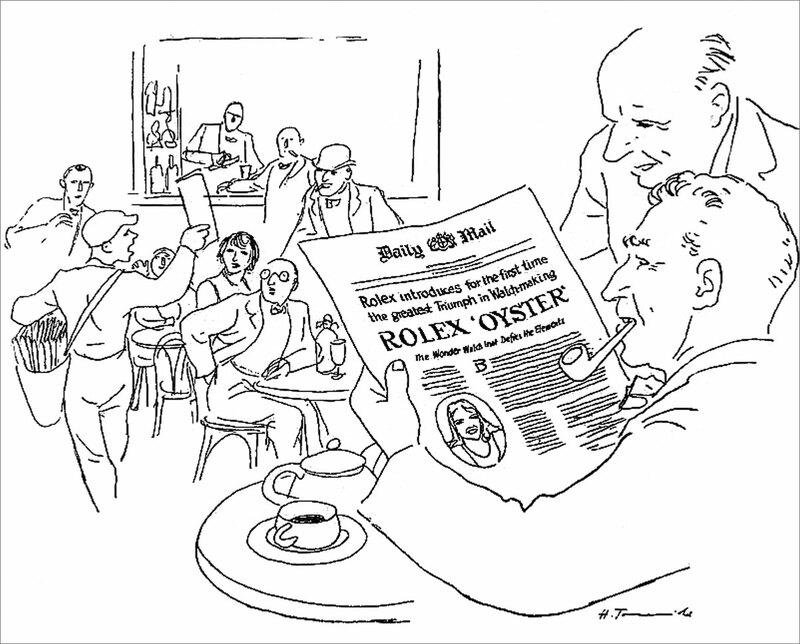 It was on October 7, 1927, that the "Rolex-Oyster” underwent the ordeal which was to justify its name. On that day, Mercedes Gleitze, a young London stenographer, swam the Channel in 15 hours 15 minutes, and with her went a faithful companion, the Rolex–Oyster. Imagine the surprise of the reporters present at her landing, when they found that the watch was still running as perfectly as if it had never left dry land. The event caused a sensation at the time, for the waterproof watch was still unknown to the general public. On November 27, 1927, I reserved the front page of the “Daily Mail” (at a cost of 1600 British Pounds) for an advertisement proclaiming the success of the first waterproof watch. This was the first step in the triumphant rise to fame of the “Rolex-Oyster". In a span of 5 years from 1926 to 1931, Rolex and Hans Wilsdorf would create and successfully patent two major horology milestones, which would forever set Rolex apart; the Rolex Oyster waterproof watch-case, and the Rolex Perpetual Movement. In 1925, Rolex would also create and register their famous trademark logo of the Rolex five-point logo crown. The Art-Deco era was a time of tremendous growth for Rolex, so much so, there are many art-deco elements which remain today as part of their current design language. How Does A Rolex Oyster Case Work? The next photo perfectly illustrates how the original Rolex Oyster case was designed, constructed and assembled. Notice the fluted bezel, just like with the one on the previously examined hermetic case, screws down onto the inner-case as does the case-back. 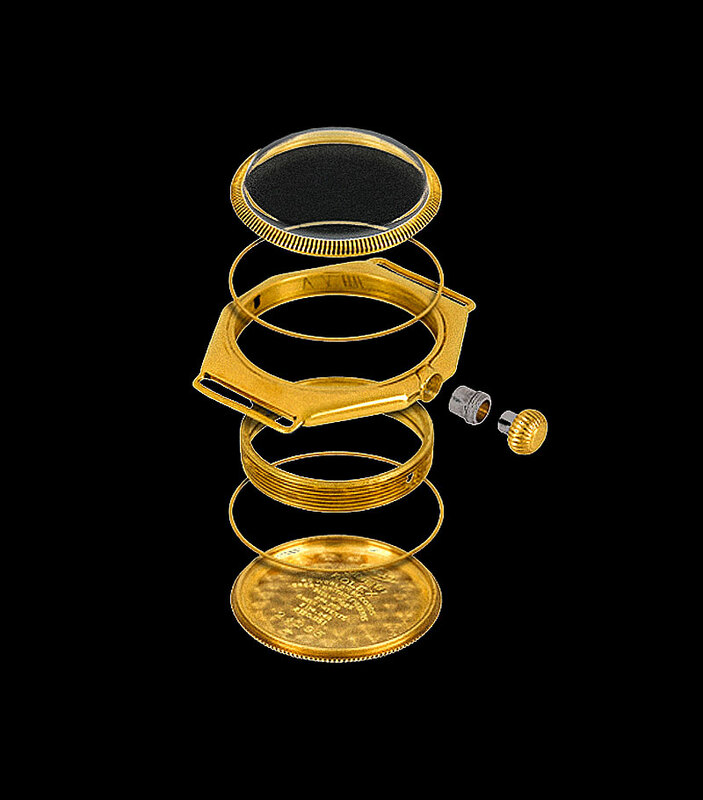 The actual Oyster case itself was milled from a solid piece of gold, as all Rolex Oyster watch cases are to this day. The next photo in this story (after Wilsdorf's continuing storytelling) is the actual first Rolex Oyster made in 1926, which was made out of yellow gold. This art-deco masterpiece wristwatch changed everything!!! Was it the first professional dive watch in history? In many ways, yes and in many ways no, as we will soon see. More than anything it was a watch you could take swimming without damaging. "The logical outcome of the “Oyster” was the creation of the "Perpetual" watch, whose movement is self–winding and guaranteed to run without interruption. This idea had, of course, preoccupied many famous horologists of the past. The creation of the "Perpetual" driven from the famous “Rotor" was definitely perfected by Rolex in 1931. The waterproof watch had in itself marked a great step forward toward the realization of this new achievement: an automatic watch can function with the utmost regularity only if the movement is placed in a waterproof case. These two inventions gave a renewed impetus to the Swiss watchmaking industry. 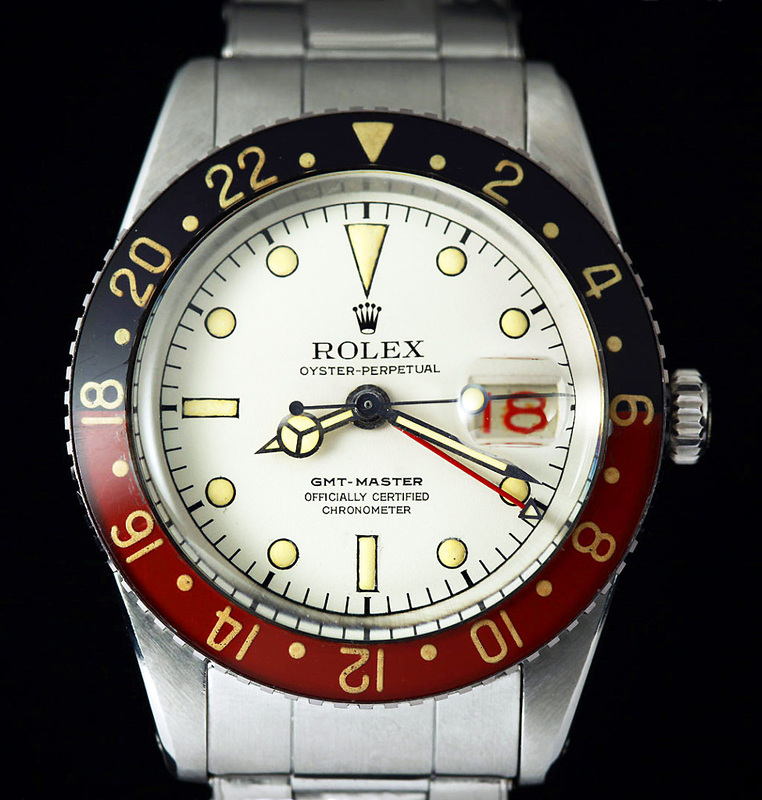 Stimulated by the success of the "Rolex-Oyster" and the "Rolex-Perpetual", other manufacturers followed in the construction of waterproof and automatic watches and, as a result, millions of pieces of this type have been exported throughout the world. They are now universally known and form an integral element of modern life. It has been my belief that the watch of the future is the “perpetual” watch, in other words, the automatic or self-winding watch. In this field too, Rolex has been a pioneer. Without the waterproof watch, the ”Perpetual" could never have been discovered. Moreover, had Rolex not obtained a perfect mechanism as regards precision and regularity, the disrepute into which the idea of the automatic watch had fallen after a long series of unsuccessful attempts in the past would have proved an insuperable obstacle against its ever coming into favor. The conclusive experiments to which the "Perpetual" movement has been submitted have made it possible for our technical department to bring out the movement in three different sizes and a wide range of models, both for ladies and men's wear, is now on the market. On the occasion of our 1945 Jubilee, we had the pleasure of announcing our latest "Perpetual" creation, the largest and most robust of our models: the"Rolex Datejust." On examining the major characteristics and details of this new creation, it cannot but be admitted that it is a masterpiece of horological science. It is, in fact, a synthesis of all that has been achieved up to the present day. "Rolex Datejust" is the only automatic, absolutely waterproof watch in which the date is shown through the small aperture without needing a special hand. Furthermore, thanks to an ingenious method of fixing the hairspring, all danger of the coils being damaged by shock and causing mal-adjustment is eliminated. This is a considerable advantage in the most interesting feature for sportsmen. further, this device also allows for much closer timing or adjustment of the movement in the different testing positions." From its earliest beginnings until September 21st, 1931, Rolex's had never suffered any set-back or regression. The devaluation of sterling nevertheless spelled catastrophe for the firm. Our prices had always been quoted in English currency and, when they had to be adapted to the new value of sterling, exports decreased by two thirds. We, therefore, had to make a gigantic drive in order to find new channels of trade other than the Empire markets on which we had previously concentrated most of our efforts. We then decided to set up a house in Paris, the better to study the French market; similarly at Buenos Ayres, for the Argentine. At the same time, we developed the Italian market in conjunction with the technical workshop in Milan. We also decided to organize business trips to all South American countries, to the West-Indies, the Far East and especially to China and Japan. In brief, no possibility was ever overlooked and hundreds of thousands of Swiss francs were expended in order to win these new world markets and to reestablish the firm on a sound footing. That we succeeded in our efforts was also due to the really unique performance of our chronometers, especially in tests at the Kew Observatory. In effect, up to 1939, Rolex obtained the best timing results recorded by this institution for the whole of the wrist-watchmaking industry and for all sizes, from the smallest ladies watch to our "Prince" caliber. Twice, in 1925 in 1927, the official annual report mentioned the remarkable performance of the two smallest Rolex calibers. One of these obtained the best result ever registered for so minute a movement: 86.5 points and dimension "especially good." So what makes a Rolex Oyster an Oyster? The winding crown acts like a screw-on cap, or micro jar-lid, and has watertight gaskets in it. The best way to think of it is to imagine a submarine hatch that is threaded and has to be twisted or spun open or closed. In 1926, at age 45, Hans Wilsdorf had successfully designed, manufactured and patented the waterproof Rolex Oyster. The challenge he faced was, how to communicate the value proposition of such a product? 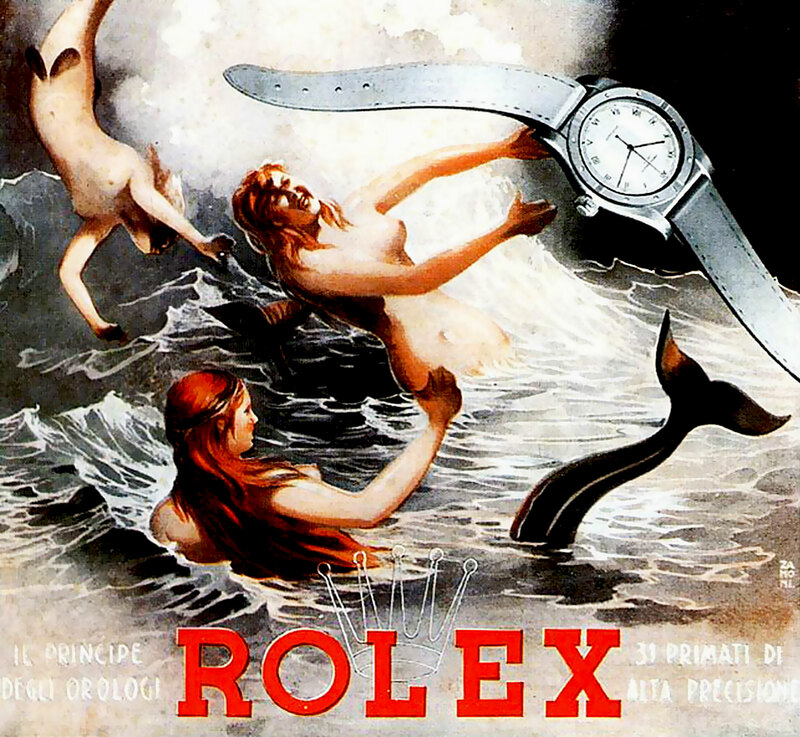 Hans came up with the idea of associating the fantasy of mermaids with the waterproof Rolex Oyster as seen in the 1926 Italian Rolex advertisement seen below. 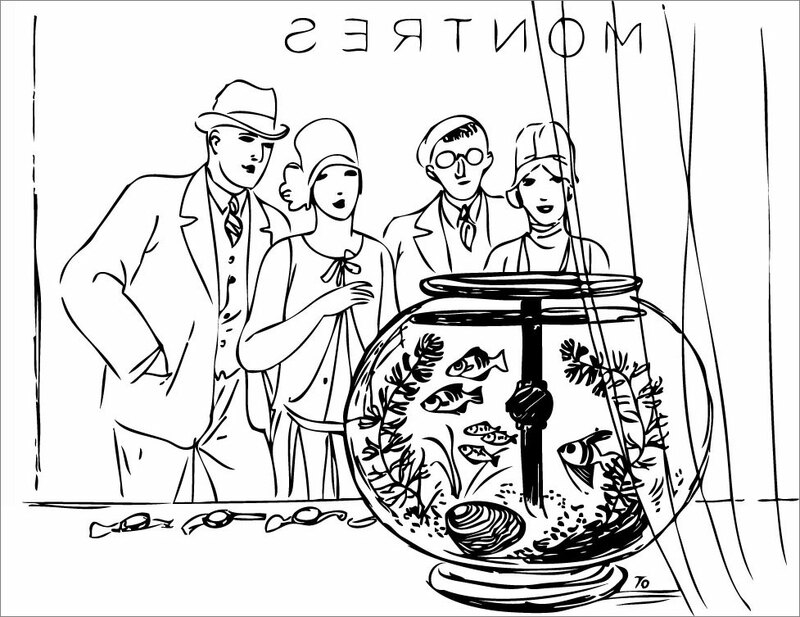 At the same time, as seen in the Rolex illustration below, Hans Wilsdorf came up with a brilliant idea to have authorized Rolex dealers display the waterproof Rolex Oysters watches, in fish-tanks, in their windows–with real fish swimming around the watch!!! This, of course, gained the fascination of many passer-bys. 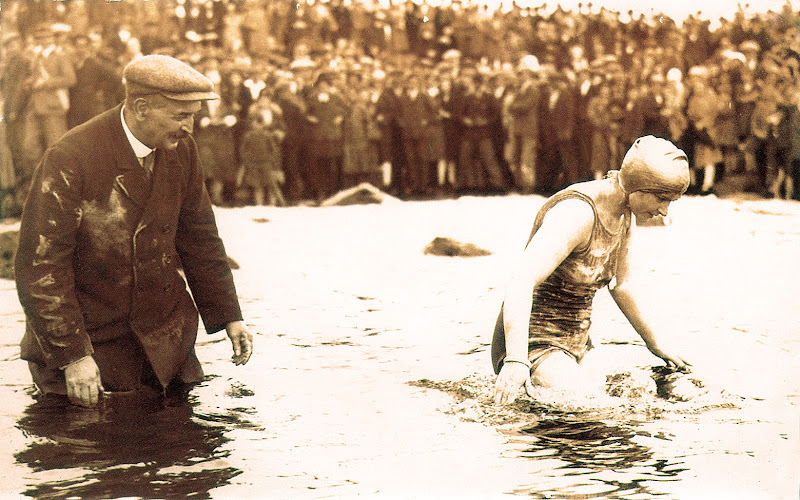 In 1927, Hans Wilsdorf learned about a swimmer named Mercedes Gleitze, who claimed to have been the first woman to swim all the way across the English channel. He also read about how another woman claimed to achieve the same feat soon after, in even less time. The second woman, soon afterward, admitted she lied. As a result, people pointed the finger at Mercedes Gleitze and accused her of lying as well. Mercedes was enraged by the accusation, and declared, that she would "vindicate" herself, but swimming it a second time. Upon learning of this upcoming event, Hans Wilsdorf contacted Mercedes Gleitze and offered to hire her as the first Rolex ambassador to endorse the brand, by wearing a Rolex Oyster (strangely, on a necklace) on her vindication swim across the English Channel. The photo below was taken on the beach in France, as Mercedes dove into the water to begin her "vindication" swim. To learn all the details of the Mercedes Gleitze vindication swim, please click here. The challenge with Mercedes Gleitze's "vindication" swim was that after 10 hours, she only made it about 4/5 of the way across the channel and had to be pulled-out since she almost froze to death. The vindication swim was not a complete success, but the Rolex Oyster, strapped around her neck, came out of the water in perfect working order. 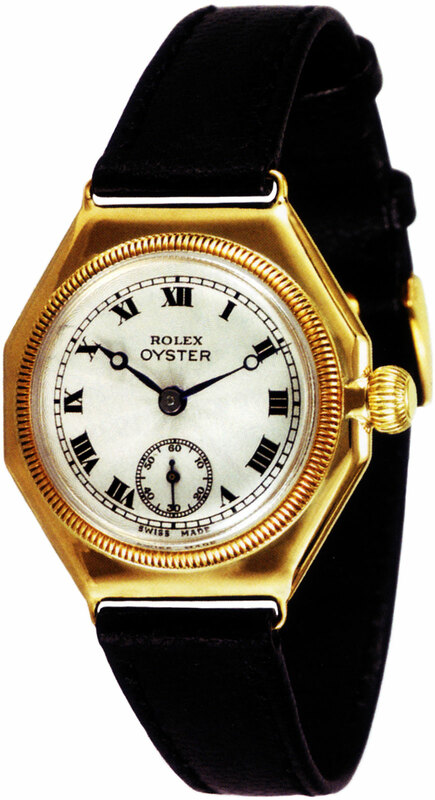 The photo below is of Mercedes Gleitze's actual Rolex Oyster which she wore around her neck, during her vindication swim. Hans Wilsdorf had a brilliant marketing mind, and he successfully capitalized on the public relations exposure generated by Mercedes Gleitze's vindication swim. Hans Wilsdorf finally found his real Mermaid to showcase his Oyster. 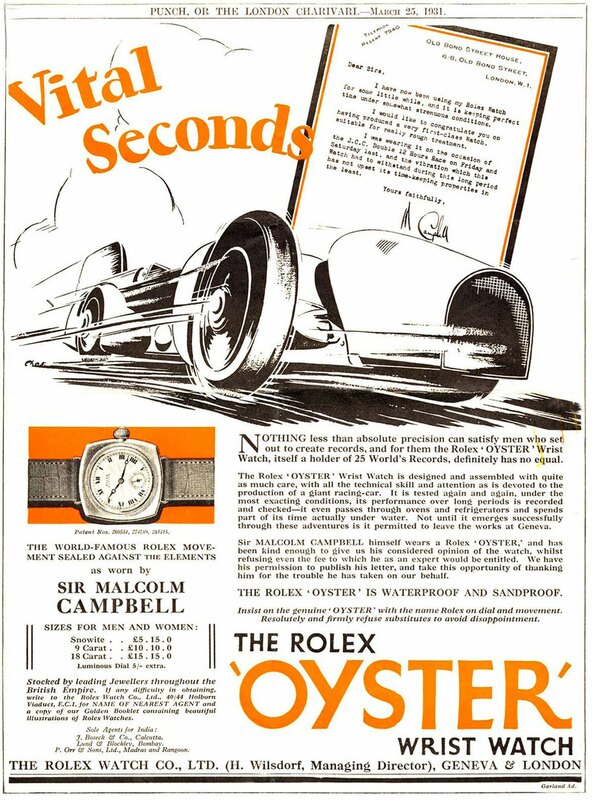 The following Rolex advertorial ran on the cover of the London Daily Mail Newspaper on November 24, 1927, and it showcased the Rolex Oyster along with Mercedes Gleitze. Rolex continued featureing Mercedes Gleitze as a brand ambassador through the 1930s as seen in the magazine ad below. The next two photos are from a Rolex Oyster brochure, and the first image depicts Hans Wilsdorf observing the Rolex advertorial (pictured above) which he placed in the London Daily Mail on November 24th, 1927. This next illustration depicts Mercedes Gleitze as she emerges from the English channel. In the past, I wrote a detailed article about Merceds Glietze swimming the English Channel. 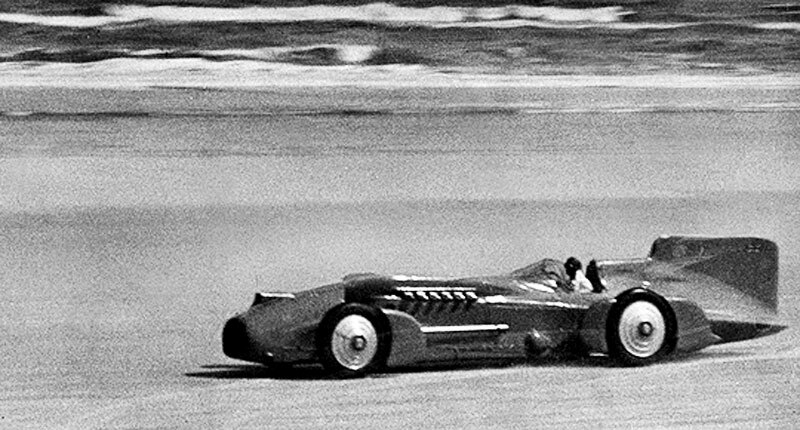 Two years prior to the introduction of the Rolex Oyster, a British man, named Malcolm Campbell developed a peculiar hobby of shattering on-land speed record in a motor-car. 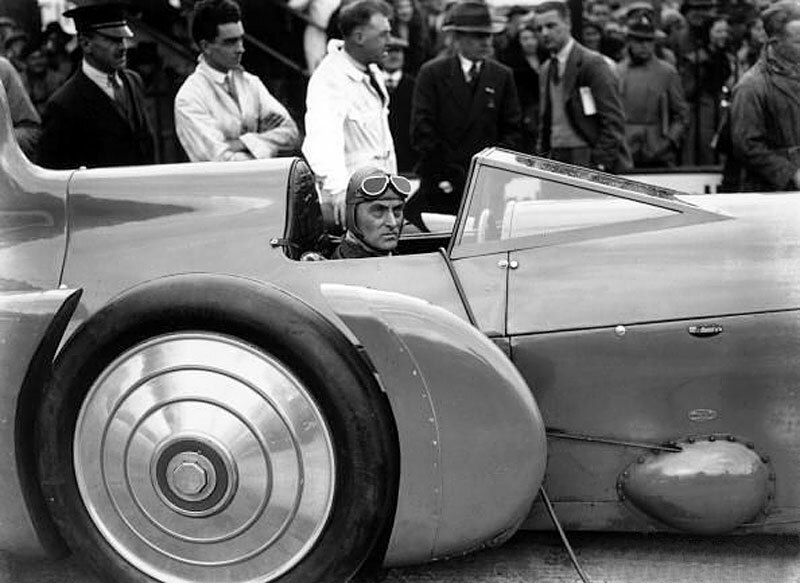 Malcolm Campbell broke the world land speed record 9 times between 1924 and 1935. 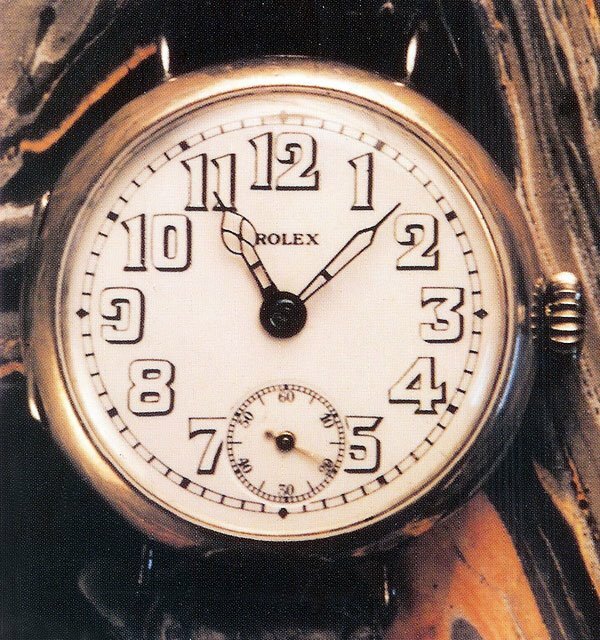 Hans Wilsdorf learned that Malcolm Campbell had been wearing a Rolex when he broke the speed record and asked his permission to publicize this fact. Campbell agreed, but refused to accept any payment for his endorsement, thus making Campbell the first male Rolex Ambassador. On February 22, 1933, Sir Malcolm is seen below, setting another world speed record at Daytona Beach, Florida, U.S.A., this time he achieved 272.46 MPH (435.94 KPH). This version of the Bluebird must have been the inspiration for the Batmobile in the Batman movies. 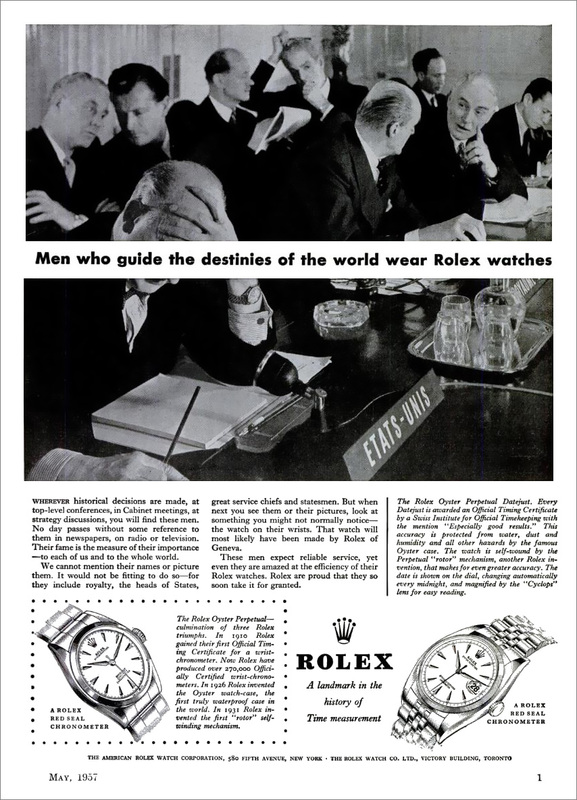 The following Rolex Advertorial appeared in the London Punch on March 25, 1931. The Development of the Rolex Oyster was an incredible horological achievement, but the challenge was that it made it more difficult to manually wind the watch because you had to unscrew it first, then wind it, then re-screw the Oyster crown. After Hans Wilsdorf successfully brought the Rolex Oyster to market, he turned his attention to the other Achilles' heel of wrist-watches, and that was the lack of their ability to self-wind themselves. Inventing the automatic, or perhaps auto-magic, wristwatch that could wind itself was the dream of the ages in the horological world. For centuries, many famous watchmakers had tried to perfect the automatic or self-winding watch, but none were successful. This fascinating Rolex ad from the 1950s tells the story about how Rolex's brilliant chief technical director, M. Emile (Emil) Borer figured out how to perfect Abraham-Louis Perrelet's self-winding watch he invented centuries prior in 1770. Emile Borer (pictured below) was the Chief Technical Director of Rolex was mentioned in the ad above, as having been the person at Rolex who is credited with figuring out how to make the automatic movement work correctly by inventing and perfecting the modern rotor system. 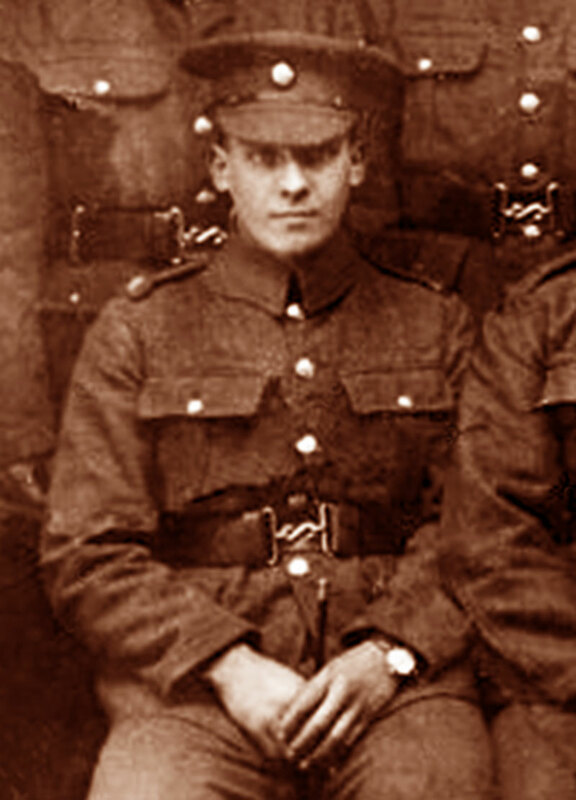 Emile was the son-in-law of Jean Aegler. 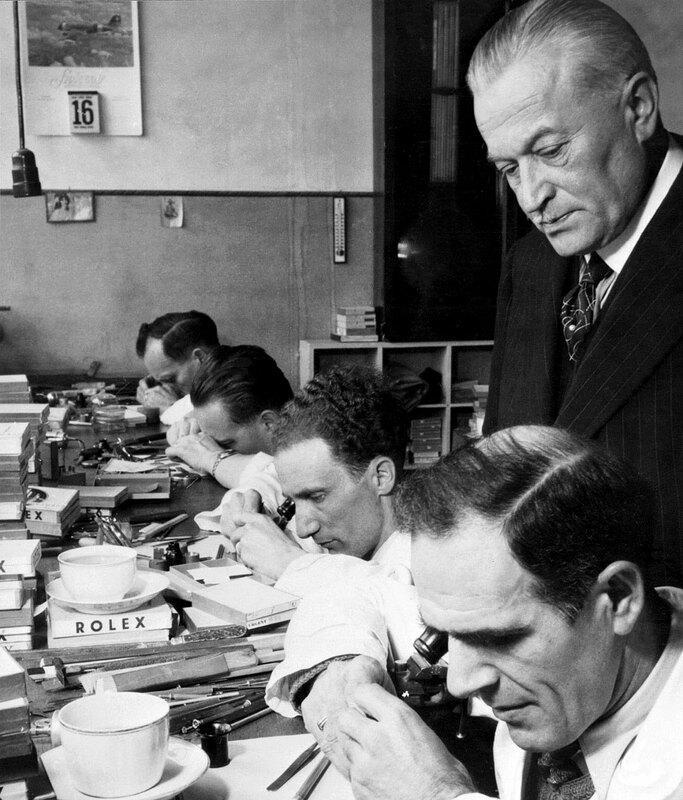 Jean Aegler was the founders of Aegler Workshop, who provided Rolex with all their movements. 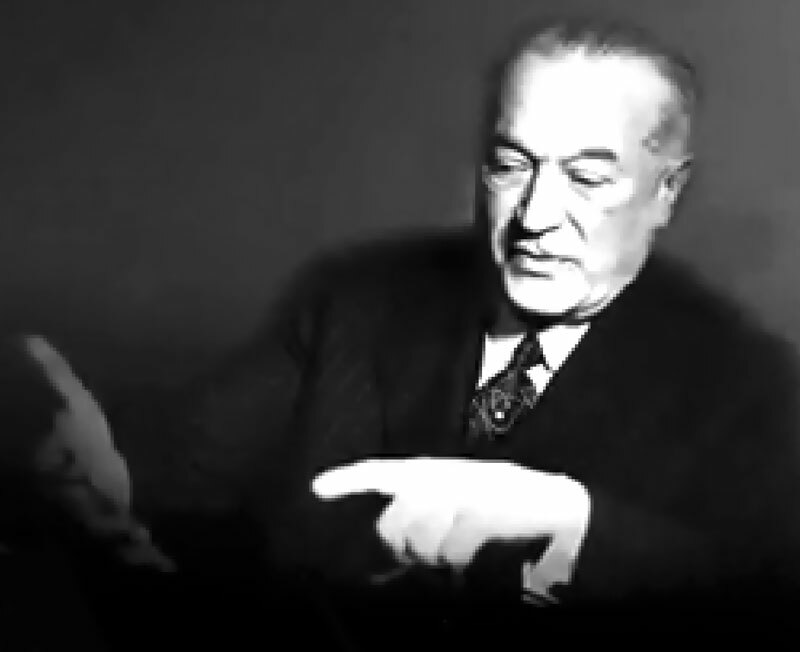 Emile Borer joined Aegler Workshop as an engineer during World War I, and he soon became responsible for developing new technology. 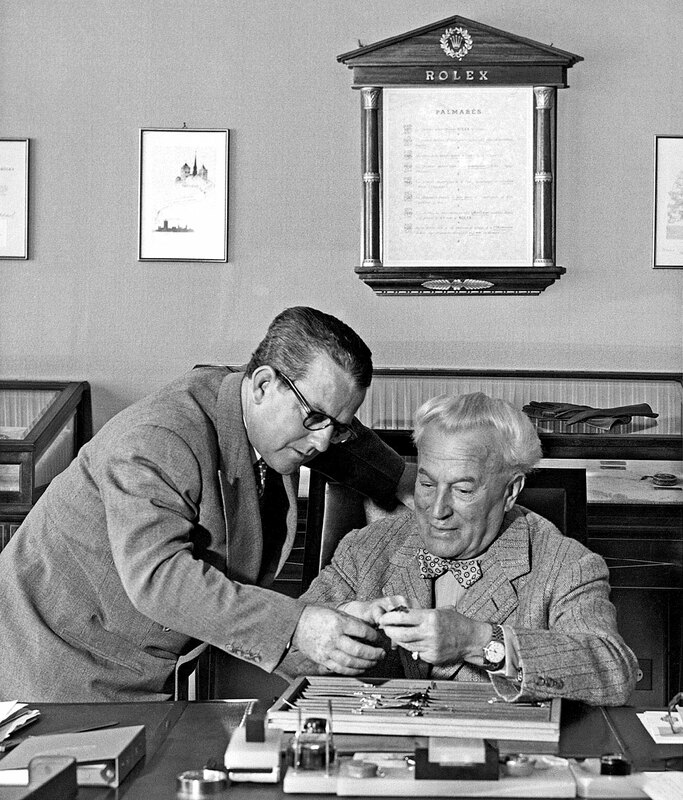 In 1944, Emile Borer became the General Manager of the Aegler Workshop, which remanded the primary supplier of Rolex movements until Rolex purchased Aegler Workshop in 2004. In 1931 Rolex patented the Perpetual rotor which automatically wound the watch, thus eliminating the need to ever wind it again!!! This not only made it more convenient but also more accurate because the watch would never stop so long as you wore it. The watch pictured above and below was made in 1931 and Rolex put an exhibition case back on it to easily show potential consumers how it worked. As you can see in the photo below there is a rotor that says "Rolex Auto Rotor" which automatically spins clockwise or counter-clockwise just from the movement of your wrist, thus "Automatically" winds the mainspring. In other words, even the slightest movement of your wrist (using gravity) will wind the watch, thus keeping the mainspring at optimum tension. Rolex based the design of their perpetual rotor system on one that Abraham Louis Perelet developed in 1770, and in the years before Rolex perfected their methodology, there was a company named Harwood that created a self-winding rotor system that only moved clockwise, but had many challenges. By creating an auto-winding or self-winding wristwatch, Rolex once again revolutionized the watch–and again, Rolex was not the first to explore creating a self-winding watch, but Hans Wilsdorf and Rolex were the first to perfect it, patent, and bring it successfully to market. Tommy Taylor is a daily reader of Jake's Rolex World and he sent in some amazing photos of very, very rare Hans Wilsdorf brand watches. It turns out that in 1934, Hans Wilsdorf launched a brand of watches with his own name on them along with the Geneve, and Geneva designation on the dial. When we think about the Rolex brand today, we think about a brand Hans Wilsdorf created more than a century ago. For the last 30 years, since the early 1980s, Rolex has become the International Mark Of Success, and as we have learned in this story, it was not always that way. We learned Hans Wilsdorf moved Rolex headquarters from London, England to Geneva, Switzerland in 1928, because among other variables, his name was clearly German, and from the years between World War I, and World War II there was tremendous anti-Germen sentiment in the U.K. If you think about it, The Hans Wilsdorf brand watches, as pictured above and below, began their life in 1934 and ended in 1940. In other words, Hans Wilsdorf is clearly a German Name, as a matter of fact, a name could not be more stereotypically German sounding than Hans Wilsdorf. 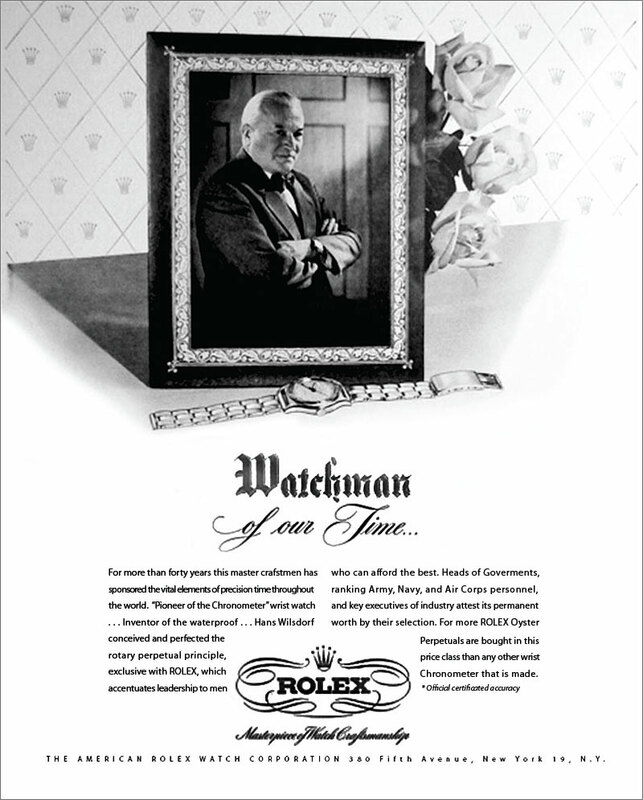 Once Hans Wilsdorf successfully moved Rolex to Geneva, Switzerland, he finally felt comfortable enough to launch a brand with his Germanic first and last name, but he likely discontinued it in 1940, because there was, once again, tremendous anti-German sentiment in all the major markets where he sold his watches, including the United States and in the U.K., and in France. I only bring this up, because if the Hans Wilsdorf watch brand was launched today, in 2011, it would probably be very successful. The point being, it is easy today to look back and assume Hans Wilsdorf's life and success came easy, but if we delve into the details, we find his success has hard-fought and hard-earned. 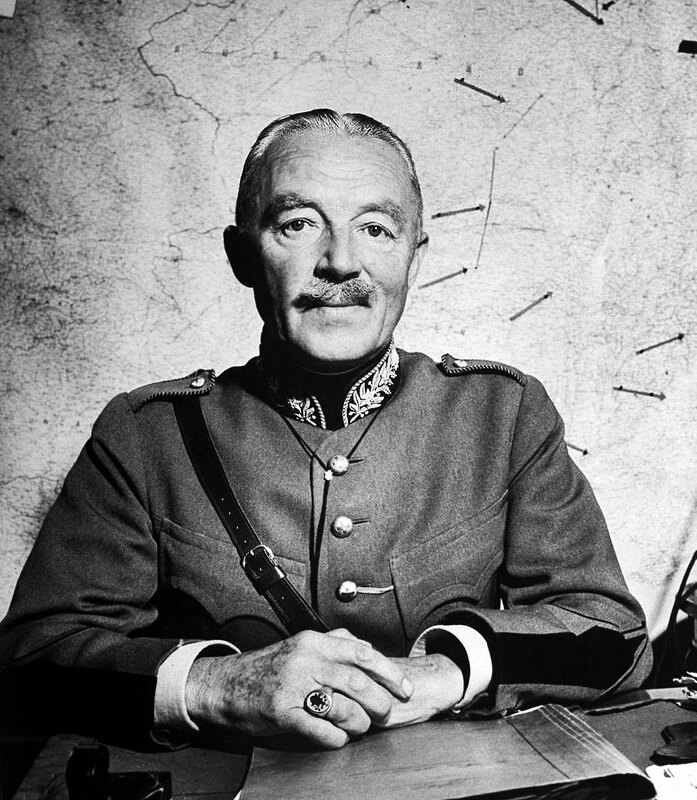 Hans Wilsdorf is pictured below in undated photo in the 1940s. There is a line in the Steve Miller song Jet Liner that comes to mind when he sings "You know you have to go through hell before you get to heaven." I believe Hans Wilsdorf experienced immense challenges and remarkably, always overcome them!!!! Hans Wilsdorf's story is as much about perseverance and tenacity, as it is about success. 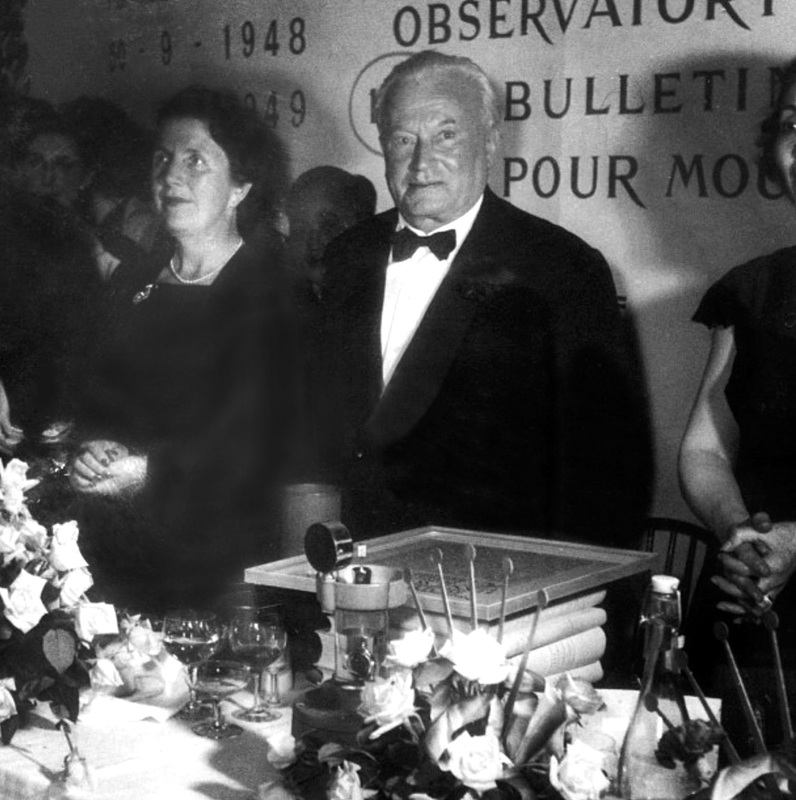 The photo below, from the Rolex archives in Geneva, Switzerland shows Hans Wilsdorf in 1942. Now let's get back to the Hans Wilsdorf watches. Tommy Taylor mentioned he has counted 9 of these watches in the last 20 years, and he has owned three of them. These watches have Hans Wilsdorf signed movements that were manufactured by the Beguelin/Damas company, and they have 10.5 ligne movements in a basic Rolex Speedking size Oyster case with no reference numbers. John Brozek took the photo above and the one below of his Hans Wilsdorf, Geneva watch that has a 8.75 ligne in an Egyptian Oyster Case. The dial is also original. Panerai was an Italian company with a fascinating history, which became part of Rolex history in the mid-1930s. 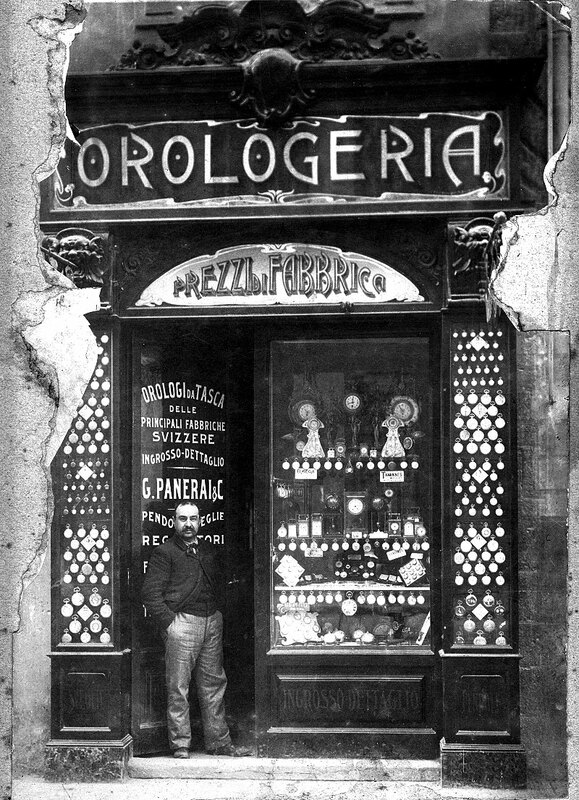 The photo below shows Giovanni Panerai (1825-1897) standing in front of his ’Orologeria Svizzera" watch store. The first store was established in 1860 on the historical bridge “Ponte delle Grazie” but had to be moved due to the removal of the shophouses in 1876. The image below also shows the orignial Orologeria Svizzera, but it appears the photo was taken after they expanded. The visual clue is the sculped eagle above the store seems to have moved. 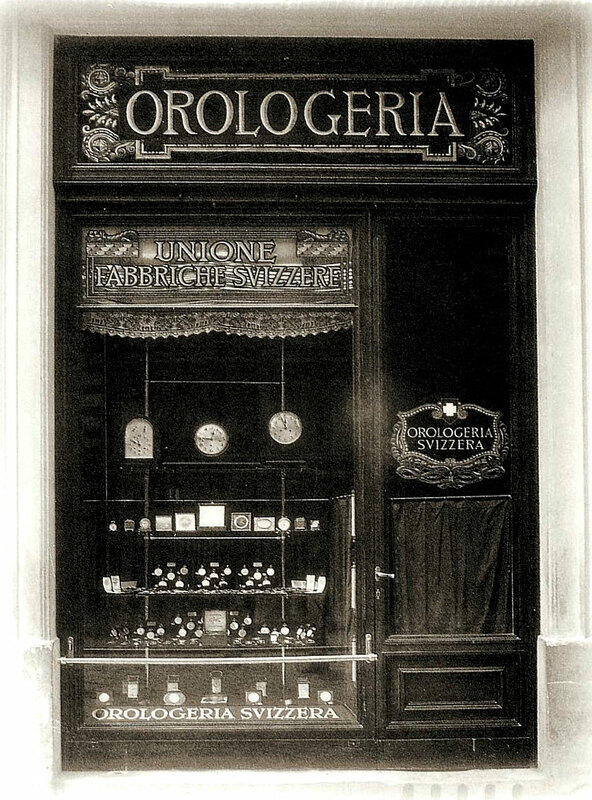 In the 1920s the Orologeria Svizzera watch store, now being run by Giovanni’s grandson Guido Panerai moved to the Palazzo Arcivescovile in Piazza San Giovani, in Florence, Italy where it remains today as a Panerai store. Guido expanded the family business and established the first watchmaking school in Florence. 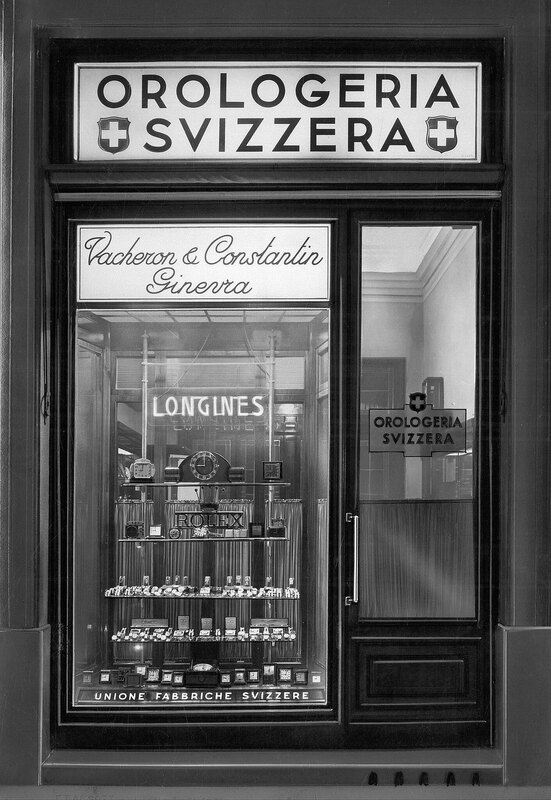 The next photo of the Orologeria Svizzera seen below was taken around 1934. Notice it has signs in the window for ROLEX, LONGINES, and Vacheron & Constantin. Also, notice there are primarily wristwatches and desk clocks in the window and no pocket watches. This photo appears courtesey of Maria Teresa Panerai. Giovanni Panerai (1825-1897), opened up a watch shop in 1860. 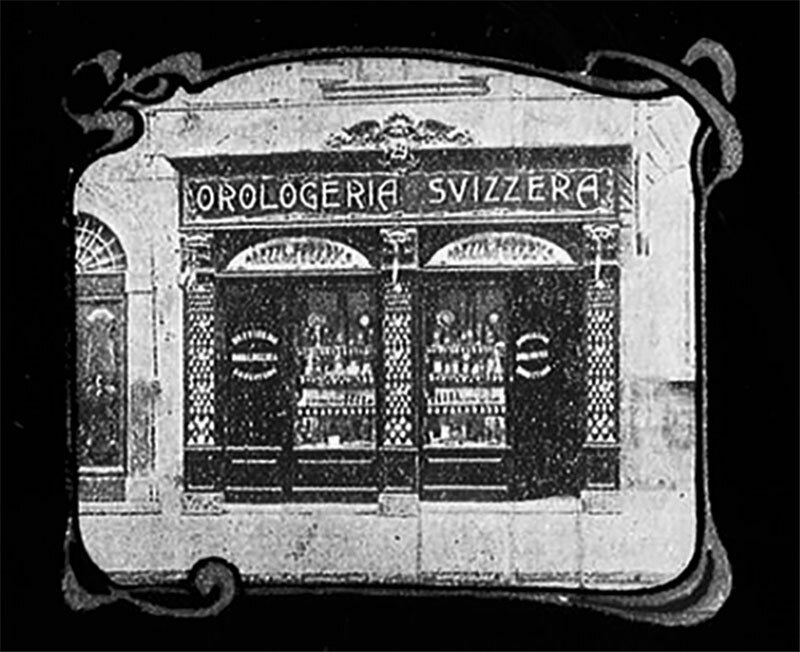 The shop was passed on to his son Leon Francesco Panerai (1851-1918). The shop then went to Leon’s son Guido Panerai. When Guido married in the early 20th century, he took over his wife’s family business, a mechanical workshop, and founded Guido Panerai e Figlio. Guido died in 1934 and his son Guiseppe Panerai (1903-1872) took over the business. 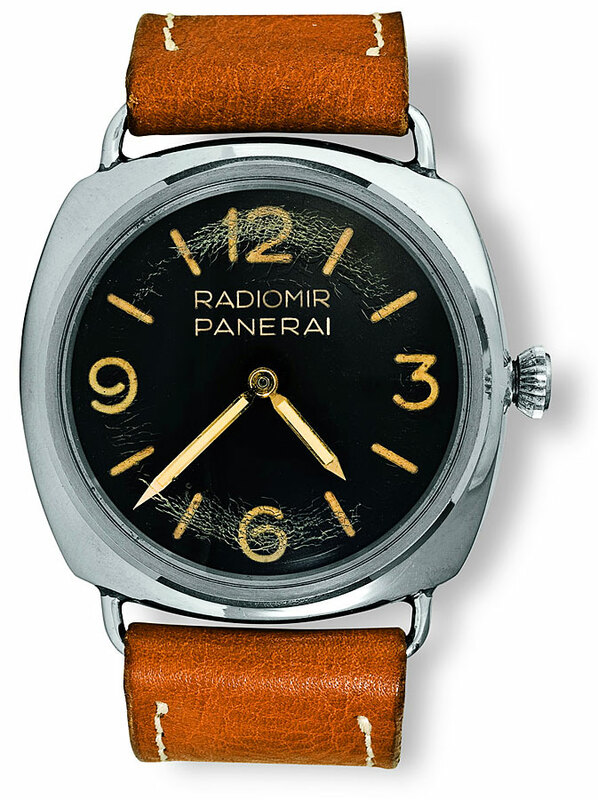 By the mid-1930s, Panerai became a huge contractor for the Italian Royal Navy for all kinds of technical equipment. 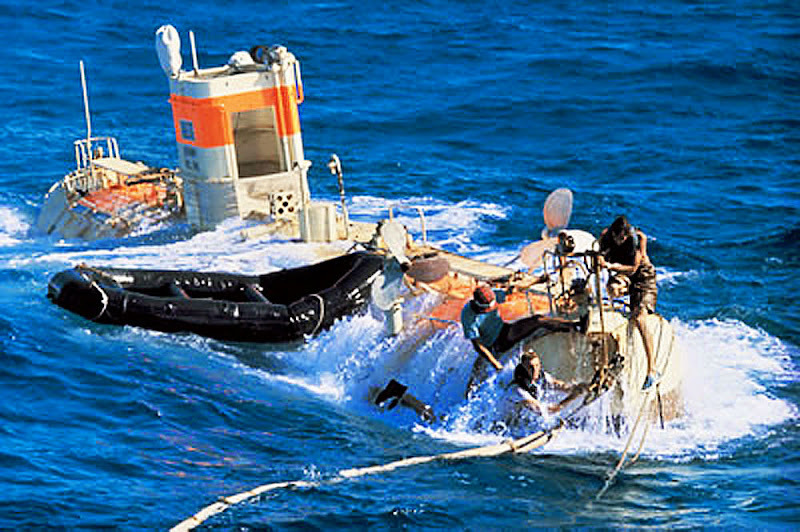 The Italian Navy was developing special underwater demolition vehicles and their divers needed special instruments (compasses and depth gauges) and waterproof wristwatches. Since Panerai wasn’t a watch manufacturer, Giuseppe Panerai used his great relationship as a successful Rolex retailer and asked Rolex to supply a special watch for divers. 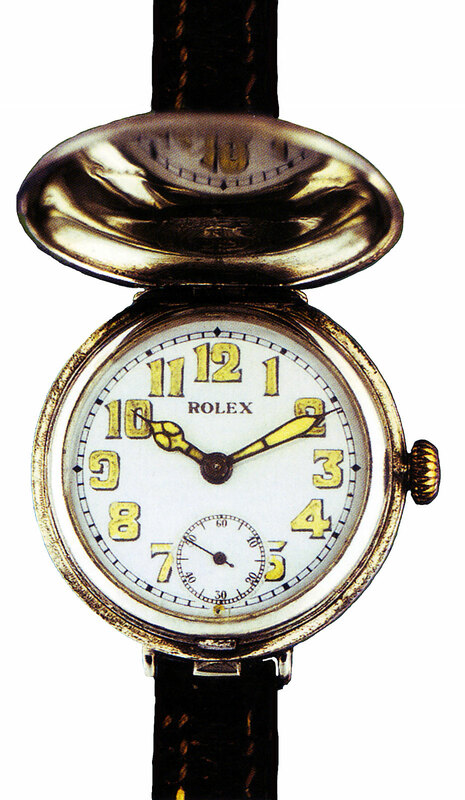 In October 1935, Rolex sent an oversized Rolex Oyster Ref. 2533 with a case made of 9ct gold to Florence. This watch was based upon a 47mm Rolex Oyster pocket watch. 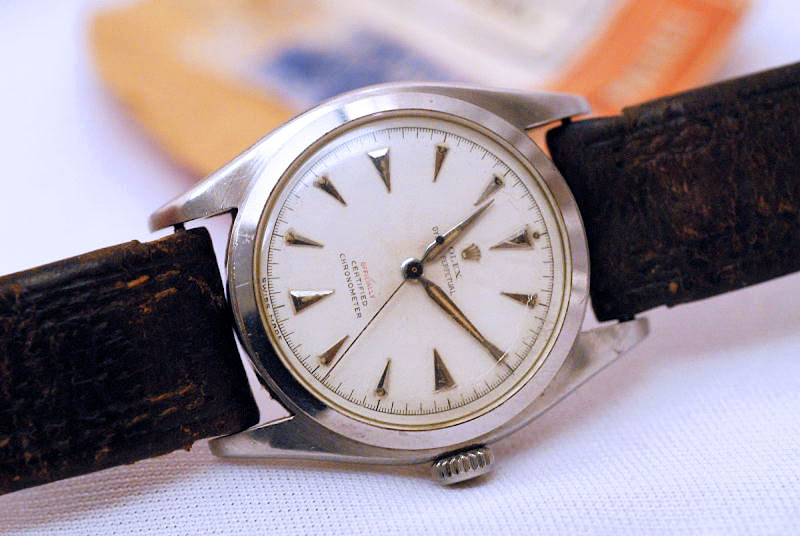 The reciept for the Rolex Reference 2533 is pictured below. 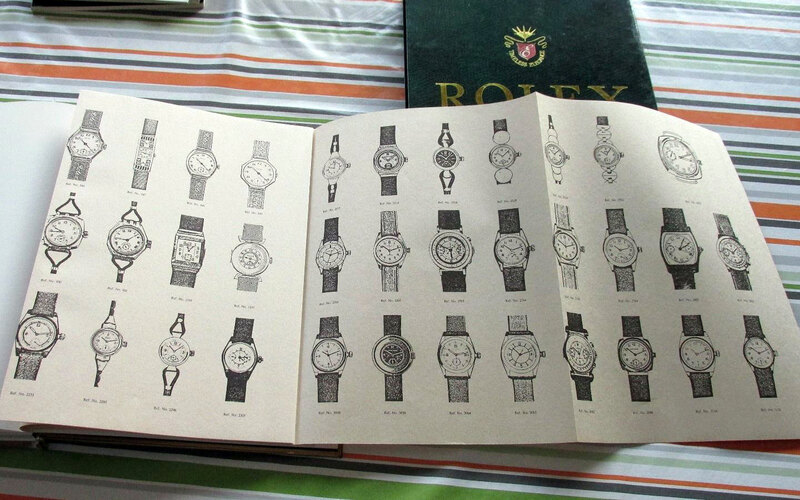 The image below shows a Rolex catalog from the mid-1930s and if you look closely in the upper right-hand corner, you will notice an unusually large watch with no strap. That is the Rolex Reference 2533 that became the basis for all vintage Panerai watches. After successful tests, Rolex made a steel version of the watch and made the first series of watches for Panerai. The image below shows a Rolex made Panerai Reference 3646 with the now classic 3, 6, 9, 12 RADIOMIR PANERAI dial. This watch is basically a Rolex watch with a dial made by Panerai in Italy. 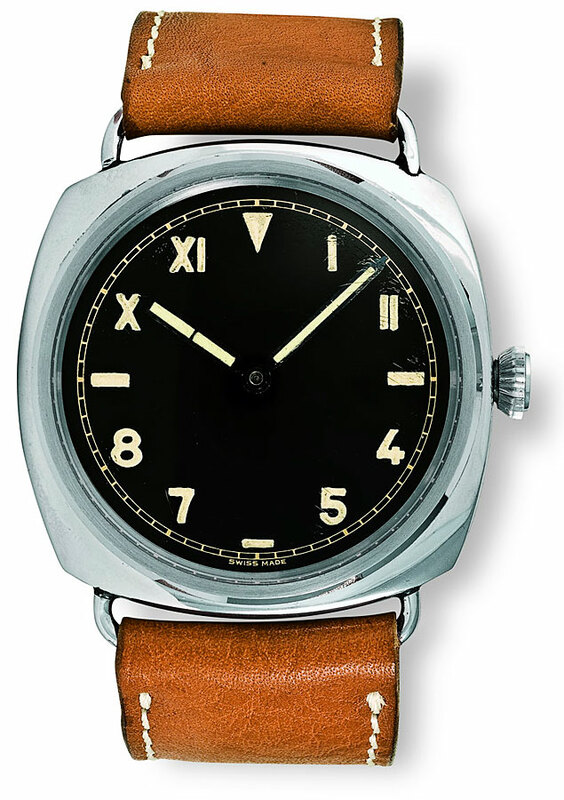 The Rolex made Reference 3646 Panerai watch pictured below featured the now classic art-deco "California" dial. Notice it does not have any branding on the "California" art-deco dial, and you can't tell from the photo, but the watch was a whopping 47mm. 47mm was enormous at the time since the average male Rolex was around 32mm. Rolex made and furnished 100% of these watches including the error-proof California dial. A fascinating consideration is whether or not Hans Wilsdorf realized at the time that he was beginning another wrist-watch revolution by making the Panerai Diving watches. Approximately 18 years after he made the first Panerai, Rolex introduced their first Rolex diving tool watch named the Submariner, which has gone on to become the most iconic and popular tool watch in history. You can learn, much, much, much more on the fascinating subject of the Rolex Panerai watches by reading "Panerai & The Italian Royal Navy." I also publish Jake's Panerai World which you can always visit at PaneraiMagazine.com. The photo below is titled, "The Panerai Time Machine." 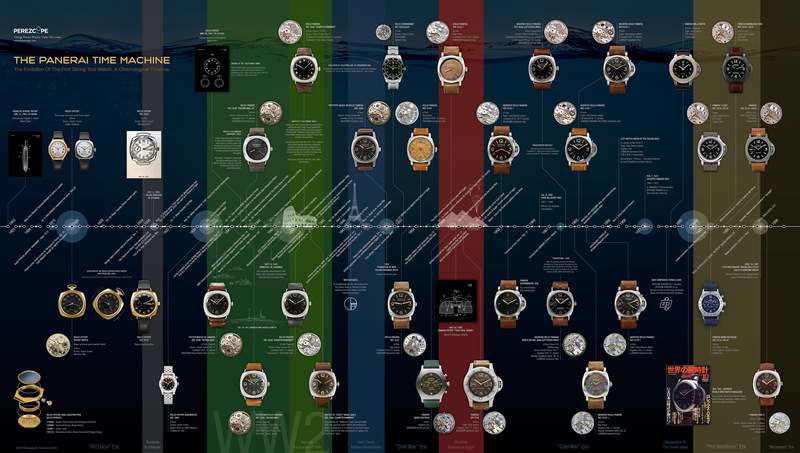 This magnificent timeframe poster charts the REAL history of Panerai vintage watches. I highly recommend right-mouse clicking on the poster and opening them it in a new window so you can check out the incredible high-resolution details. Jose created this brillian timefram poster, to which I contributed some input. Jose is what I refer to as a brilliant Horological Forensics Investigator. Jose and I often remind me of Sherlock Holmes and Dr. Watson, in the sense we have made so many discoveries together, and I have to say Jose is beyond brilliant. Rolex suffered through World War II and Hans Wilsdorf must have been extremely frustrated because the war seriously impeded his progress because it was difficult to ship product and resources in and out of neutral Switzerland. Keep in mind, that prior to World War II breaking out, Rolex was on-fire with growing their market-share since they had a patent on both the waterproof Oyster case as well as the automatic "Perpetual" movement. 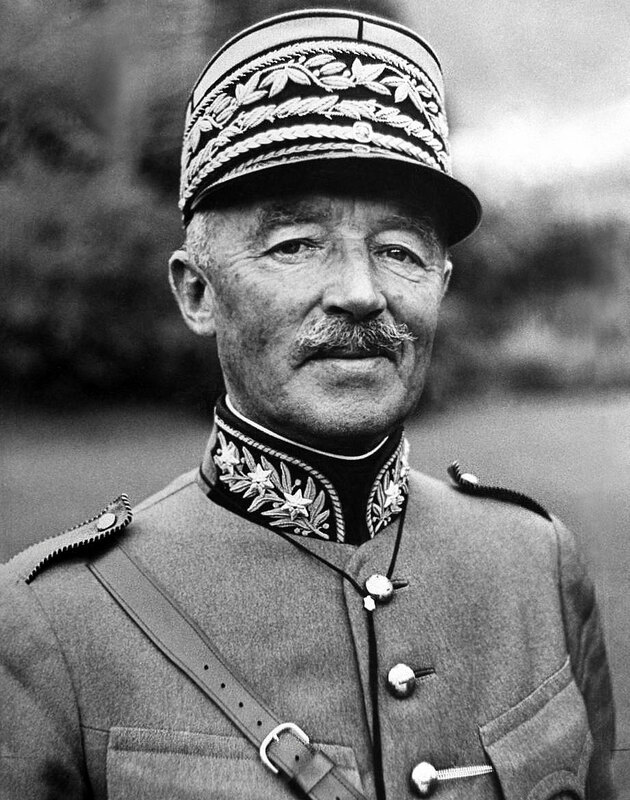 General Henri Guisan is pictured below in next 3 photographs taken in 1942 at his headquarters in Switzerland. This first image shows Guisan with a European map on the wall behind him which is focused on Switzerland. The Swiss were very uncomfortable with Adolph Hitler and the Nazi's in general. 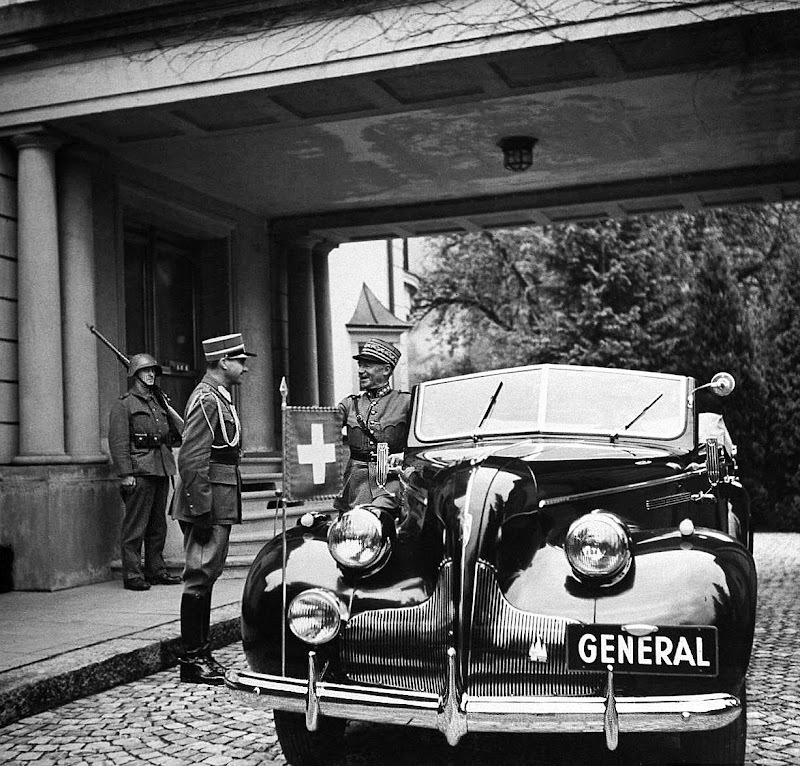 During World War II, the Nazi's dominated and occupied most of Europe, but never entered Switzerland. It has been argued, the Nazi's never invaded Switzerland because of the surrounding mountain terrain which would have made it difficult, but other theories suggest that Hitler was pre-occupied with other challenges. Either way, the Swiss were really freaked-out by Hitler and they chose their top military leader, General Henri Guisan to become their Commander and Chief during World War II. Guisan devised a philosophy, that argued the Nazi's "will NEVER take Switzerland!!!" and that every Swiss citizen should fight to the death before being taken alive. After General Eisenhower came over and freed Europe from Nazi tyranny, Rolex started moving forward and regaining their amazing pre-war momentum. In 1946, Rolex manufactured their 50,000th Officially Certified Swiss Chronometer and Hans Wilsdorf decided he wanted to give it to somebody special. Hans Wilsdorf offered this milestone Rolex to General Guisan and Guisan accepted. This is interesting from a strategic marketing perspective, particularly, when you think about the mindset of Rolex in 1946, and contrast that with today's Rolex mindset. You see, in 1946, Hans Wilsdorf and company, had something to prove to themselves–and the world. By accepting the 50,000th Officially Certified Rolex Chronometer, Rolex began a strong, ambitious, perpetual, uphill climb that would set a ferocious pace that would continue to place Rolex watches on the wrist of many high and low-profile leaders and achievers. It took Hans Wilsdorf approximately 40 years to make 50,000 Officially Certified Rolex Swiss Chronometers and profoundly, only an additional year to reach their 100,000th Chronometer!!!! 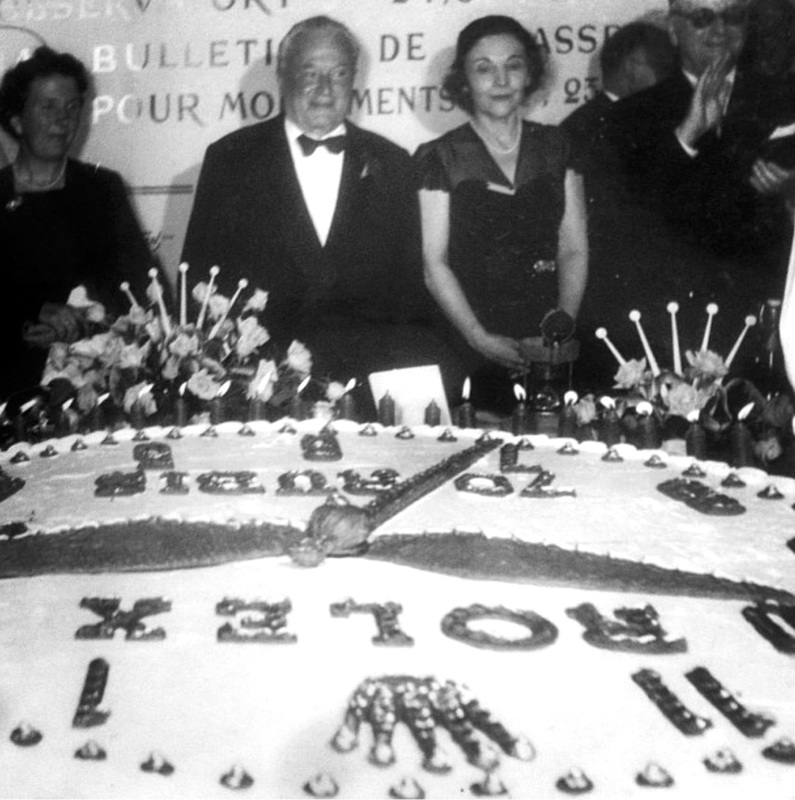 Hans Wilsdorf ambitiously decided that for the 100,000th Rolex Chronometer, he wanted to aim even higher, so he turned to his friend, General Guisan and asked him to offer it his friend, Sir Winston Churchill. 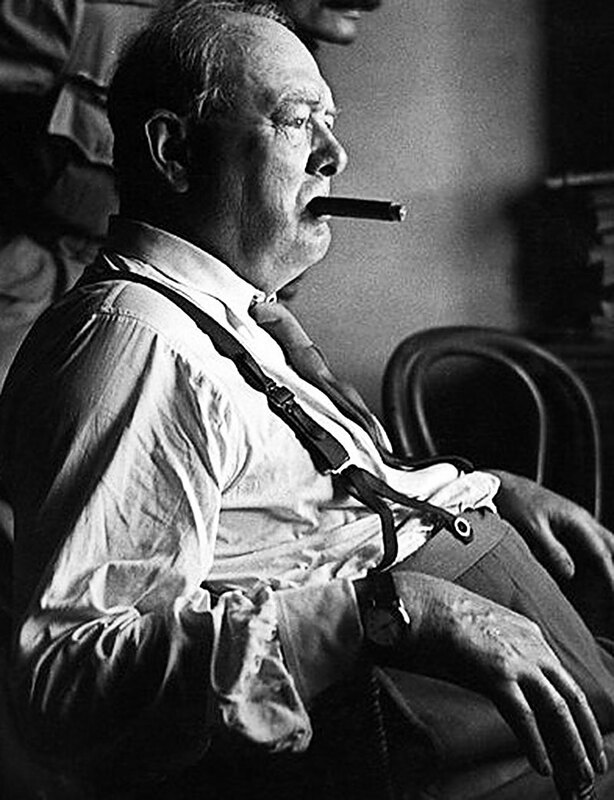 Guisan agreed and approached Sir Winston Churchill who accepted. 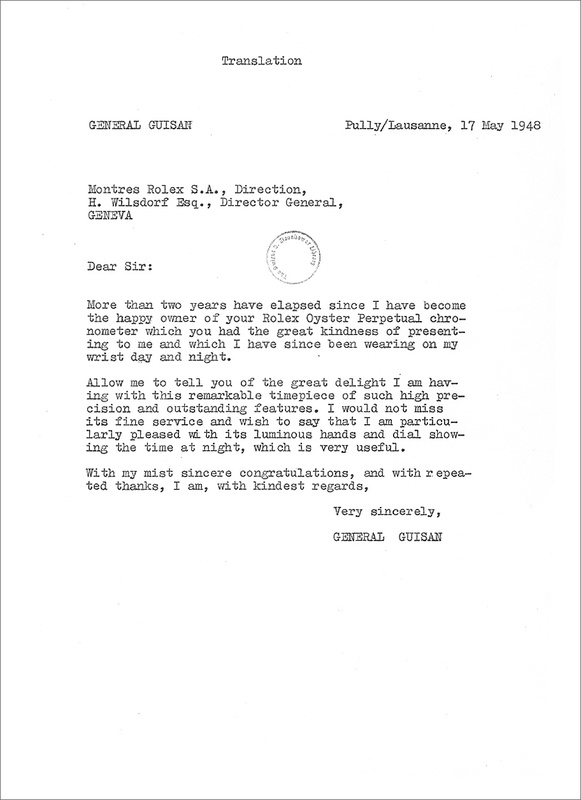 The following letter is from the Eisenhower Presidential Library archive and shows how Wilsdorf adroitly leveraged and networked his way up the ladder. 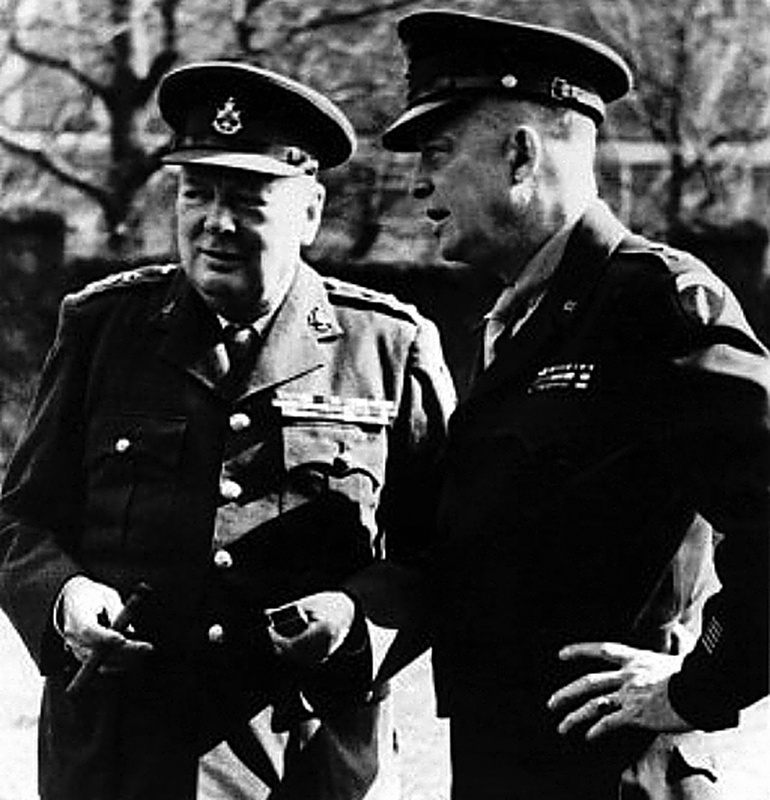 Less than a year later, Rolex had already produced their 150,000th Chronometer and Wilsdorf again decided to aim even higher and offer it to the man who was the architect of the D-Day landing of the American's and Allied Forces, which freed Europe–5 Star General, Dwight D. Eisenhower. 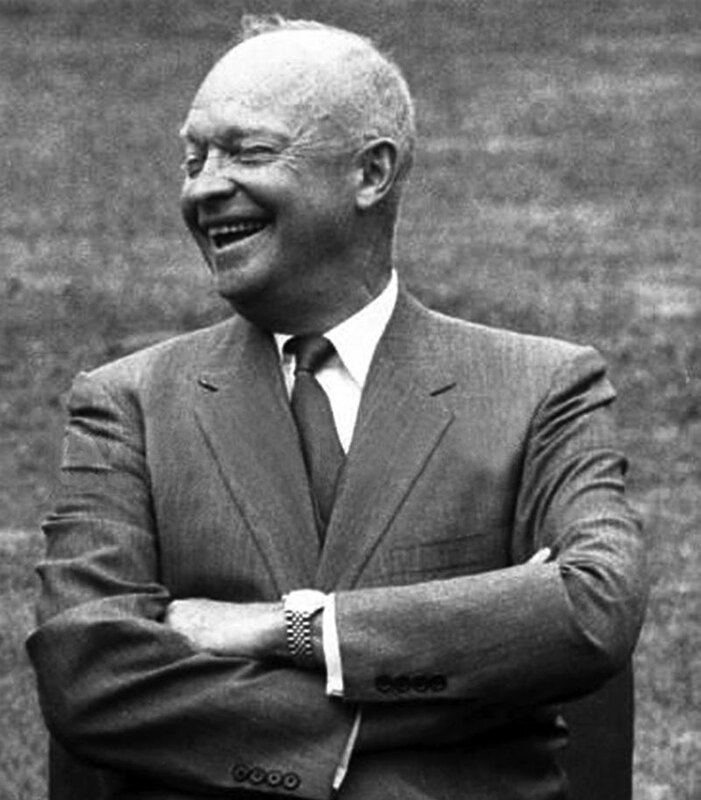 Eisenhower accepted, the yellow-gold Datejust, which at the time was Rolex's most state-of-the-art watch. It is unlikely that Wilsdorf or Rolex realized at the time, that Eisenhower would go on to become the next President Of The United States. 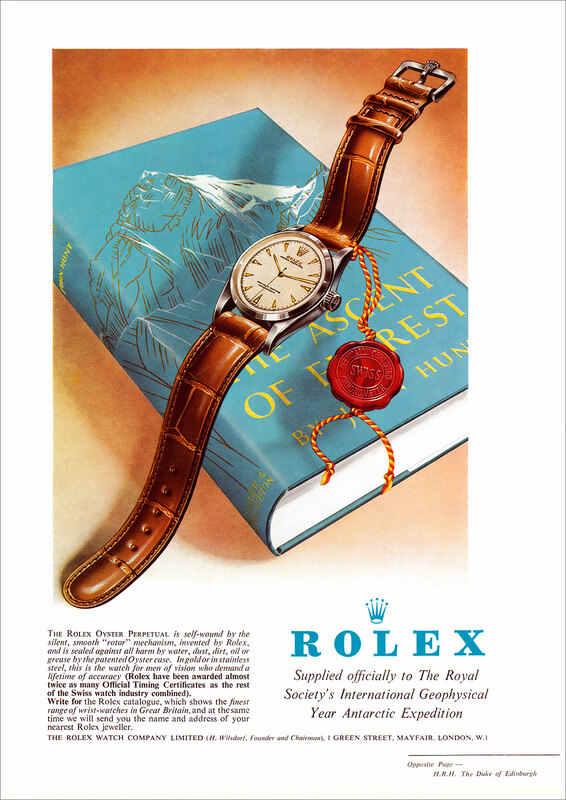 The fact that Eisenhower became the President, created a superb showcase marketing opportunity for Rolex which no amount of money could ever buy. 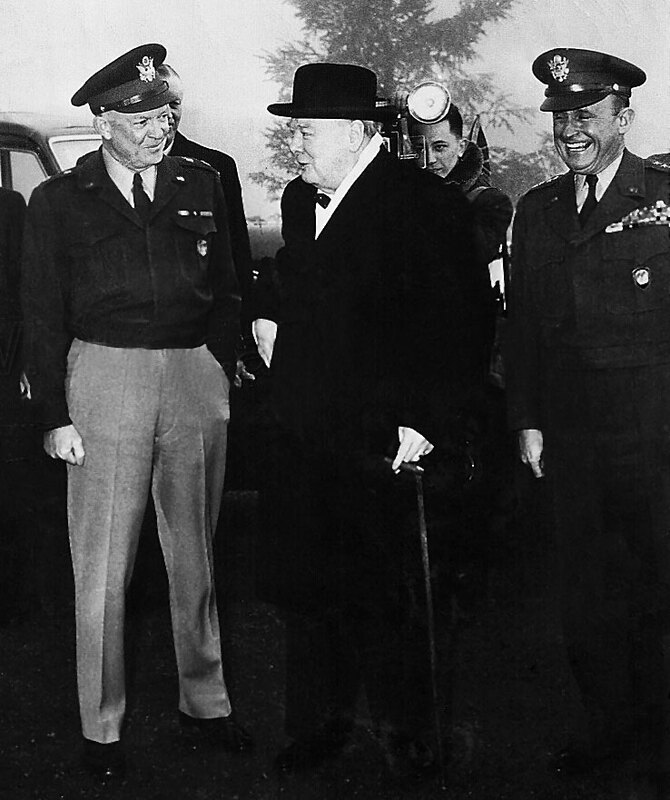 Eisenhower is pictured below with Churchill, ironically next to U.S. General Gunther (far right) who became the recipient of the 200,000th Rolex Chronometer which was also a yellow-gold Datejust. In October 1947, at Edwards Air Force Test Center, Captain Charles "Chuck" Yeager forever changed history, when he was the first pilot to fly faster than the Speed of Sound. And, yes, you guessed it! 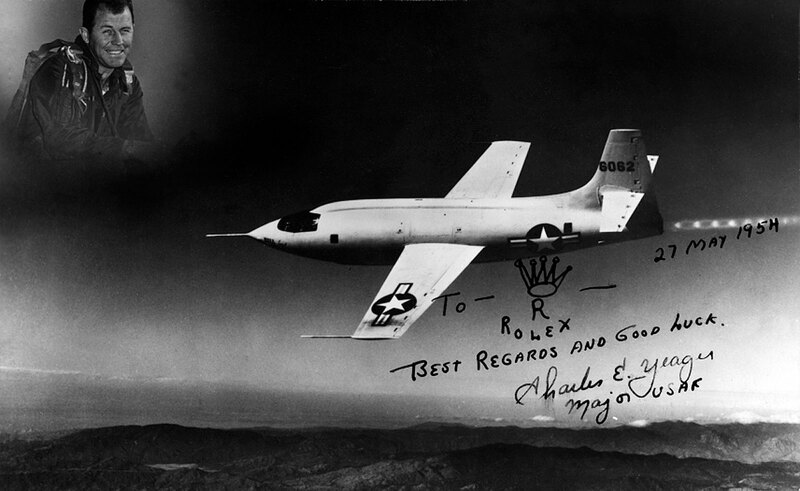 Chuck Yeager was wearing his Rolex Oyster Perpetual wrist-watch, that he purchased himself. So what does this mean? What kind of man would wear a Rolex Oyster Perpetual in such an environment? A few days prior to his record flight, Yeager was seriously injured in a horse riding accident and suffered two broken ribs. The injury would jeopardize his flight status resulting in the removal from the mission. Scared, he went to a veterinarian for treatment and only told his wife about the accident. He also told his friend and fellow project pilot, Jack Ridley about the accident. Yeager, on the day of the record flight, had trouble manipulating the closure of the X-1's hatch, and could not seal it properly. His pal, Jack Ridley, improvised a clever leverage device made from a broom handle, to assist Yeager with sealing the hatch, thus, allowing him to break the "speed of sound" record. 1948 was a very good year. After Chuck Yeager achieved the previously incomprehensible dream, Rolex and Hans Wilsdorf were moving full-speed-ahead into a wonderful new era. 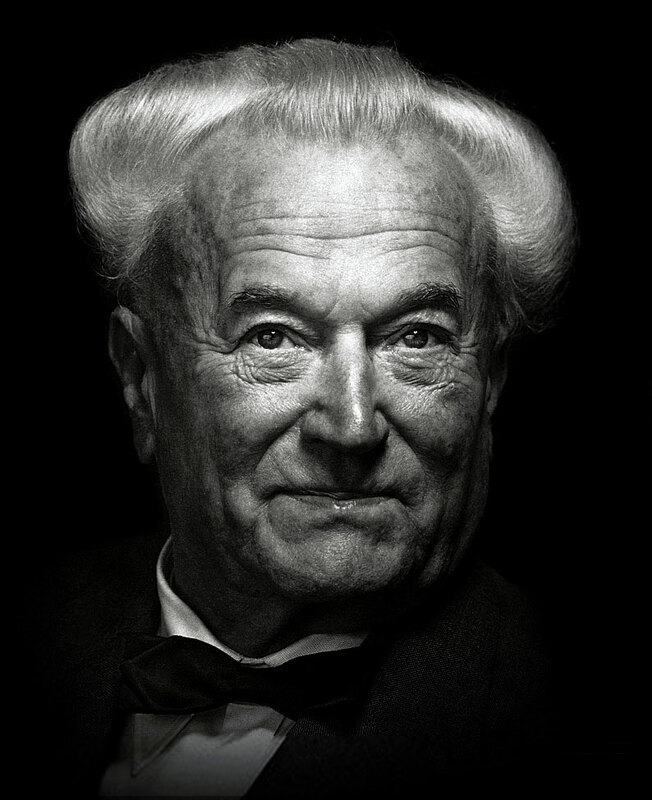 In 1948 Hans Wilsdorf was 67 years old, and despite his amazing achievements to date, the best was yet to come. 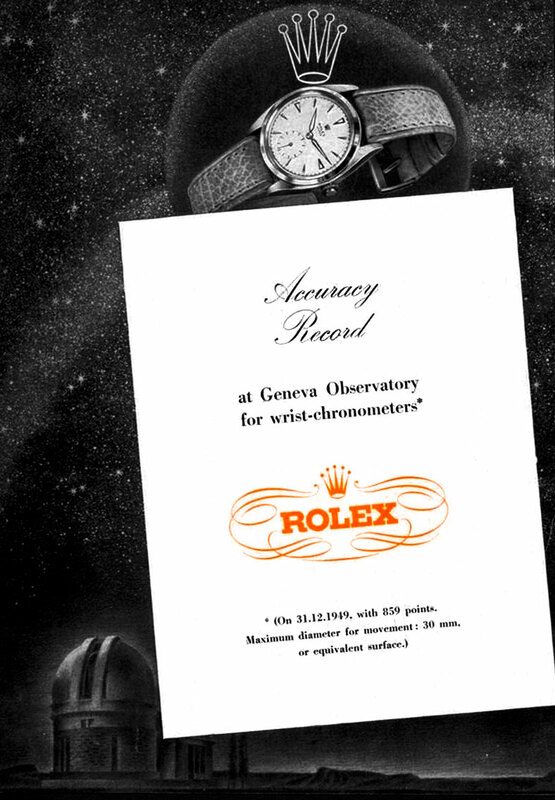 This next magazine ad points out that the Geneva Observatory awarded Rolex an accuracy record on December 31, 1949, for their Maximum diameter movement of 30mm, or less. 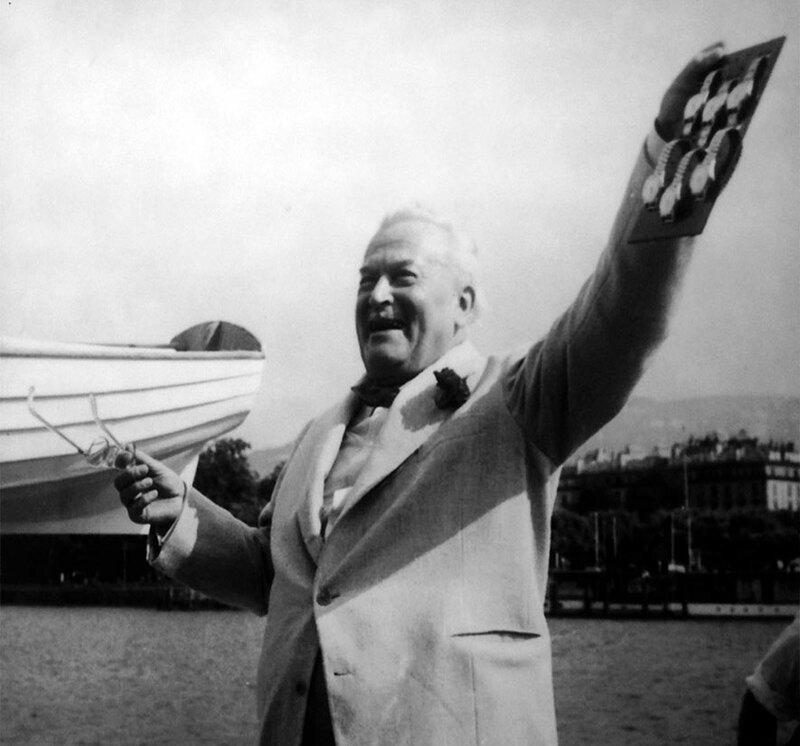 The photo below shows Hans Wilsdorf celebrating his 70th birthday in 1951, on Lake Geneva, while celebrating the 25th Anniversary of the Rolex Oyster, which was the worlds first waterproof wristwatch. The image above and below appear cortesey of Joël Laplace. Joël Laplace is from Switzerland and he is a vintage watch lover who maintains a fascinating Instagram page. "For some years now I have been considering the idea of making a watch that our agents could sell at a more modest price than our Rolex watches, and yet one that could attain the standards of dependability for which Rolex is famous, I decided to form a separate company, with the object of making and marketing this new watch. It is called the Tudor Watch Company." This announcement was made on 6 March 1946 by Hans Wilsdorf who, having created Rolex in the first decade of the 20th century was already a leading figure in the upmarket Swiss watchmaking world. It marked the birth of the TUDOR brand and its production an communications strategy. Hans Wilsdorf's intuition was as simple as it was ingenious. At that time, the development of wristwatches was in full swing and today's widespread drive to optimize resources, which is currently behind so many major financial and brand mergers, was still in the far-distant future. 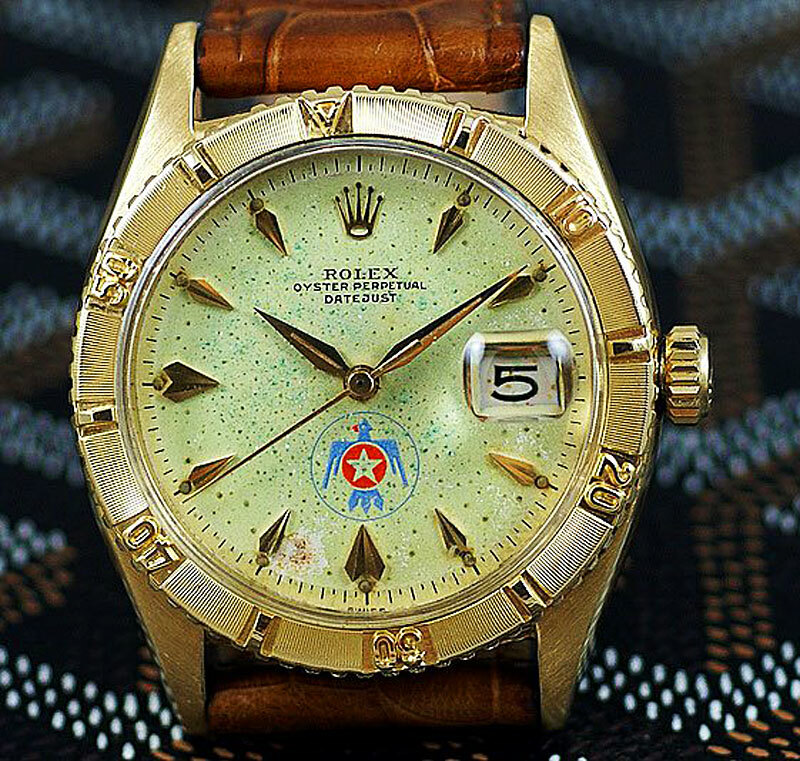 The public was ready to recognize and appreciate a moderately priced product whose technical, aesthetic and functional qualities, as well as its distribution, were guaranteed not by a newcomer on the market but by the Rolex brand, which had already earned worldwide renown for its high-quality production. This announcement was not merely words said for effect. It was Wilsdorf's genuine commitment to a program me. 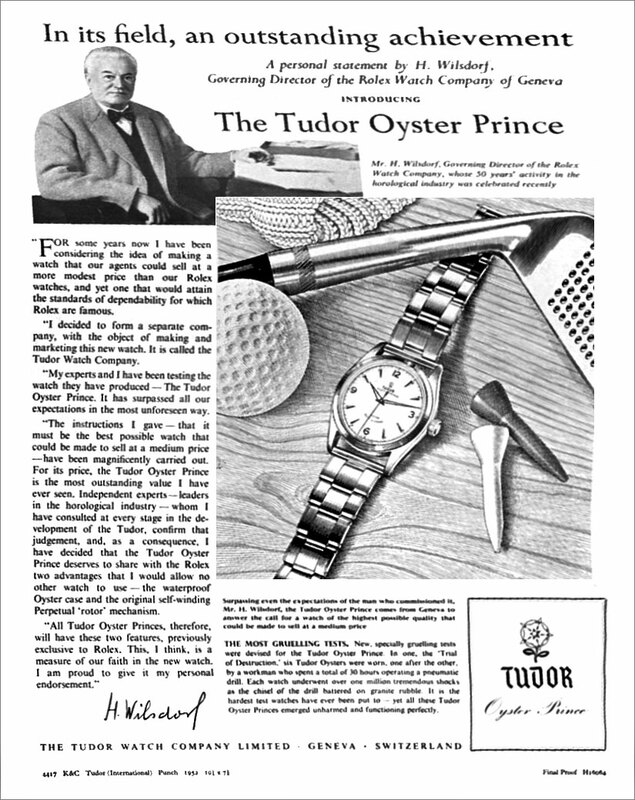 Between 1947 and 1952, therefore, TUDOR devoted itself to launching first the TUDOR Oyster model, followed by the TUDOR Oyster Prince collection, reflecting the successful marriage of precision and reliability, style and technique and high-quality production. 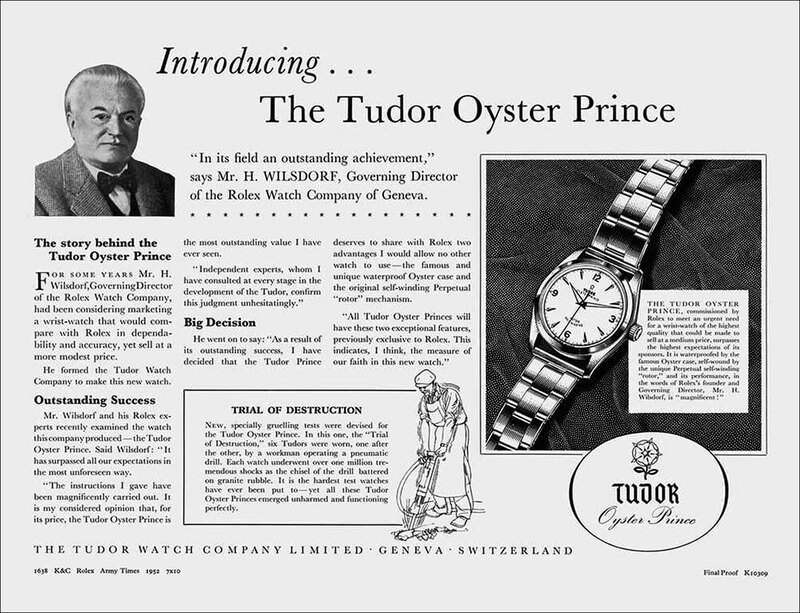 That period also saw the emergence of the first advertisements devoted exclusively to TUDOR, in which Wilsdorf expressed pride and satisfaction regarding his personal involvement in creating this new brand. This certainly was a privileged and auspicious start for the brand, originally represented be a decorative rose, the famous symbol of a once long-reigning dynasty in England, the Tudors, who inspired Hans Wilsdorf to give their name to his new company. The famous name, however, never led the company to rest on its laurels. From the very beginning, this is a story of technical developments, like the waterproof Oyster case and the adoption of a self-winding movement, which were not relegated to mere functionality, but turned into stylish features of watches designed in both performance and appearance for modern, dynamic men. With Rolex to usher it into the world and accompany its first steps, the TUDOR brand very quickly carved out a niche for itself, quite independently of the brand with the five-prong crown. If we look closely, early traces of TUDOR and its creations can be found as far back as 1926, the year the brand was registered by the Swiss watchmaking com pay, "Veuve de Philippe Huther", on behalf of Hans Wilsdorf. In 1936, Wilsdorf took it over himself and went on to found the company Montres Tudor SA in 1946. It was, however, the products and advertising campaigns of the 1950s that really gave the brand its definitive strength and distinctive personality." 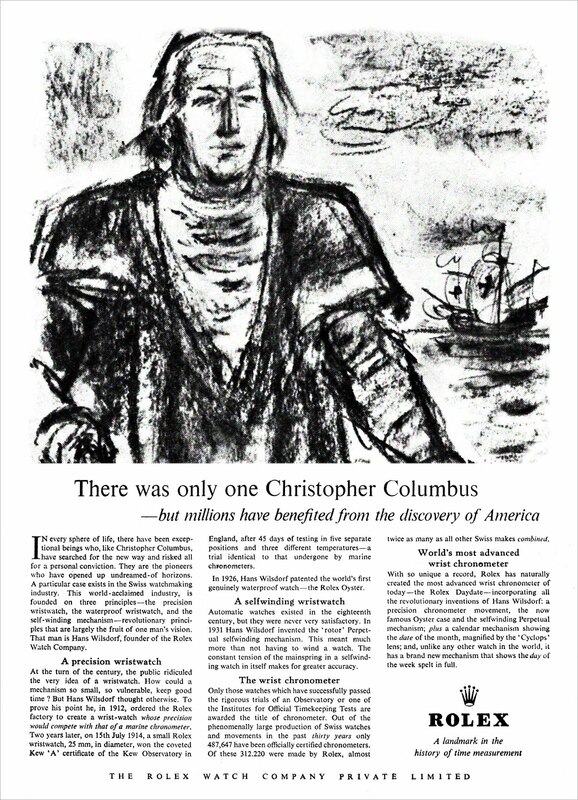 Hans Wilsdorf and TUDOR launched the following magazine ads in 1952 and you can read them to best understand Hans Wilsdorf's approach. It has been argued that Hans Wilsdorf created the Rolex line-extension with the Tudor brand so Rolex could take advantage of existing tooling that would have been obsoleted with the advent of new Rolex models. In other words, when Rolex would significantly update a model, the tooling used to make it was still useful, so Hans Wilsdorf wanted to take advantage of this financial opportunity. I have also heard, over the years, that Rolex would bring in Jr. watch makers who would begin their watchmaking career working on TUDOR watches, and eventually graduate to working on Rolex watches. One of the questions that come up often, is what Rolex of Geneva's relationship is with Rolex U.S.A.? Some people speculate that Rolex U.S.A. may be a separately controlled franchise of some sort? This is far from the truth. For the record, Rolex U.S.A. is and has always been a wholly owned subsidiary of Rolex of Geneva. Only Rolex knows for certain if the U.S. Market is the single largest market for their watches, and it appears, at least to us, that the U.S. Market is still the largest market by far. In 1952 Dwight D.Eisenhower was elected President of the United States of America and this changed everything for Rolex. Rolex now had the ultimate leadership showcase for their revolutionary Rolex Datejust watch. The significance of this moment cannot be emphasized enough. Having the leader of the "Free-World" who also was an amazing military leader wearing his highly visible Rolex Datejust changed everything for the leadership position that Rolex now occupied. 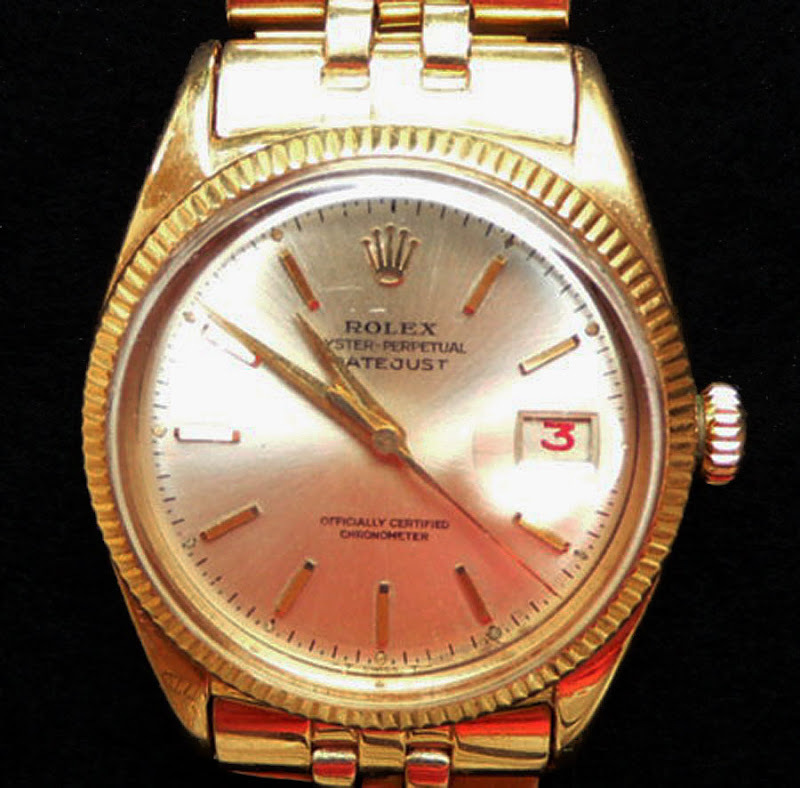 There have been many falsely propagated myths in Rolex folklore that suggest the Rolex Day-Date was referred to as "The Rolex President" or "The Rolex Presidential Model" because President Eisenhower supposedly wore one. THIS IS NOT TRUE!!!! Jake's Rolex World worked closely with the Eisenhower Rolex Presidential Library in 2008 and carefully combed through their archives and proved that Eisenhower only ever owned and wore a Datejust model. The supreme irony is that in reality, the yellow gold Rolex Datejust is really the true "Rolex President." I mentioned, Eisenhower's Rolex Datejust was a "State-of-the-Art" watch when it was first introduced in 1945. What made it "State-of-the-Art"? In order to answer this question accurately, it is important to understand the meaning of the term "complication" in the context of horology–horology being, by definition, the study, and measurement of timing instruments. A watch in its purest form only has one complication, which is the hour hand. In other words, the one-handed pocketwatch we saw at the beginning of this article, that is part of the Hans Wilsdorf collection, gives you perfect hour and minute information with just one hand, thus making it a "watch" in its purest form. Adding a second hand to a watch is adding a "second complication." So all modern analog wristwatches, with an hour and "unnecessary" minute hand, have two complications which are typically referred to as "base complications." When you add even a "second hand" it is considered to be an additional "complication." Any additional time or date keeping element added to a watch beyond the base is referred to as an additional "complication." For instance, a highly complicated wristwatch like the Rolex Moonphase [Reference 6062] which is pictured below, is referred to as a "Grand Complication" because it has, in addition to the hour and minute hands, a "Moonphase Indicator" as well as a "Day" and "Month" window, as well as a "Minute" hand. It may appear as if we are getting off-the-subject, but this is actually on point. The "Grand Complication" Rolex Moonphase pictured below [Reference 6062] was made in the early 1950s and was housed in a waterproof "Oyster" case. Hans Wilsdorf died in 1960, and by 1963, Andre Heiniger took over as the CEO of Rolex and completely stopped making complicated Rolex watches–much to the dismay of many collectors. It is likely they discontinued manufacturing and marketing the complicated watches because they did not sell well at the time. So why did we sidetrack onto the subject of the complicated watches being discontinued directly after Wilsdorf's death? We believe, if he lived longer, or was still alive, he would have continued making complicated Rolex watches, and we think Rolex is crazy not to bring them back to life. So to come around full circle, we originally go on to this tangent because we were discussing what originally made the Rolex Datejust so "state-of-the-art" in 1945? The best way to answer this question is to analyze the original 1945 model as seen below. Ironically, the first Rolex Datejust lacked and "Datejust" designation on its dial? We believe it is likely, the watch was named the "Datejust" after it went into production in 1945, which would explain why it lacks the designation. Also, notice the original 1945 Datejust does not have a "Cyclops" date lens. Also notice, its fluted bezel is extremely primitive compared to the fluted bezel we are familiar with today. If you look closely, you notice the original 1945 Datejust fluted bezel looks remarkably similar to the fluted bezel on the hermetically sealed pre-Oyster model shown earlier in this story–and that is because it is identical. In other words, the fluting on the Rolex Datejust and Day-Date, and even on the Submariner and GMT, all owe their genesis to the unscrewable top of the hermetically seal pre-Oyster Rolex!!! One of the reasons I showed you the original Rolex Datejust pictured above, is because the 150.000th Officially Certified Swiss Chronometer that Rolex gave Eisenhower originally looked much more like it than the way it is pictured below. Why? Eisenhower sent in his Rolex for servicing in 1953 and Rolex completely upgraded his Datejust by adding a new bracelet, new dial with baton markers, new hands, and added their new cyclops crystal, thus making the watch look much more modern as seen below. 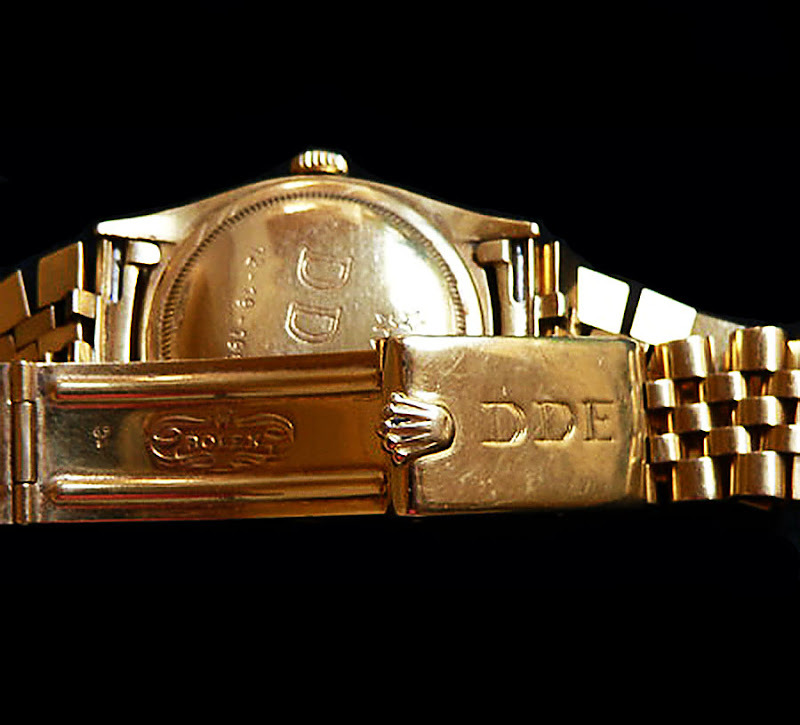 The photo above and below are of Eisenhower's actual Rolex today. In the photo below, we see the D.D.E. initial engraved into the verso and on the bracelet clasp. 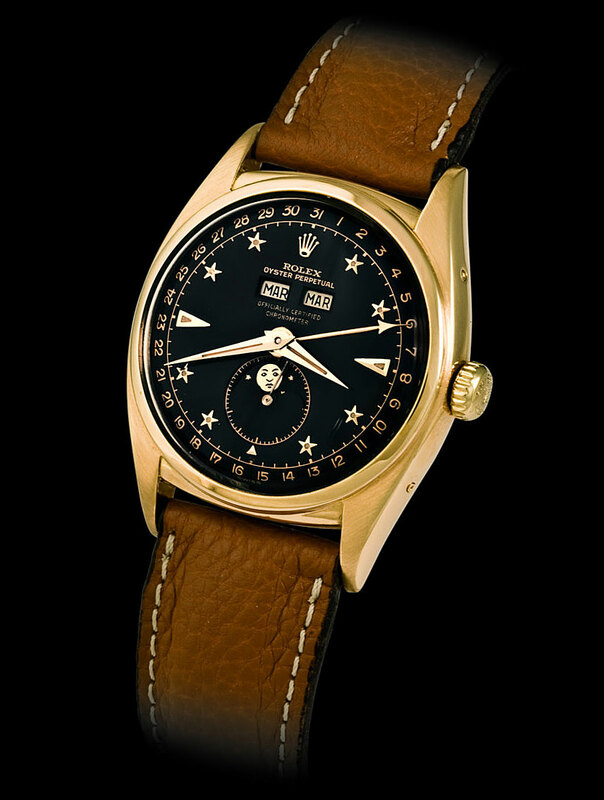 Rolex also engraved his five stars on the verso, and they form a pentagon in their center. 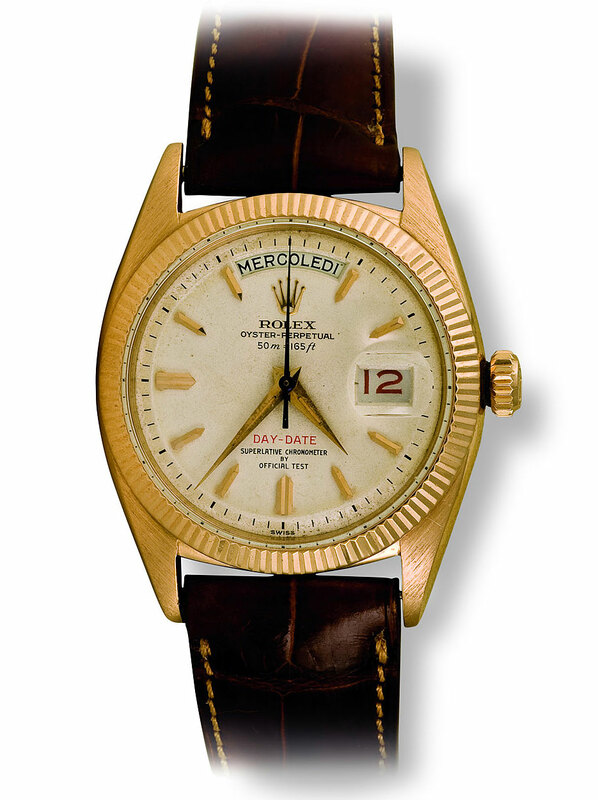 Rolex also engraved the date Eisenhower became the Supreme Commander of NATO in Europe in 1950. 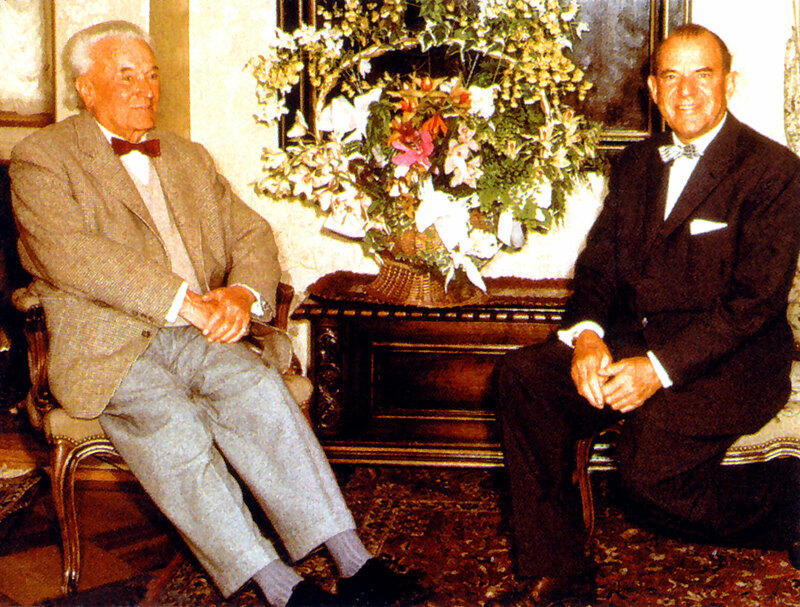 Hans Wilsdorf is pictured below (left) with Ernst Bucherer, who is the son of Carl F. Bucherer who was the founder of the Bucherer Group. The Bucherer Group is the largest seller of Rolex watches to this day. Both Rolex and The Bucherer Group today are Switzerland's biggest luxury watch manufacturers. This fact is based largely on a deal that Hans Wilsdorf made almost 90 years ago with the founder of the Burcherer group, named Carl F. Bucherer. Carl F. Bucherer and Hans Wilsdorf were both spirited entrepreneurs who refused to join powerful Swiss cartels which dominated the Swiss watch industry during the early 20th century. Hans Wilsdorf and Carl F. Bucherer not only rebelled against the Swiss Watch Cartels but in 1924 they started one of the most successful partnerships in the history of watches. By refusing to join the Federation Of Swiss Watch Manufacturers, Rolex and Bucherer changed watch history. 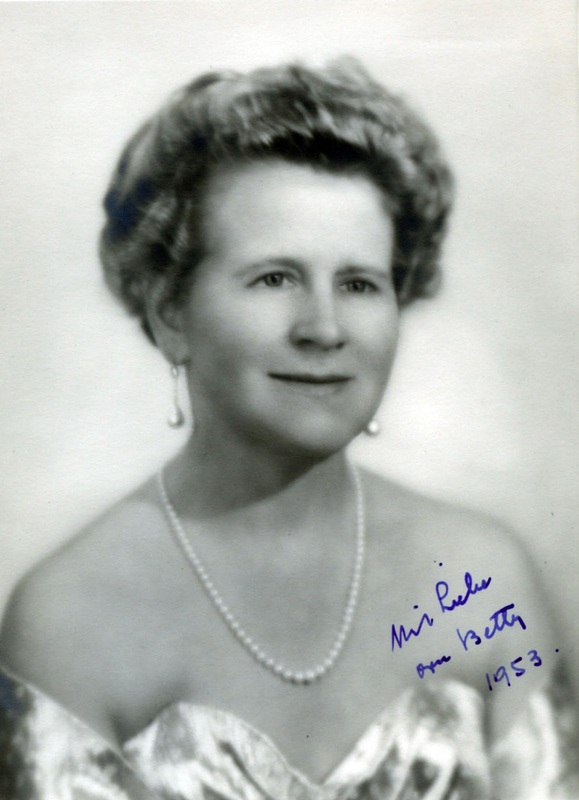 The photo below is of Hans Wilsdorf's second wife whose name was Betty Wilsdorf-Mettler. It is signed "With Love. Your Betty." 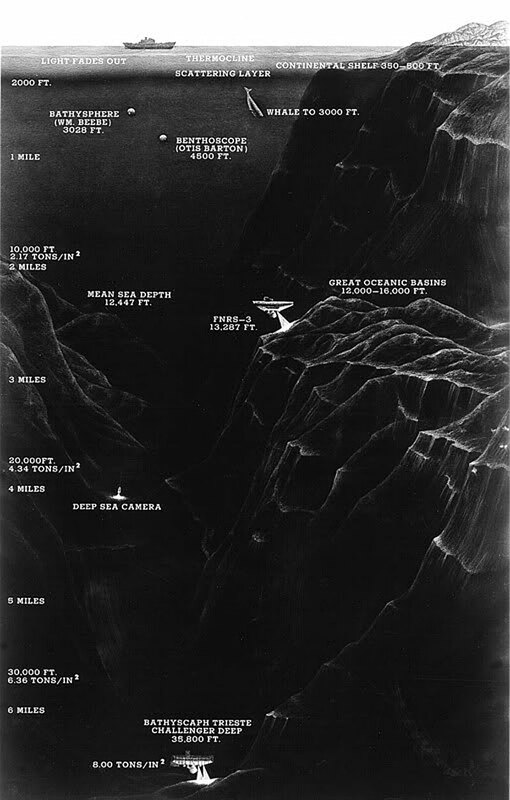 In 1953 and British mountaineering expedition set out to be the first to climb to the peak of Mount Everest. When Sir Edmund Hillary and his Sherpa, Tenzing Norgay summited the top of Mount Everest, they were both wearing their trusted Rolex Oyster Perpetual wristwatches. In 1953 Rolex introduced a new watch for sportsmen, named the Rolex Turn-O-Graph. 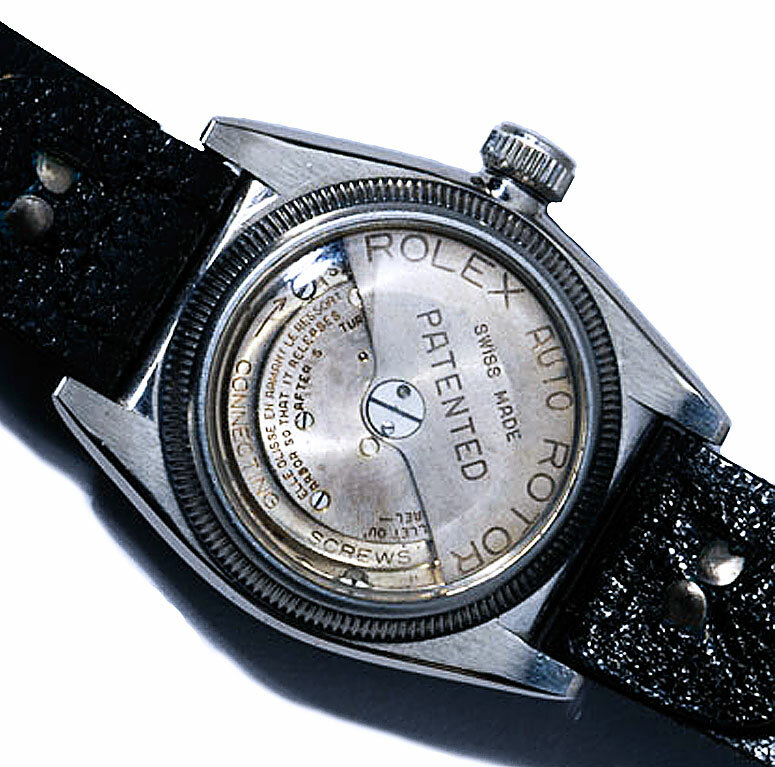 The Rolex Turn-O-Graph was the first wristwatch to feature a rotatable bezel that could be used for timing events. In 1953 The Bathyscaphe Trieste set a depth record of descending down to 10,350 feet, with a Rolex DEEP-SEA Special attached to the outside of it, as you can see from the vintage Rolex advertisement below. In 1953 Jacques Cousteau made an Academy Award-winning color documentary which was the first to really show the world what sea-life was like, and Jacques-Yves Cousteau was wearing an early prototype Rolex Submariner, as he filmed "The Silent World" in the Mediterranean Sea. 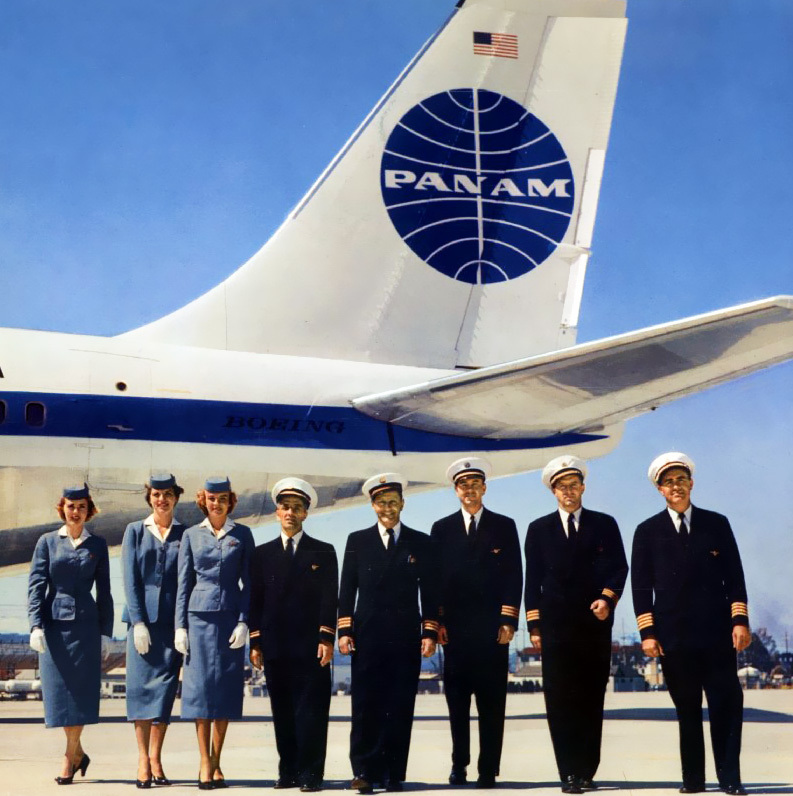 1958 Pan Am Crew is Pictured in front of their 707. Pan American Airlines was the first commercial airlines in the world to offer international service and was considered to be the premier international U.S. airline from the 1930s until it shut-down in 1991. Rolex also introduced the grandfather of the Daytona in 1955, known as the Rolex Chronograph [Reference 6234]. 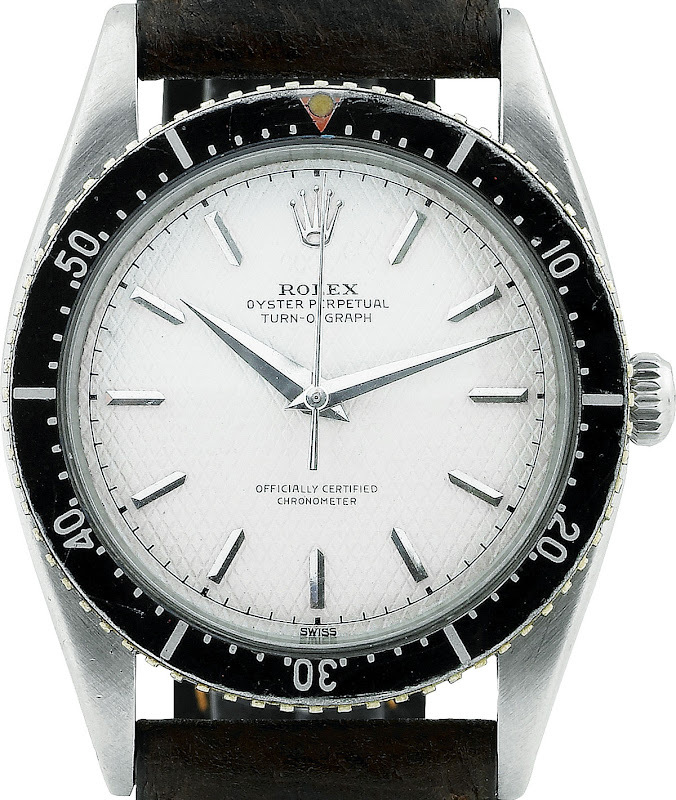 The Reference 6234 would be made from 1955 to 1961, and Rolex averaged approximately 500 units per year. The two photos of Hans Wilsdorf below are the only images we have ever seen that shows him actually wearing a Rolex. He is wearing a Rolex Datejust on a Jubilee bracelet. • Attractive on movement and dial. 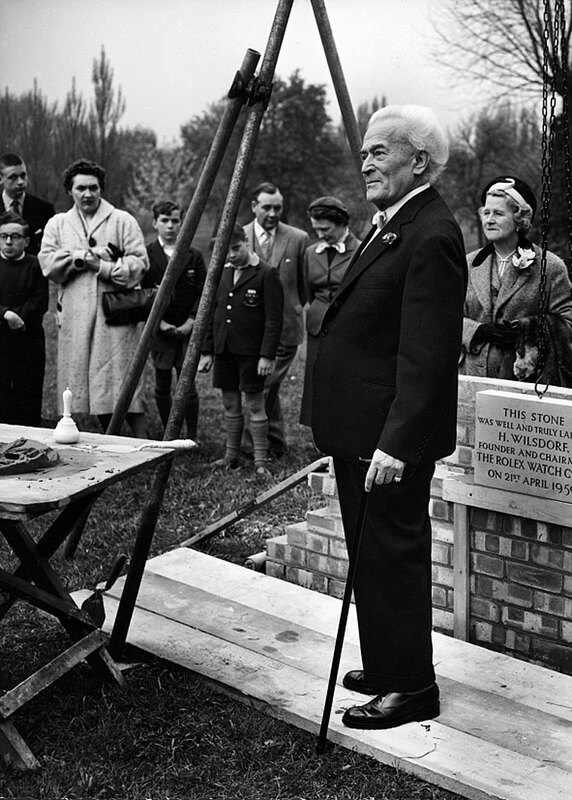 This next set of photos are the last known photos taken of Hans Wilsdorf. 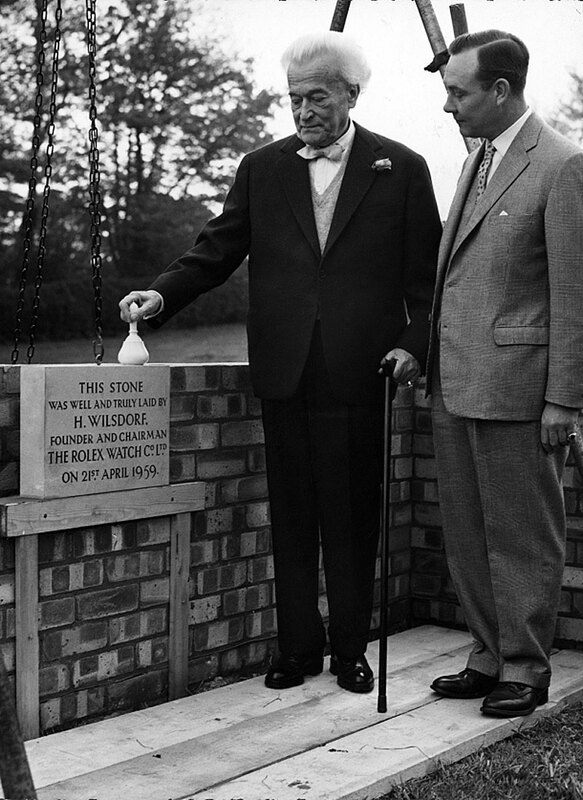 They were taken in 1959 at the site where Rolex was preparing to build the Bexley Rolex Service Center, which is located on Heathland Road, in Bexley, Kent in the U.K. Kent is located in South East England and it borders East Sussex, Surrey, and Greater London. In this next photo, he is standing next to his wife, Betty Wilsdorf-Mettler. Notice how excited they both seem to be having their photo taken together. 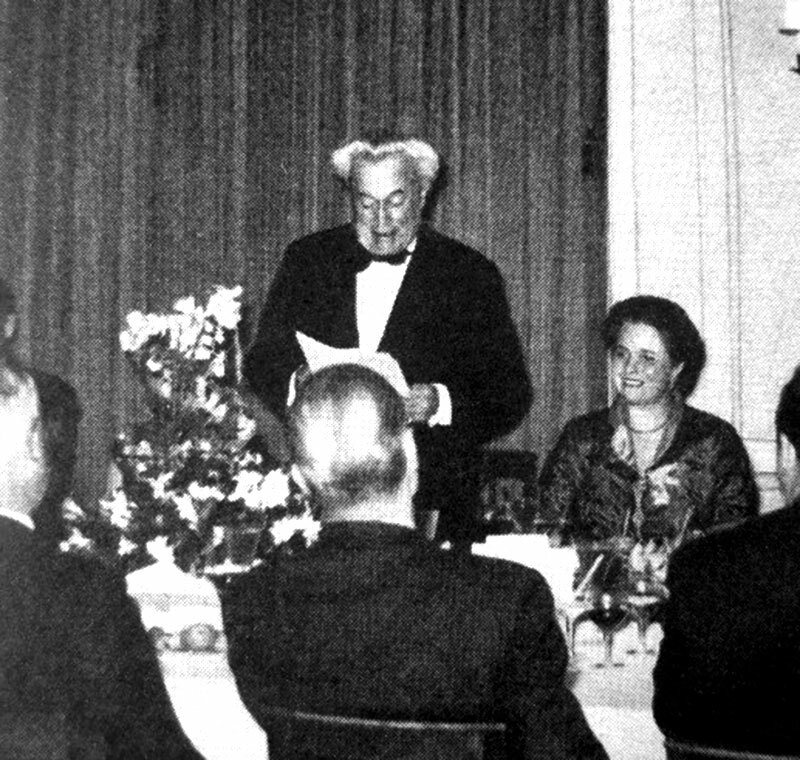 I imagine the people standing behind Hans Wilsdorf are his sister's children and grandchildren. Also, I imagine this is the sister who was married to Hans Wilsdorf's original partner who was the "Davis" in "Wilsdorf & Davis." The video below is the only video I know of that shows Hans Wildorf speaking. I discovered and published this Hans Wilsdorf video on November 25, 2017. The video is in French, but you get a tremendous sense his personal disposition and manner of speech. Enjoy!!! The video was shot on September 19, 1959, and Hans Wilsdorf passed away less than a year later on July 6, 1960. The context of this features Hans Wilsdorf speaking French, at the Rath Museum in Geneva, Switzerland, where he was attending a Watch & Jewelry exhibition. This occurred just after Rolex was crowned the winner of The Geneva Grad Prix. To add further context, Hans Wilsdorf had introduced the Submariner for sale in 1954, as well as the GMT-Master in 1955. 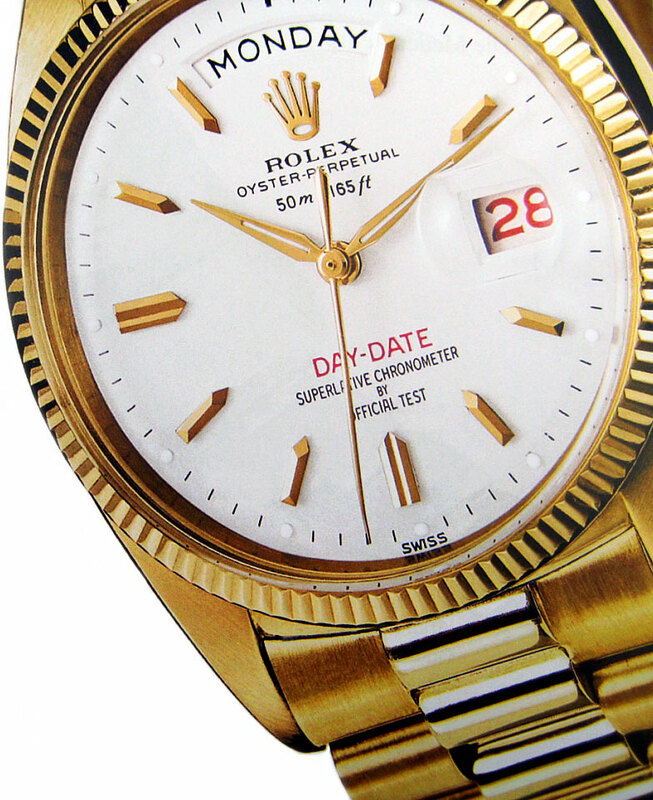 In 1955 Rolex also introduced the Day-Date. 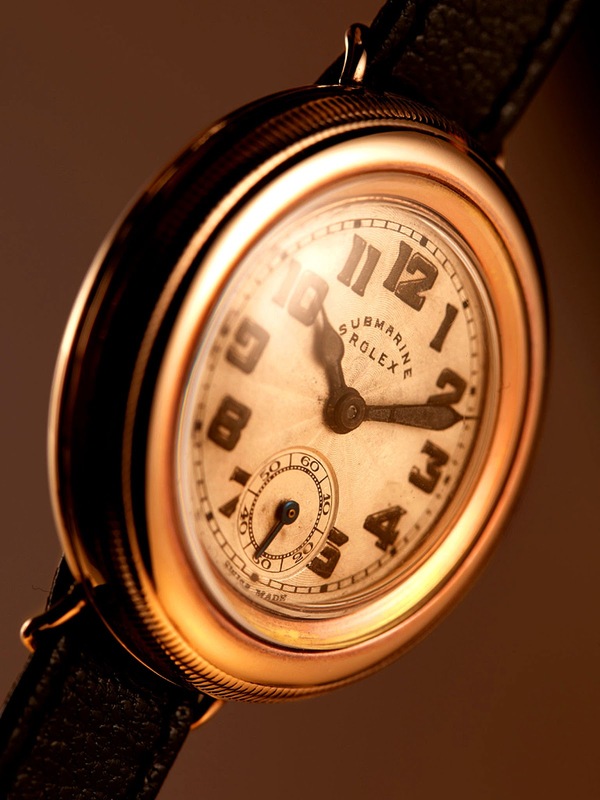 So at this time, Rolex and Hans Wilsdorf had already laid the foundation for the Rolex of today! We are here at the Rath Museum in Geneva, at the Watches & Jewelry exhibition to be precise and our objective today is to present the laureate of the Geneva award. We have Mr. Hans Wilsdorf at our microphone and in front of our camera. He is the director of a big watch company who received the award. Sir, you have been here in Geneva for a very long period of time if I’m not mistaken. (Interrupts Mr. Wilsdorf) I see. Your watch is a wristwatch and I believe we can say that you helped diffuse the wristwatch. (Interrupts Mr. Wilsdorf) And you are especially proud that a wristwatch won the award, I think that you consider this a little bit like the peak of your career. It is profound, when you think about it, that Rolex really stopped innovating after the death of Hans Wilsdorf. In other words, all the great technical innovations like the waterproof Oyster Case and the Perpetual movement, all occurred during Hans Wilsdorf's lifetime. After Hans Wilsdorf died, Rolex stopped pushing the innovation envelope and maintained the direction he established, and primarily introduced new models, including the Daytona and Yacht-Master. One of the greatest questions, at least in my mind, is, what would Hans Wilsdorf have thought about the advent of the Quartz watch movement if he had lived just another few years? After Hans Wilsdorf's passing, Rolex was one of the companies that pioneered the Swiss quartz movement, along with a consortium of other Swiss companies in 1962 at the CEH Research laboratory in Switzerland. This was apparently in direct response to the Japanese company Seiko which began developing the quartz movement in Japan in 1960–which was the year Hans Wilsdorf passed away. Seiko had its subsidiary named Epson develop the electronic quartz movement is secrecy in Japan under the codename of 59A. Seiko shocked the world when it introduced the quartz prototype movement at the 1964 Olympics which was actually used to successfully time Olympic events. In a shrewd move, Seiko did not seek to patent the quartz watch which allowed other manufacturers to quickly develop quartz models and lead the quartz revolution which has had an amazing impact on the watch industry to this day. So why do I bring up this seemingly bizarre question toward the end of the Hans Wilsdorf story? 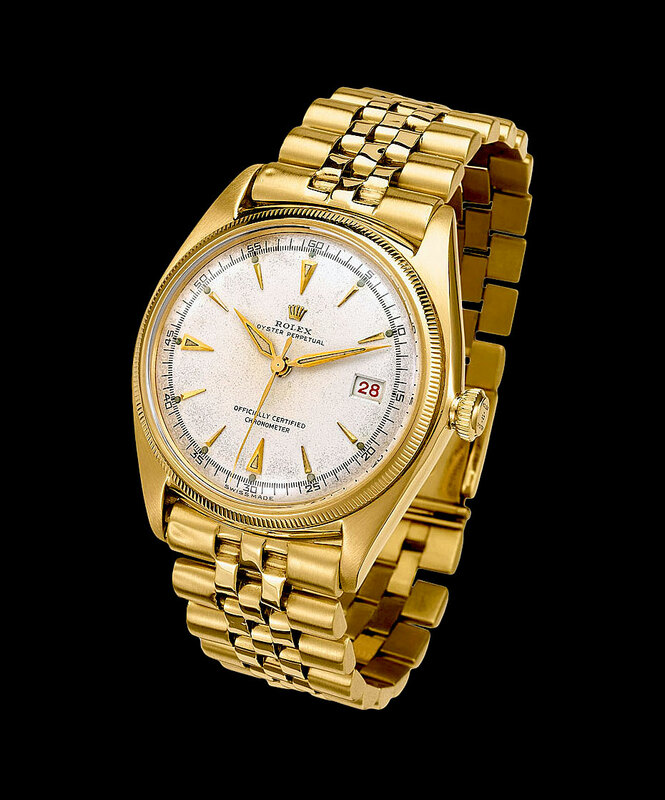 Rolex ended up bringing to market, under the leadership of Andre Heiniger, in the 1970s the Rolex Oyster Quartz models which were initially successful. Just a few years ago, Rolex stopped making quartz watches altogether since they have evolved the mechanical watch so it is nearly as precise as a quartz, but I can't help but wonder what Hans Wilsdorf would have thought about the advent of the quartz movement since he was constantly seeking to make movements that were as precise as possible, and to this day, the quartz movement is still the king of precision timekeeping. In other words, if Hans Wilsdorf would have lived another 10-20 years, would he have been more passionate about the quartz technology? or would he have shunned it? This is a question that will likely never be answered, but I think it is worth consideration. It can be argued, that every Rolex made today, has a piece of Hans Wilsdorf's soul in its DNA, and perhaps, that timeless perpetual spirit will live on eternally. If you are wearing a Rolex on your wrist as you read this, you are not only carrying around a part of this amazing history but as you perpetuate it, you inevitably become a part of it, which is how Hans Wilsdorf wished it to be. As a matter of fact, Hans Wilsdorf's and his first wife, May Wilsdorf-Crotty never had any children, and after she passed away in 1944, Hans Wilsdorf set up the Hans Wilsdorf Trust which owns and controls Rolex to this day. Hans Wilsdorf brilliantly set up the bylaws of his trust so Rolex could never be sold or made public, so it would never have to worry about catering to anything but making timeless watches. This fact is so profound if you think about it as it means Hans Wilsdorf's vision is still very much alive and being executed on a daily basis despite the fact he passed away more than a half-century ago. How many men can you think of that are so passionate about something, that they build a world-class business around their passion, and 58 years after they pass away, the company keeps going as if they were still running it!!! Hans Wilsdorf really is "The Ghost In The Machine!!!!" 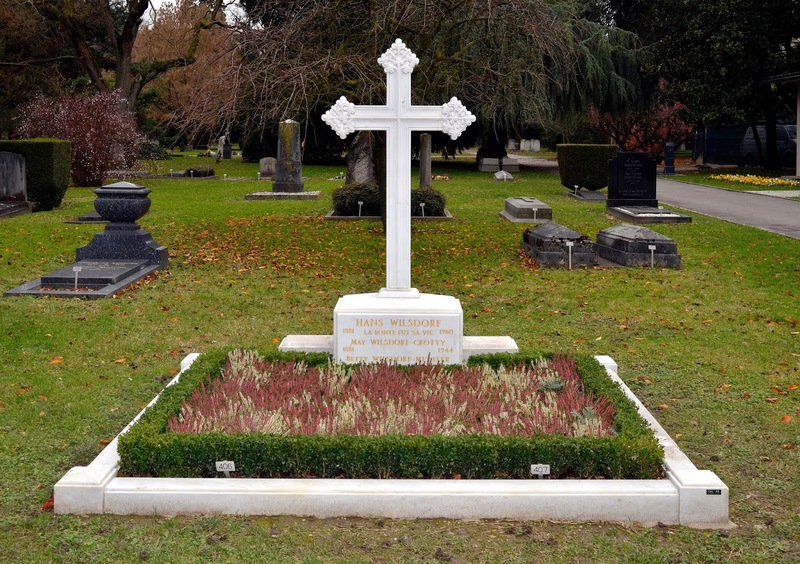 Hans Wilsdorf is buried next to his first and second wives respectively, May Wilsdorf-Crotty, and Betty Wilsdorf-Mettler, as seen in the photo below. Their tomb is located at Cimetière de Plainpalais which when translated from French to English means Kings Cemetery or Cemetery of Kings, which located in Geneva, Switzerland. Under his name on his tombstone is says, "La bonte fut sa vie", which when translated from French means, "Goodness was his life." 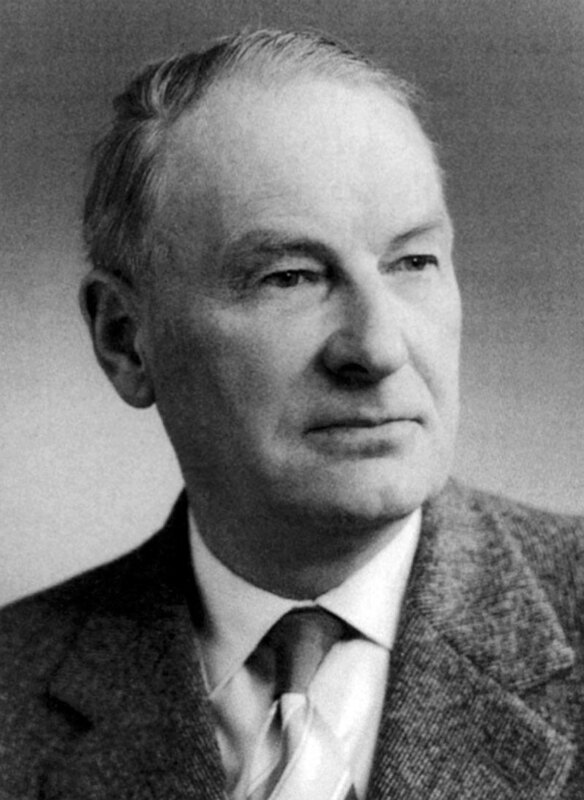 • 1881 - Birth of Hans Wilhelm Wilsdorf was born on March 22, in Kulmach, Bavaria (which is now part of Germany) to Ferdinand and Anna Wilsdorf. • 1905 - Hans Wilsdorf founds his first watch company with his older brother in law and names it Wilsdorf & Davis Ltd.
• 1908 - Hans Wilsdorf registers Rolex trademark name. He seeks to create a new name that is simple to remember and pronounce as well as a name that cannot be misspelled. Instead of using an existing name he makes up a name from scratch, much like Eastman did when he created the Kodak brand in 1888. Hans Wilsdorf said, "With Rolex, I sought to create a name that would be easy to pronounce in all European languages and could easily and elegantly grace the dial of a watch." • 1910 - Hans Wilsdorf sends his first movement to the School of Horology in Switzerland and was awarded the world's first wristwatch Chronometer rating. • 1912 - Hans Wilsdorf opens Wilsdorf & Davis offices in Bienne, Switzerland to facilitate movement business with Mr. Aegler. Hans Wilsdorf orders Rolex factory to create a wrist-watch whose precision would compete with that of a marine chronometer. • 1914 - On the 15th of July, 1914, the Kew Observatory in England awarded to 25mm Rolex wristwatch the first Class "A" Precision Certificate known as a Kew-A, after 45 days of testing in five separate positions and three different temperatures–a trial identical to that undergone by marine chronometers. • 1919 - Rolex sets up Geneva offices. 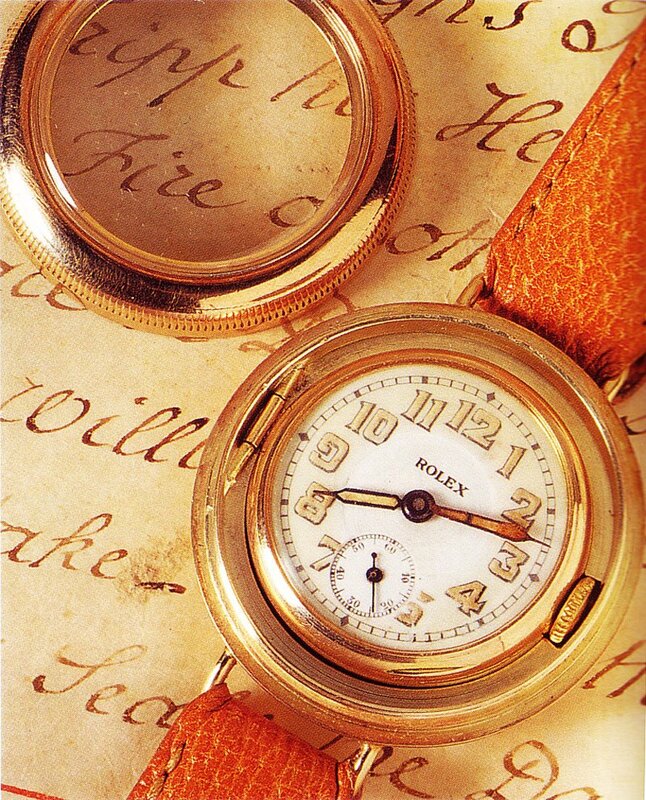 • 1920 - Montres Rolex S.A. established in Bienne, Switzerland. • 1925 - Rolex Introduces and trademarks their now iconic Rolex logo which features the 5-point crown. • 1925 - Rolex obtains a Class "A" Certificate from the Kew Observatory for a small ladies' movement, which was the worlds first wrist-chronometer for ladies. 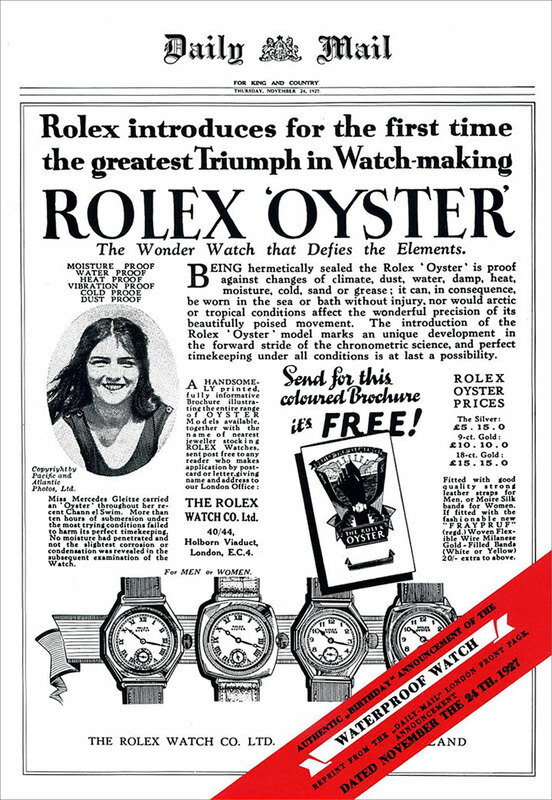 • 1926 - Rolex develops and patented the Rolex Oyster; as the first air, dust and waterproof watch. • 1927 - Mercedes Gleitze is the first woman to swim the English Channel. 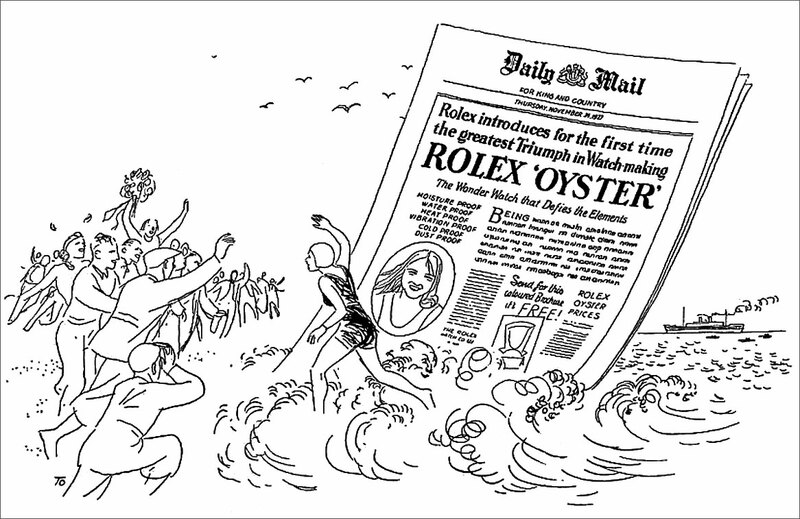 She re-attempts to swim the English Channel a second time while wearing Rolex "Water Proof" Oyster. Hans Wilsdorf makes her the first celebrity to endorse Rolex. • 1928 - Rolex introduced the extremely popular and stylish art-deco Rolex Prince curvex watch. • 1931 - Rolex introduced the revolutionary Perpetual Movement; a self-winding mechanism that can be found in every automatic watch. • 1933 - Malcolm Campbell becomes first male ROLEX Ambassador. 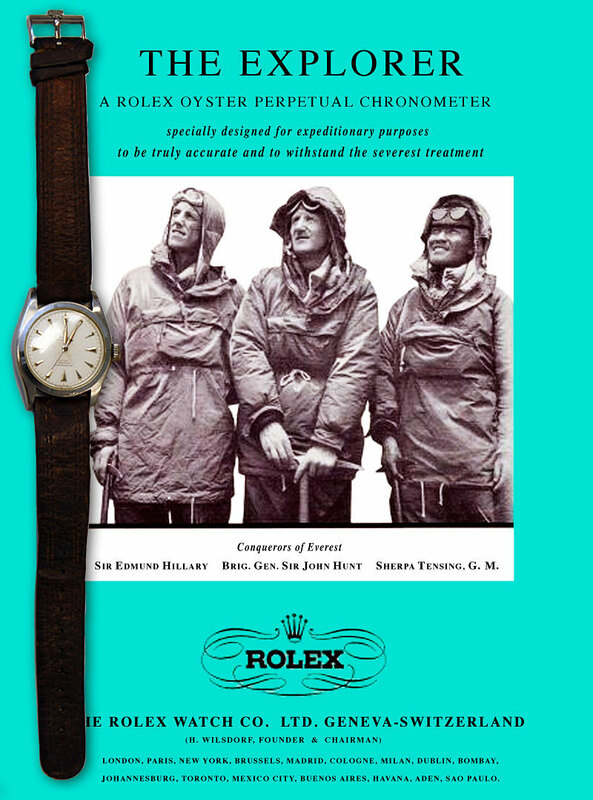 • 1933 - First Airborne Expedition to fly over Mount Everest is equipped with Rolex watches. 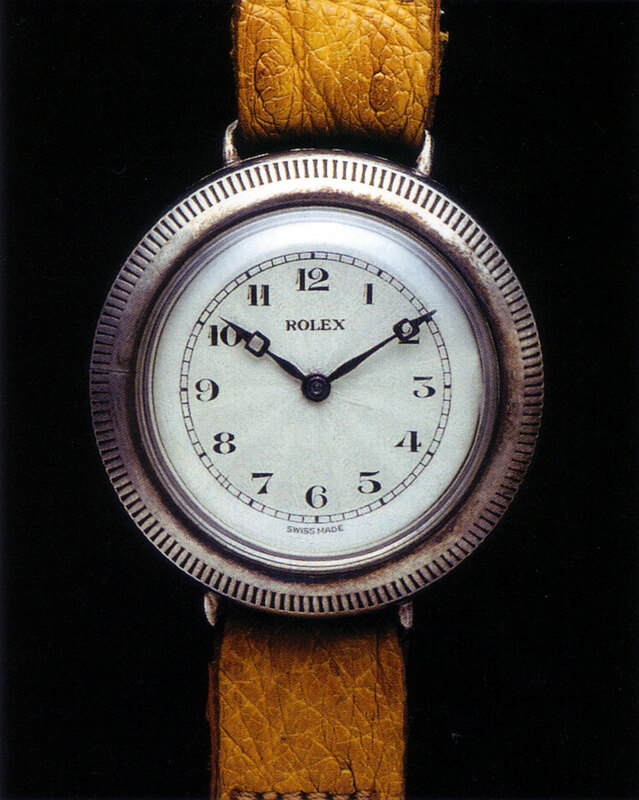 • 1937 - Rolex brings their first watch to market that features a rotating bezel. This model is known as a Rolex Zerograph chronograph [Reference 3346], which also features the first in-house Rolex made chronograph movement. • 1942 - Rolex builds its first and only split-seconds "Rattrapante" chronograph [Reference 4113], which is housed in an astounding large 44MM case. 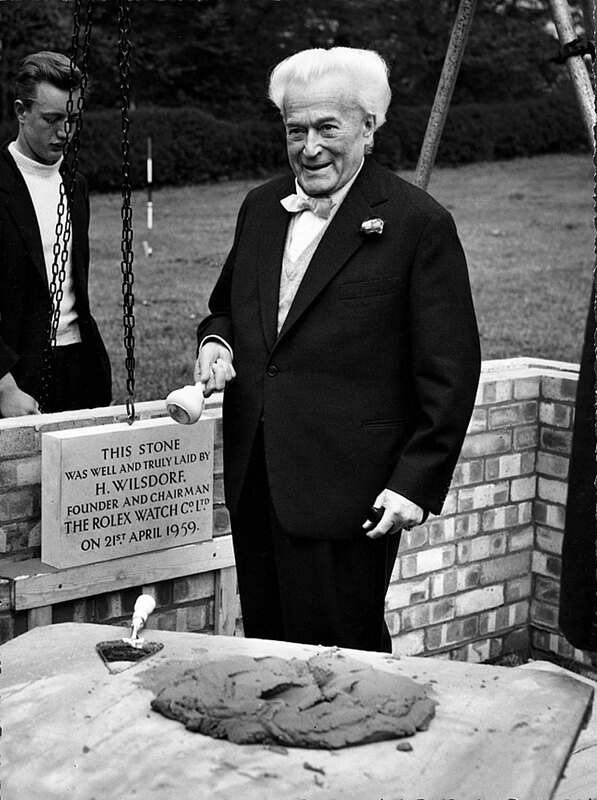 • 1944 - Hans Wilsdorf's wife passes away, and Hans Wilsdorf establishes the Hans Wilsdorf Foundation to which he left all of his shares in Rolex. • 1945 - Rolex Datejust (First waterproof, self-winding chronometer wristwatch with the date in a magnifying window that automatically changes; also the introduction of the Jubilee bracelet to celebrate Rolex's 40th Anniversary also known as the Ruby Jubilee). • 1946 - Hans Wilsdorf establishes the Rolex subsidiary known as The Tudor Watch Company to make a line of watches that would be as dependable as Rolex, at a more "modest price." • 1947 - Rolex receives Patent Number 257,185 for the Oyster Bracelet. • 1947 - Chuck Yeager is the first man to break the sound barrier while wearing his Rolex Oyster Perpetual he purchased himself. 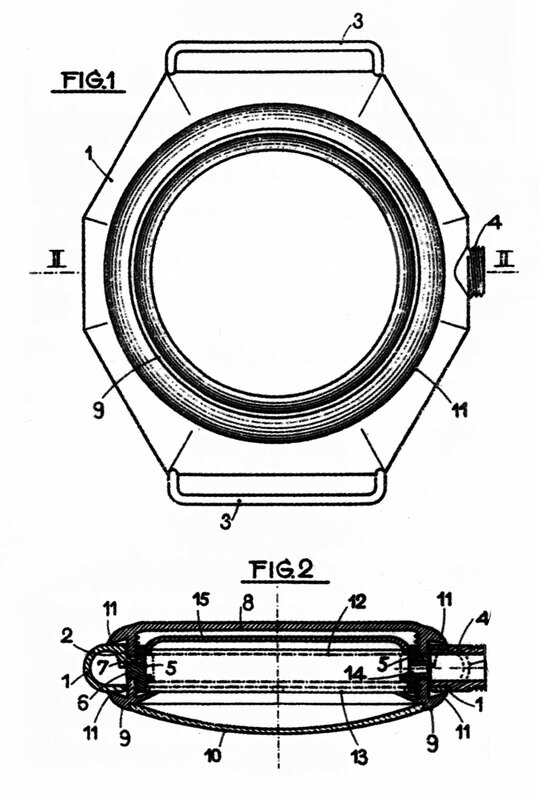 • 1948 - Cyclops Magnifier Lens feature for easy viewing of the date developed for DateJust. • 1949 - Geneva Observatory for Wrist-Chronometers awards Rolex an accuracy record of 859 points, for a maximum diameter of a 30mm movement. • 1952 - Hans Wilsdorf founds Tudor brand of less expensive watches that use the Rolex Oyster case and self-winding Perpetual "rotor" mechanism. • 1953 - The first Rolex DEEP-SEA Special is attached to the outside of the Bathyscaphe "Trieste: and submerged down to 10,350 feet. When the Bathyscaphe "Trieste" surfaces, the DEEP-SEA Special is inspected and found to be in "perfect condition...keeping perfect time." 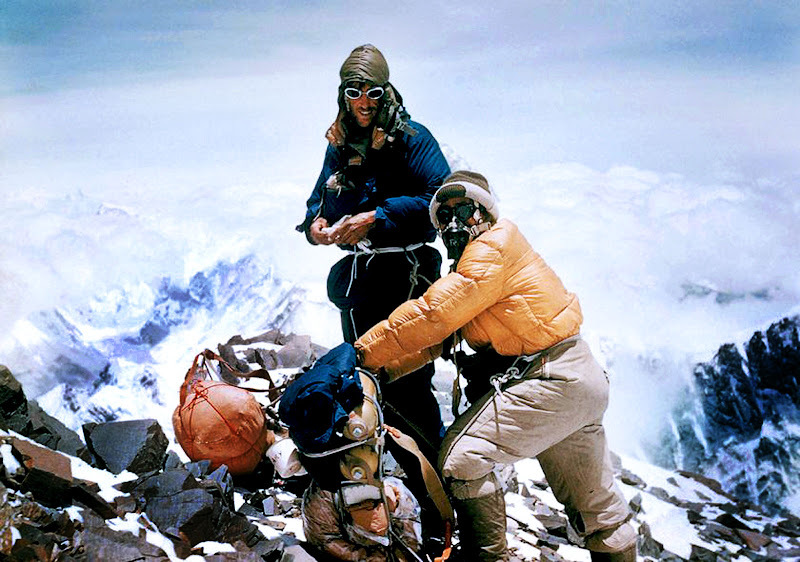 • 1953 - Sir Edmund Hillary and Tenzing Norgay conquer Mount Everest wearing Rolex Oyster Perpetual, May 29th at 11:30am. 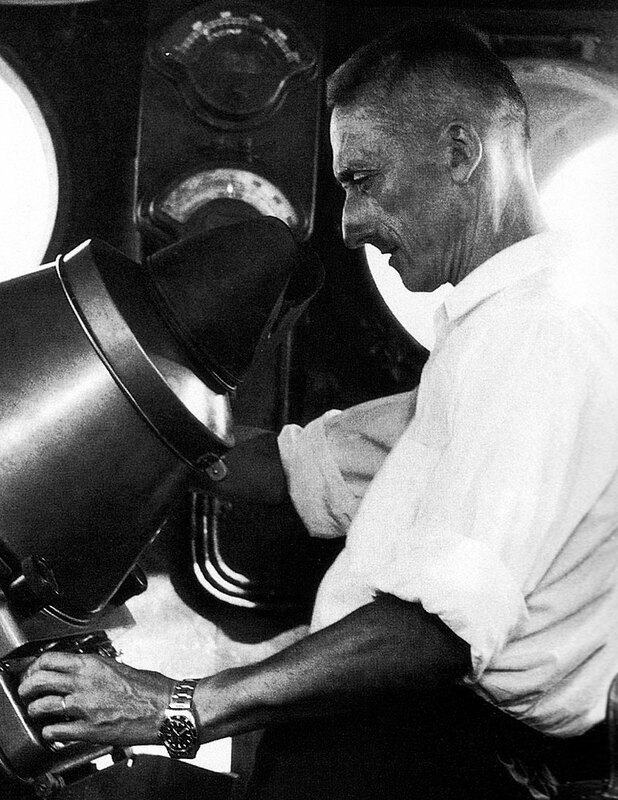 • 1953 - Jacques-Yves Cousteau films the documentary The Silent World in the Mediterranean wearing a Rolex Submariner prototype. 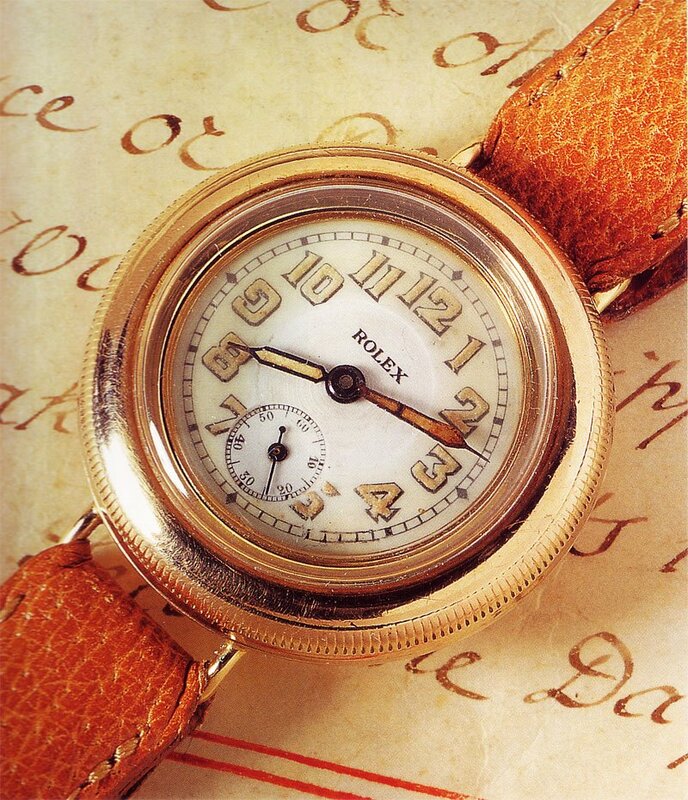 • 1953 - Rolex introduces Explorer wristwatch. 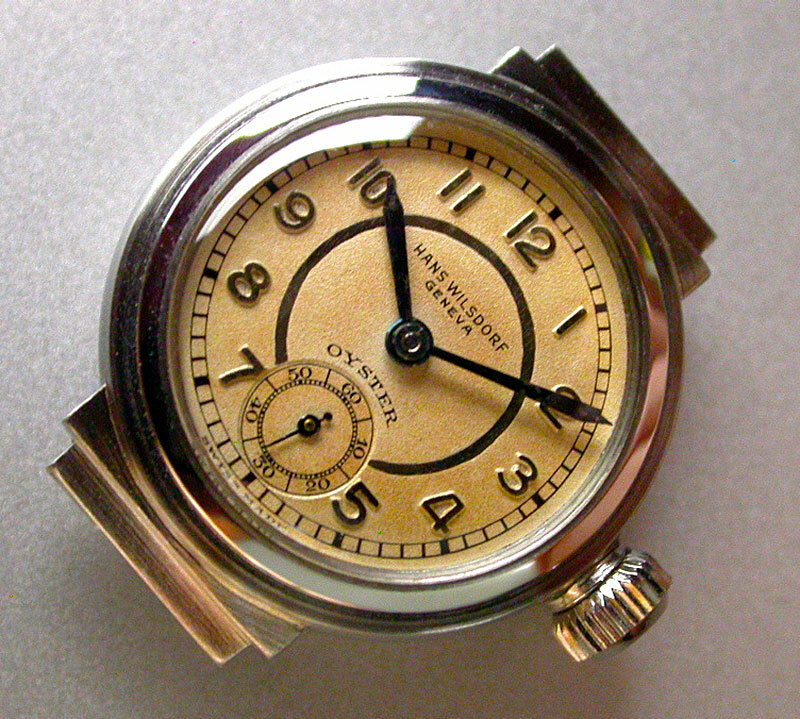 Also, the Turn-O-Graph was introduced as the first wristwatch with a rotating bezel. 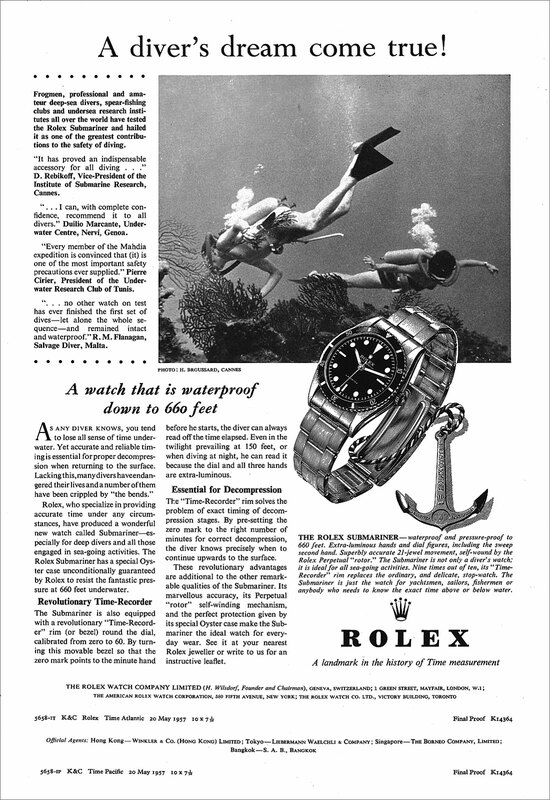 • 1954 - Rolex formally introduces Submariner diving watch at Basel Fair Watch Trade Show in Switzerland. • 1954 - Rolex Oyster Perpetual Lady-Date created, which was the first self-winding waterproof chronometer for ladies. • 1954 - Rolex introduced the Milgauss Anti-magnetic watch for Scientists. • 1955 - Royal Navy divers issued officially with Rolex Oyster Perpetual watches. • 1955 - Rolex perfects the "Twinlock" crown which screws down onto the case and has internal sealing to give watch double protection. • 1955 - Rolex introduces the GMT Master is developed for Pan American International Airlines to make it possible for pilots to easily track two time zones. 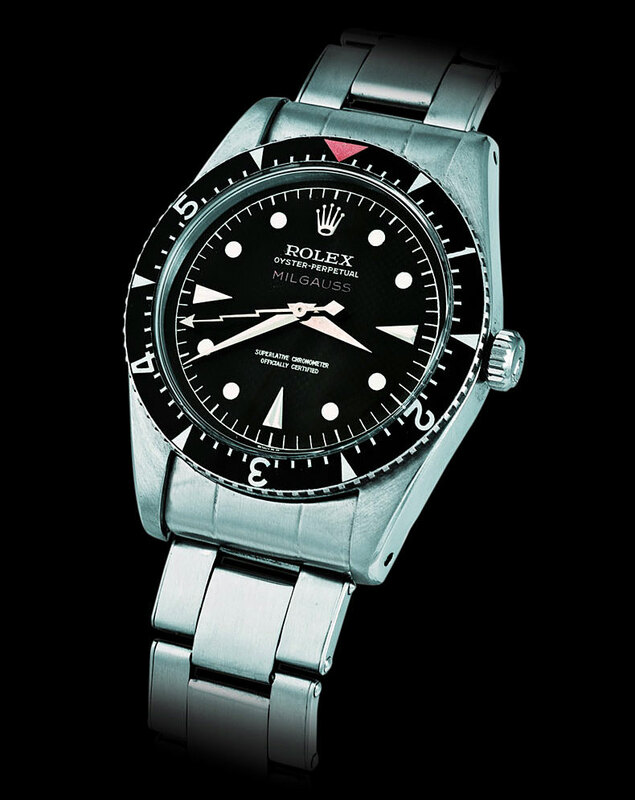 • 1956 - Rolex introduces first "anti-magnetic" watch in history known as the Rolex Milgauss [Reference 6543]. The Rolex Oyster Perpetual Milgauss was designed for use by scientists who were exposed to a magnetic field, which typically would have a negative effect on all mechanical watch movements. The Rolex Milgauss was made of ferromagnetic alloys which consisted of two components. The first component was screwed to the movement and the second component was attached to the Oyster case. The Rolex Milgauss was rigorously tested by engineers at CERN, in Switzerland, where it gained a reputation for having a perfect magnetic shield, that could effectively withstand magnetic fields up to 1,000 gausses. 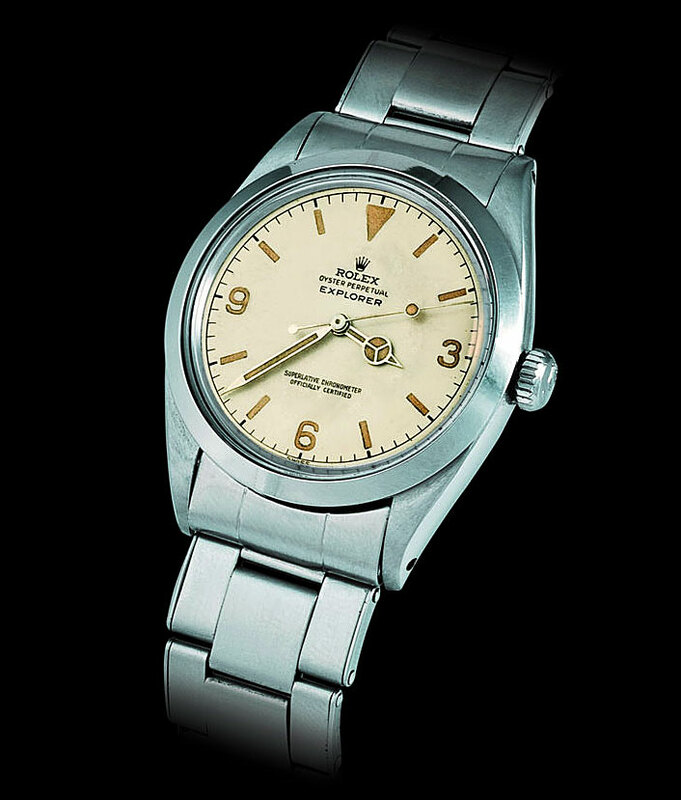 • 1956 - Rolex Oyster Perpetual Day-Date model introduced at Basel Fair first wristwatch with a day wheel complication. • 1957 - Rolex introduces the Lady-Datejust, which was the first ladies version of the Rolex date chronometer. • 1960 - Rolex second generation DEEP-SEA Special prototype wristwatch is attached to the outside of the U.S. Navy Bathyscaphe Trieste submersible which descends to an all-time record depth of 35,787 feet down into the Mariana Trench in the Challenger Deep, off of Guam in the Pacific Ocean and the watch surfaced in perfect working order. 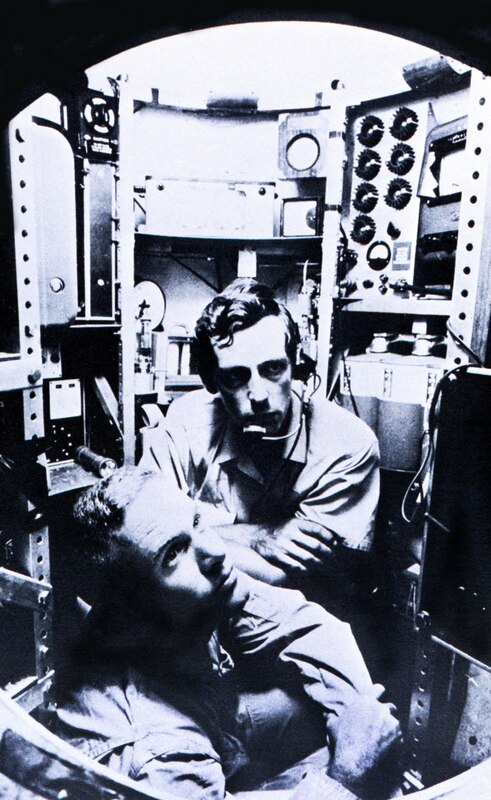 The Bathyscaphe was piloted by Donald Walsh & Jacques Piccard. 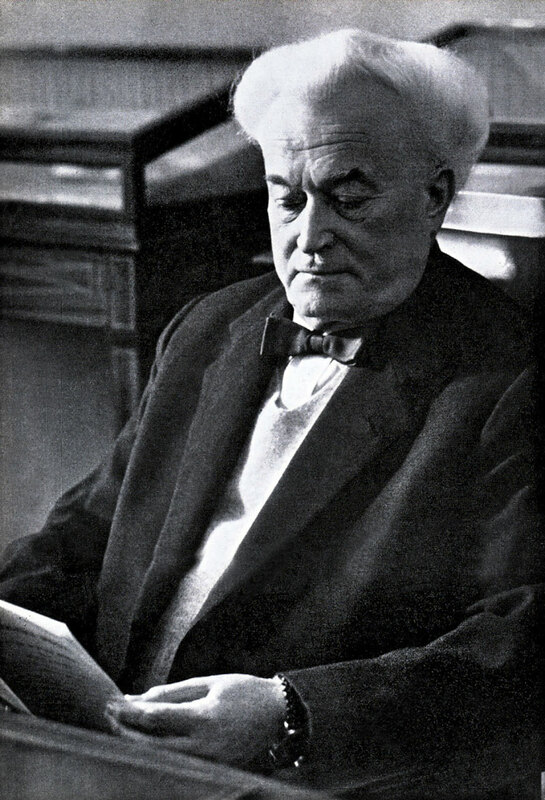 • 1960 - Hans Wilsdorf dies in Geneva, Switzerland, July 6. • 1962 - Rolex has been awarded 500,000 Official Timing Certificates for wrist-chronometers–more than half of the entire Swiss chronometer production during the past 50 years. • 1963 – Rolex introduces the Rolex Daytona Chronograph model. • 1967 – Rolex develops the Rolex SEA-DWELLER with U.S. Navy SEALAB. • 1968 - Rolex has been awarded 1,000,000 Official Timing Certificates for wrist-chronometers. • 1969 - Rolex introduces the Fliplock clasp on the Submariner and SEA-DWELLER bracelet. 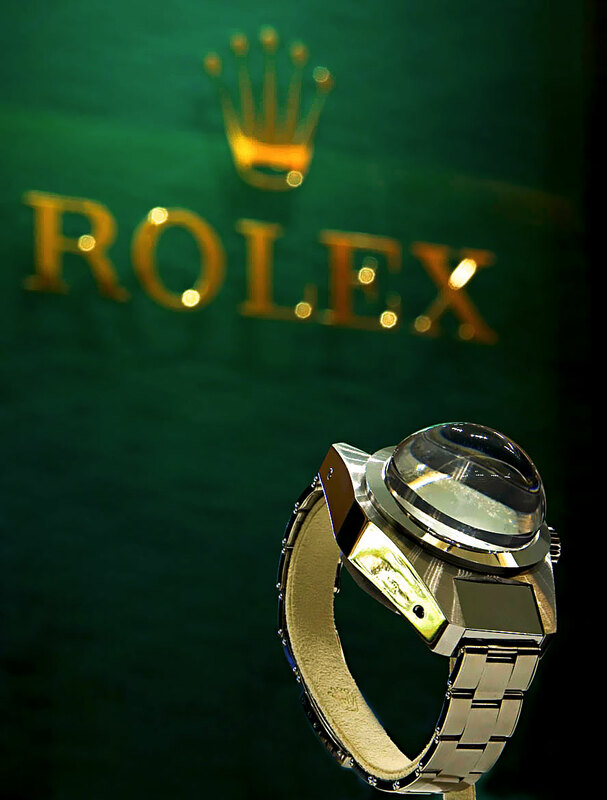 • 1970 - Rolex introduces the Triplock winding crown system which screws down the winding crown against the Oyster case to create a hermetic seal like a submarine. 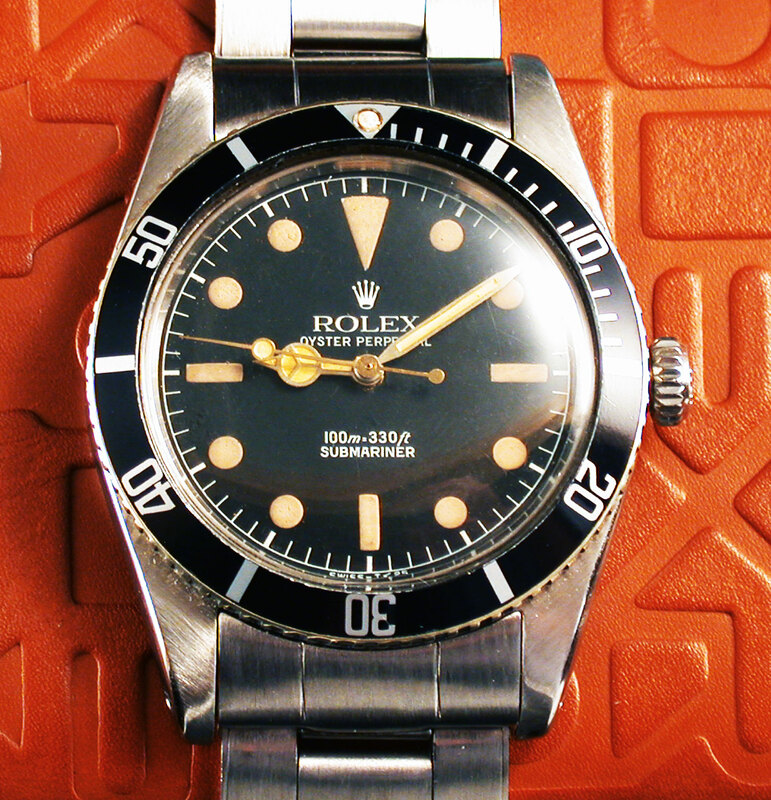 • 1971 - Rolex introduces the Explorer II with a trademark Orange Hand. • 1973 - Rolex introduces "Triplock" winding Crown with three dots under the Rolex Crown Logo, which offers waterproofness to 1000 Feet/300 Meters. • 1992 - Rolex introduces the Rolex Yacht-Master model. • 2007 - Rolex introduces the 44mm Rolex Yacht-Master II in yellow gold, which is the first Rolex to have a ceramic bezel. Rolex also introduces the white gold Yacht-Master II. • 2007 - Rolex brings back the Milgauss model. • 2010 - Rolex introduces a Submariner Date with a ceramic bezel. • 2012 - Rolex introduces the 42mm Sky-Dweller model. • 2015 - Rolex introduces the Superlative Chronometer Standard which offers a guarantee that all new Rolex watches will perform to a standard of -2/+2 seconds per day. Rolex also increases all Rolex Warranties to 5 years standard.